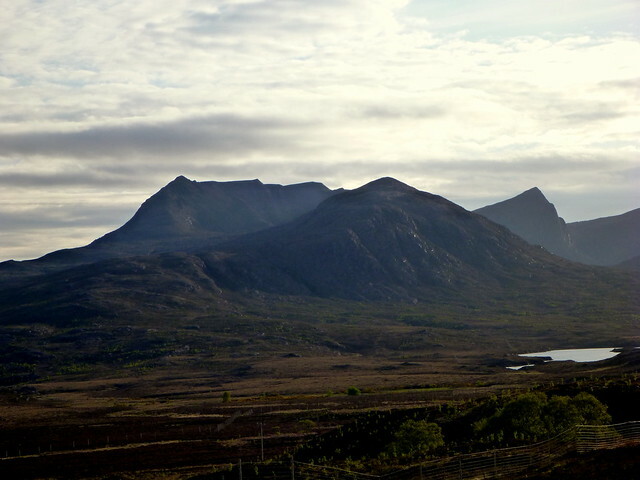 Several consecutive boyhood holidays to Assynt in the 70s had inoculated me with a love of this part of Sutherland, particularly the mountains, which I hadn’t climbed, but loved to gaze upon. 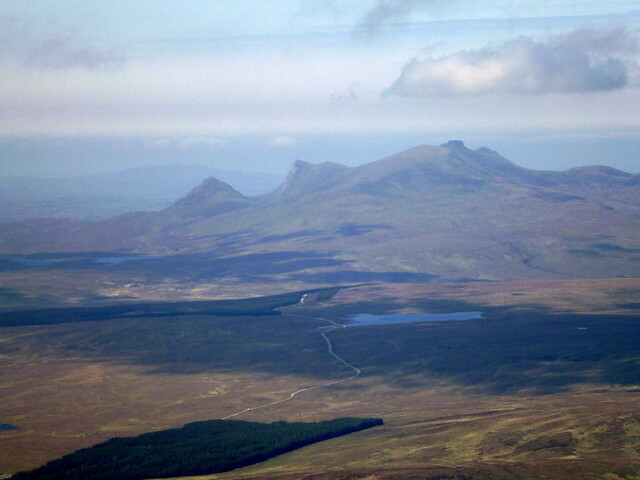 Visits back in more grown up times had gained me Klibreck (my first Munro) and Hope 20-odd years ago, but the rest of the hills remained untouched by weasel-foot. 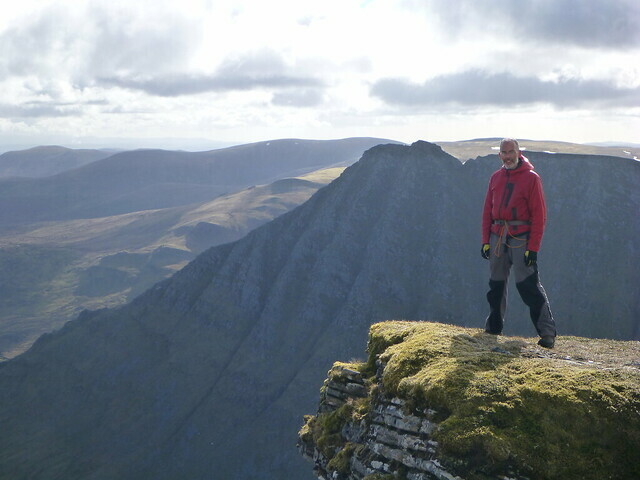 So when the chance of getting a week off to climb and camp came up, where else to go but up North. 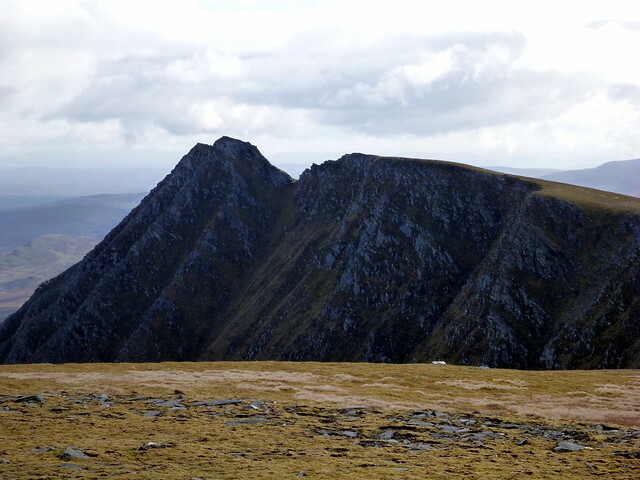 With a couple of days to go, I was looking to see if there was a way of getting more Munros in and noticed that it was possible to add Seana Bhraigh onto the Beinn Dearg 4 without too much inconvenience. One more for the pot. 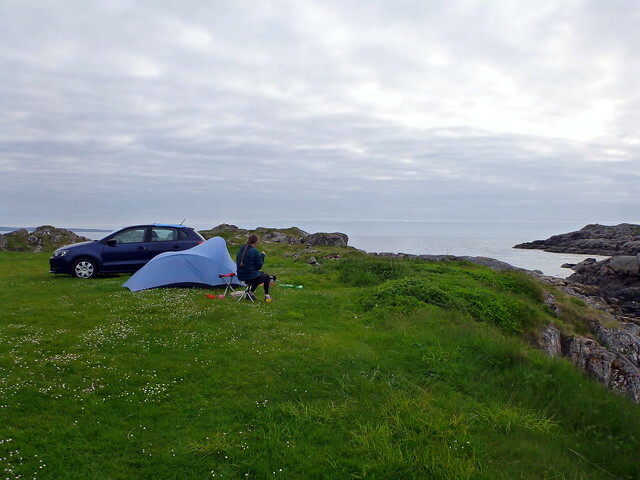 We’d never camped for this long before, but having the car with us at most of the planned stops made the question of food and kit supplies easier to manage than if we’d been walking continually. Really didn’t know if the muscles and bones would hold out though, nor if we’d drive each other insane with 9 days of unbroken time together. Managed to get away from work a little early on the Friday afternoon, having loaded up the car the night before with all manner of walking and camping related stuffs. Weather was fine and the roads surprisingly quiet for a Friday evening, with the exception of a bit of delay at roadworks on the Kessock Bridge. 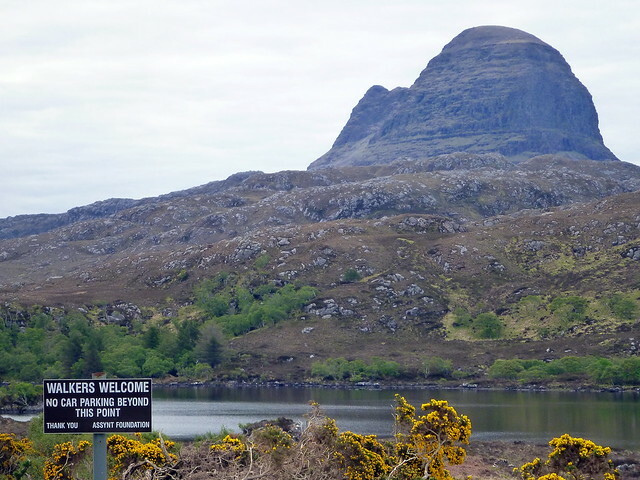 We had decided to stop at the walkers car park at Inverlael and do some of the walk in to Seana Bhraigh when we got there, camping at a suitably flat location between Eididh nan clach geala & SB. 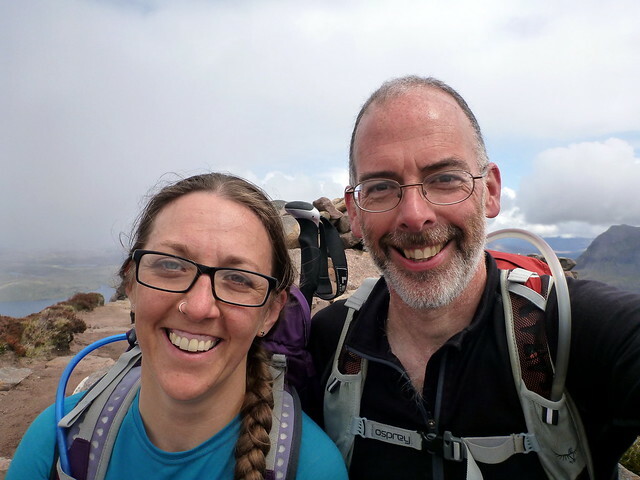 We were both in high spirits at the start of an adventurous week and made 10k before we decided to pitch camp. 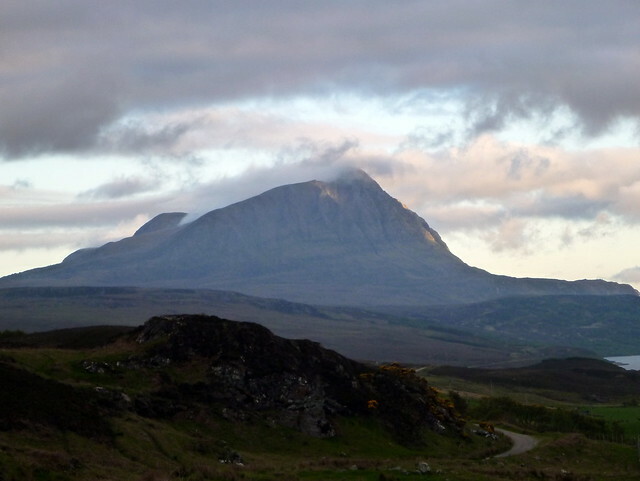 By this time the early evening sunshine had been replaced by mid evening clag and the temperature had fallen considerably. We could hear deer milling around in the fog and at one point all these little deer heads poked up around us in a wide circle – reminiscent of the scene with the masks in The Wicker Man - spooky! We got pitched and I was bemoaning the absence of my 4 season sleeping bag – we were at about 750m elevation, near Choire Ghlais. After a chilly night and fitful sleep we rose early to a sunny morning and set off early to SB. We decided to leave the packs in the tent and go unladen, which was welcome. 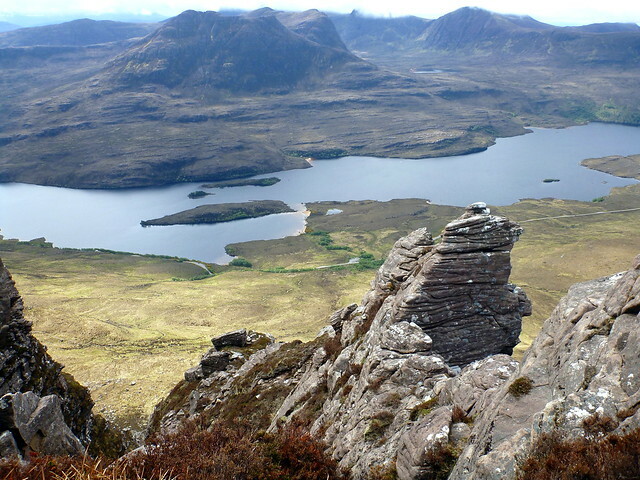 I also decided to have a wee whisky at 7am to see the day start well and chase the last vestiges of chill away– not a habitual occurrence before a hillwalk, mind! 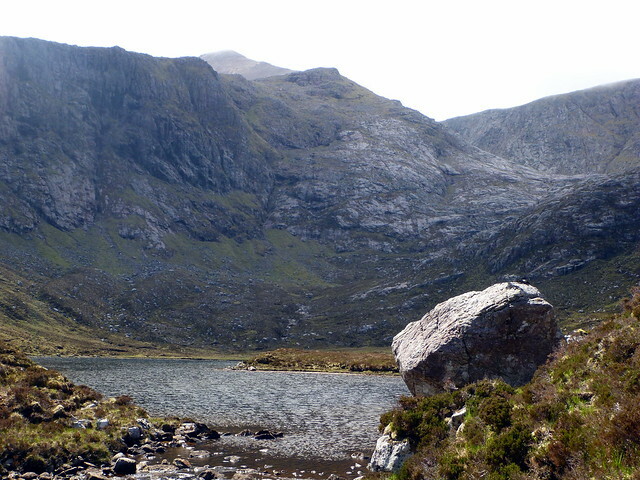 There was a longer walk round the impressive Coire Dearg than I’d been anticipating and it took us more than an hour to reach the first 904m top, not helped by my choosing a route that ended in steep crags and had to be reversed. 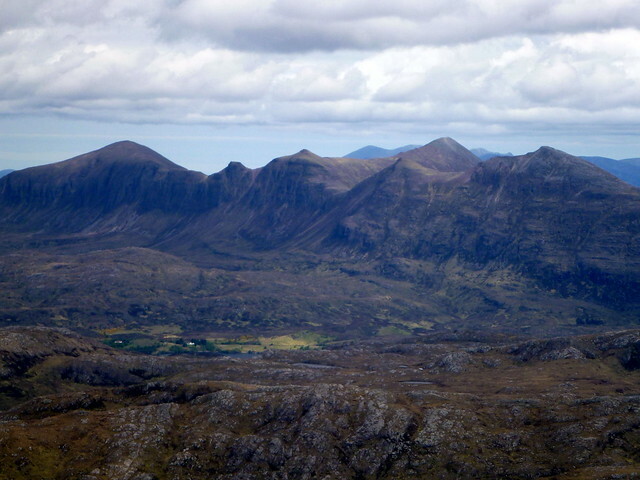 Finally we made the top of SB and were rewarded with some tantalising views of the hills along the west coast including Stac Polliadh, Suilven and co, which we’d be visiting later in the week. 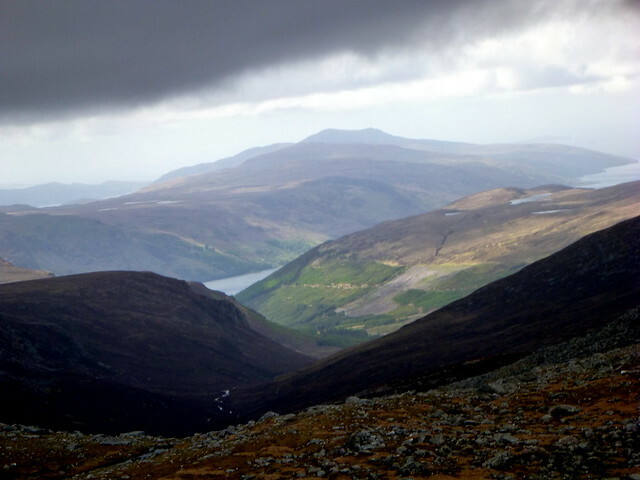 To our right was the steep dark bulk of Creag an Duine with views down to Loch Luchd Choire. 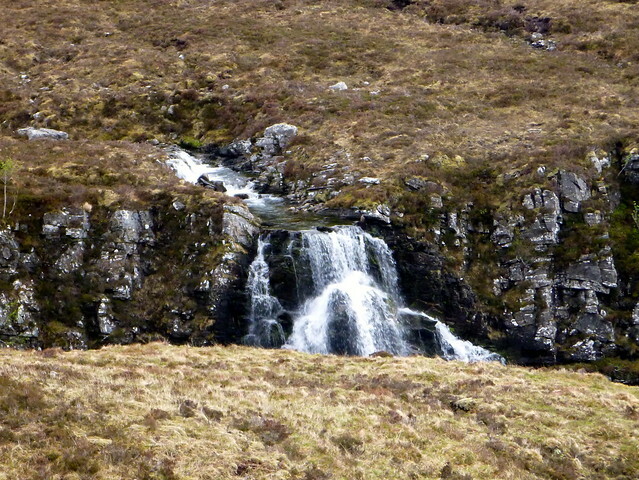 We retraced our steps, stopping to have a drink from the crystal clear streams alongside the footpath. 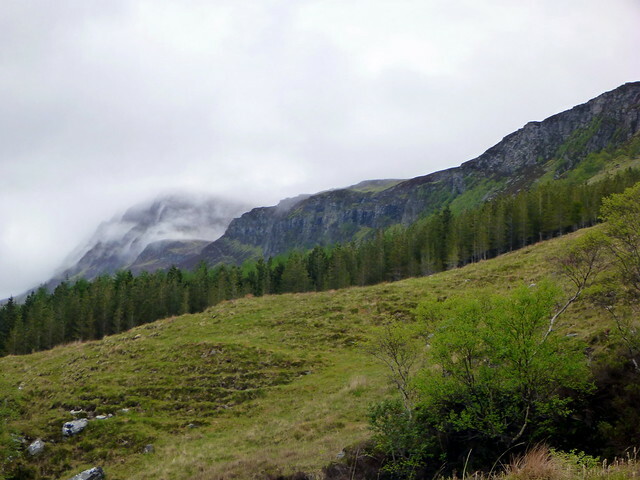 Relieved to see our little tent still there where we’d left it, we packed up and set off for our next target, Eididh nan Clach Geala, watched by a pair of deer who steadfastly maintained their gaze and position as we walked around them. 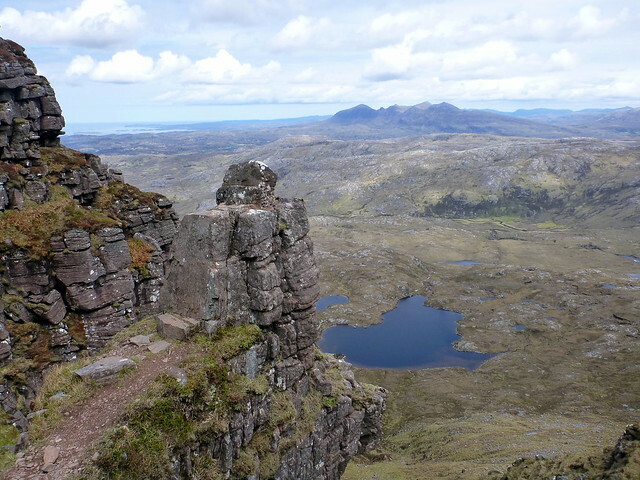 We got to the top of An Socach then descended to the bealach before the final stony pull up to the rocky top of EnCG. 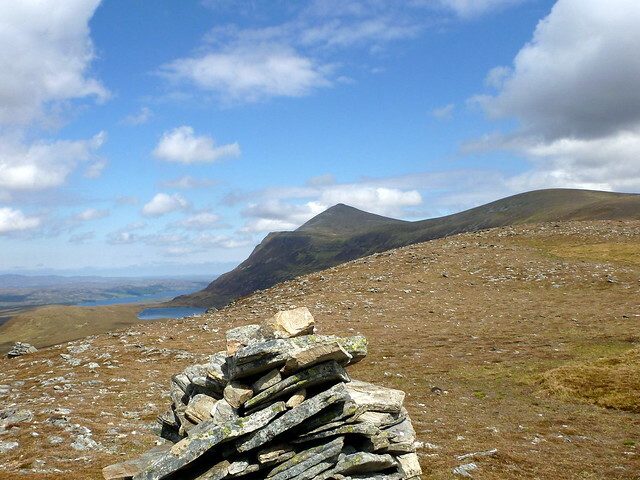 There are 2 summit cairns, the eastern one being the higher. 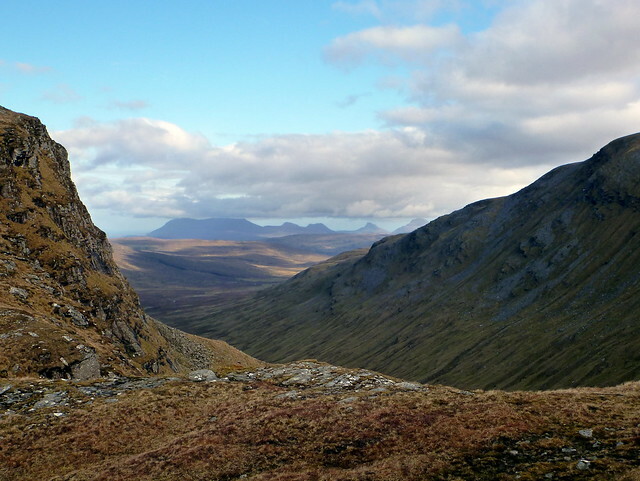 Whilst we looked around we were joined by 3 other walkers who’d come up the steep side of Creag an Duine from a bothy on the other side of SB. As we chatted, it turned out that one was my nephew’s maths teacher – small world or what! 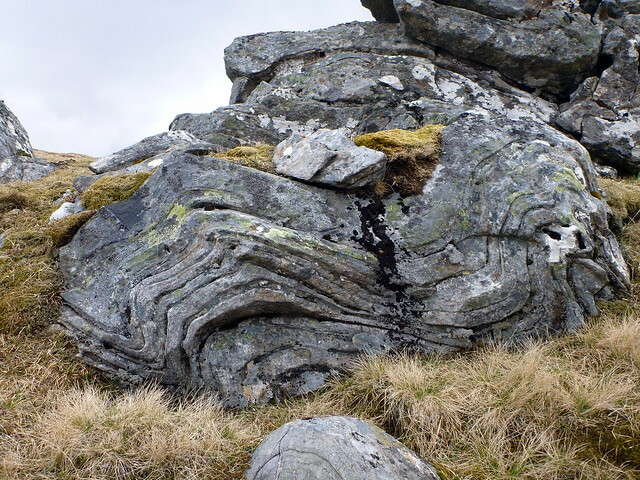 We headed down the shoulder of EnCG to the small lochans where we had a piece beside some rocks veined with tortuous, compressed strata. 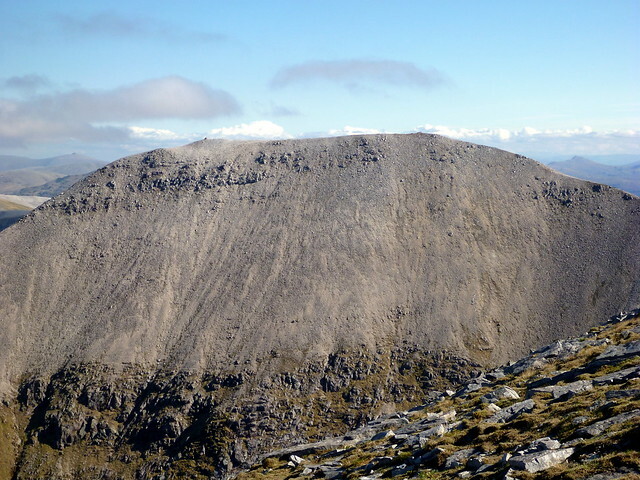 Then up the stony side of our next target, Meall nan Ceapraichean over the top of Ceann Garbh – this was a pimple of a peak from this angle, hardly distinguishable amongst the rocks on the summit curve. 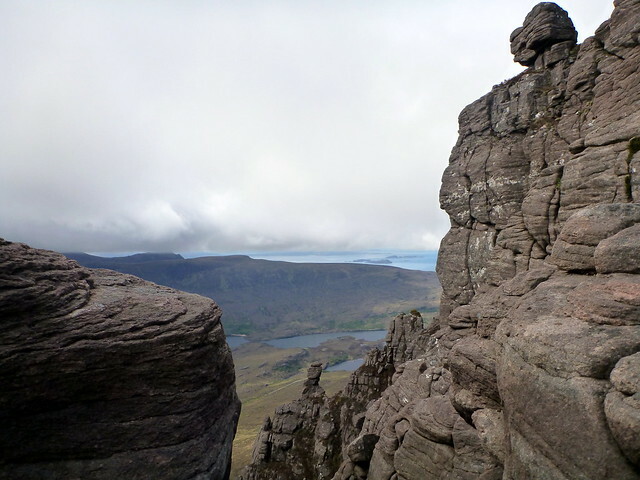 We could see the rain coming in from the sea – wouldn’t be long before conditions deteriorated. 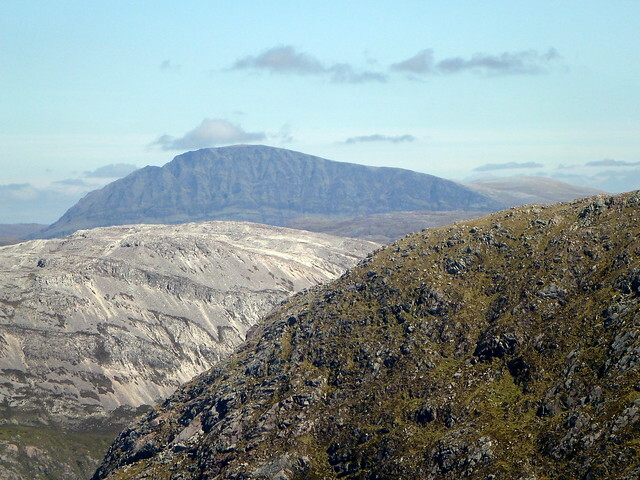 Ahead we saw the imposing bulk of Beinn Dearg steep with patches of snow still clinging on, and a stone wall going most of the way to the summit. 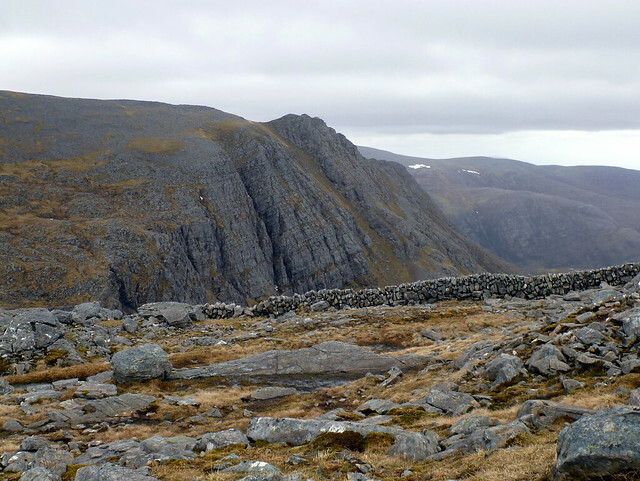 We descended to the Bealach nan Lochain Uaine and got ready for a bit of steep scrambly movement up BD, following the line of the wall and meeting “Hillwalking Eddie” from Finland. 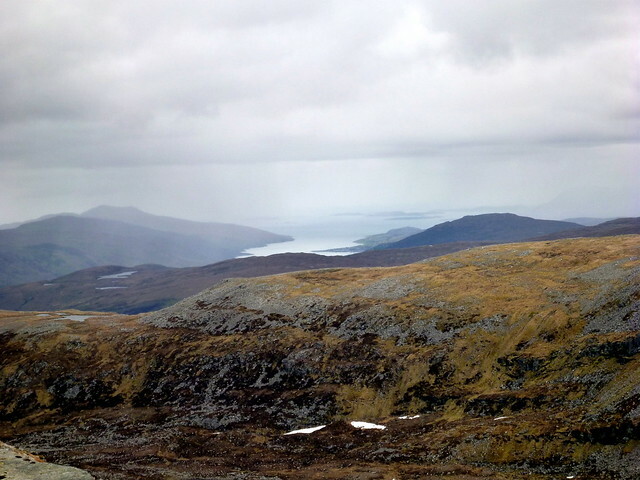 We dumped our packs about halfway up the path which made the last section much easier in the wind and drizzle, made the top with no views and headed back down, picking our way gingerly over the slippy terrain. 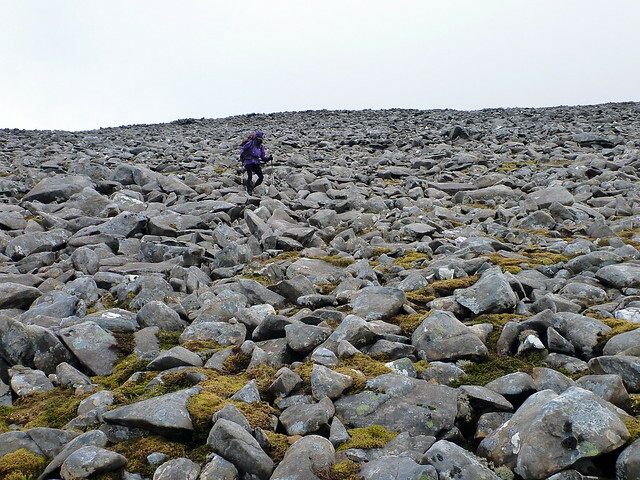 Re-joining the path at the Lochain we made for out final hill of the day, Cona’ Meall, which sloped off to the east, a boulder strewn plain. 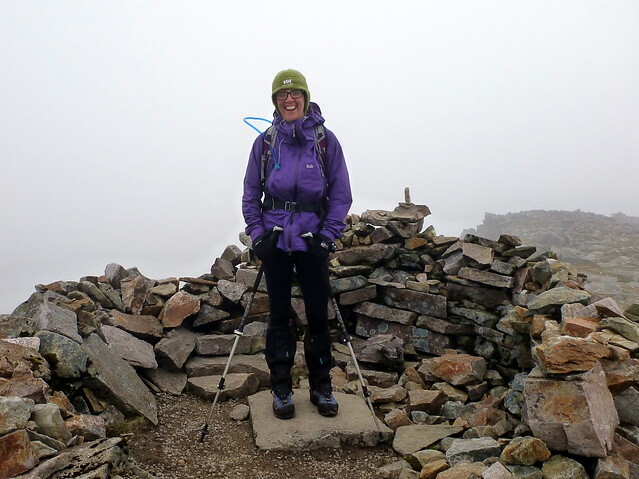 Allison was finding this terrain challenging as she’d got blisters on both of her heels from her new lightweight “incredibly comfortable” summer boots – I was annoyed that she hadn’t broken them in beforehand and worried that this would threaten the plans for our week – but give her her due, after the application of a couple of Compeeds she didn’t complain. 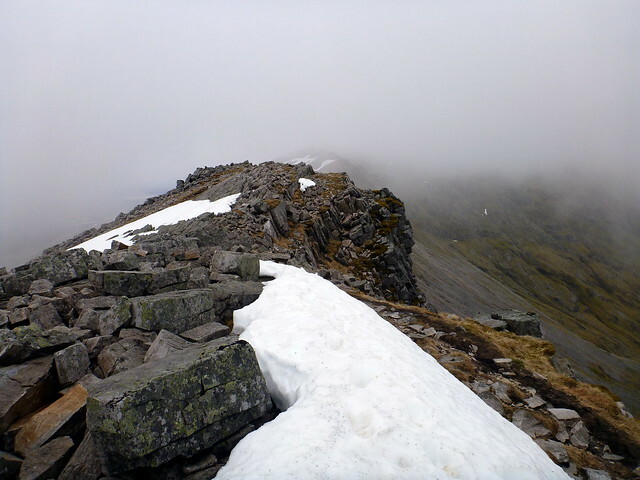 We were cold and tired by the time we did get to the peak and had a look down the steep drop over the eastern side of the hill, still with a collar of snowy cornice intact. 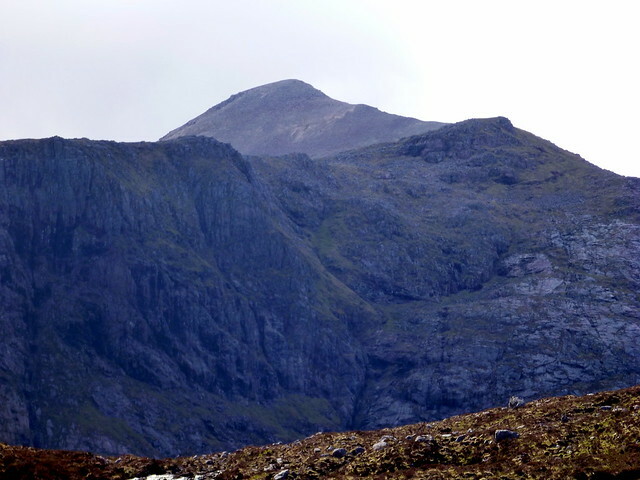 Back down to the bealach and then following the course of the Lael river along the valley between BD and MnC, which looked more imposing from this angle. 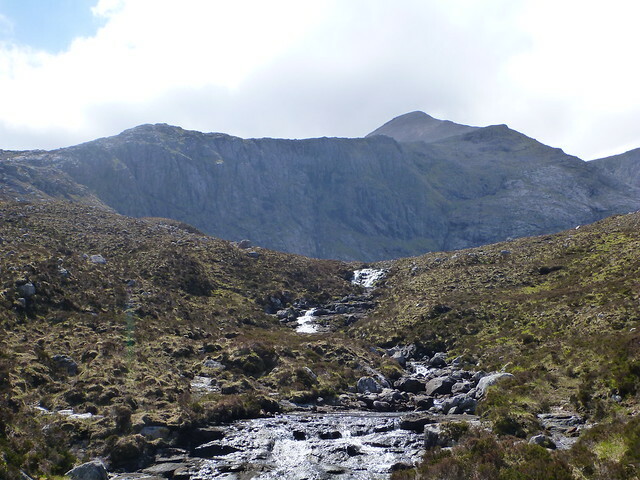 The path was good and took us alongside a couple of impressive waterfalls which roared away with a fast flow. Making a reasonable pace with tired legs we returned to the track through the forest that returned us to the walkers car park at about 6pm. 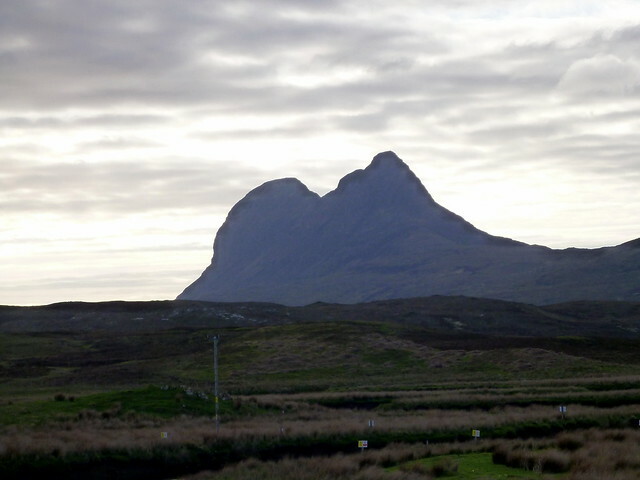 We drove to Ullapool, hungry and cold – stopping off at a chippy for a fish supper devoured in the car given the cold evening. 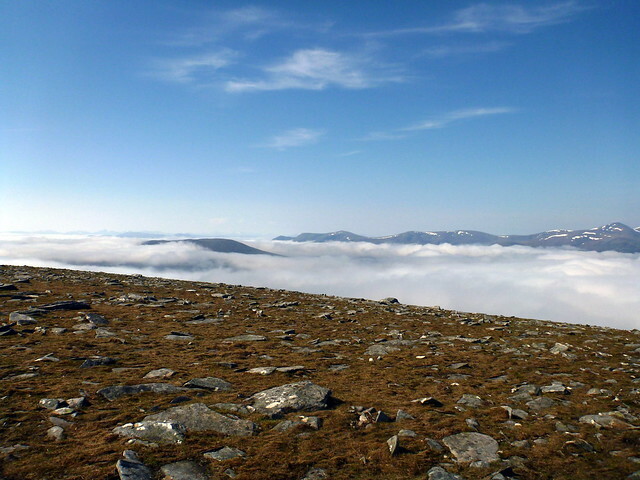 Our plan was to drive to Inchnadamph and find somewhere suitable to camp for the night before tackling Conival/ BMA on the Sunday. 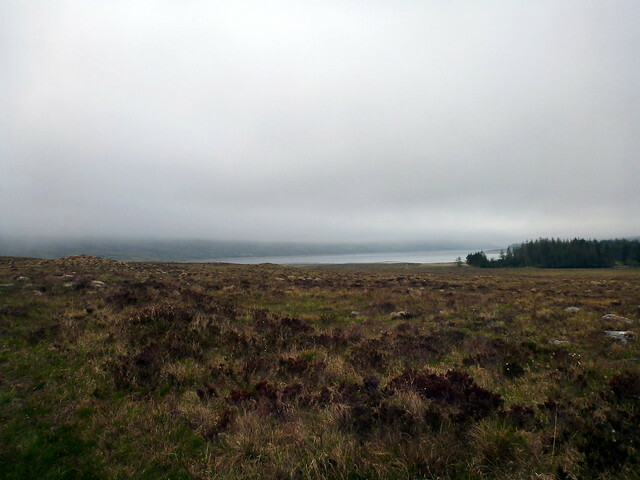 Low cloud meant there was little opportunity to enjoy the landscape on the drive up. 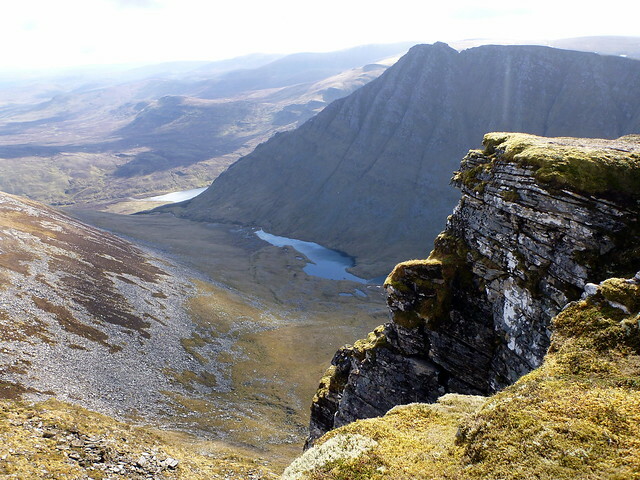 Passed the Inchnadamph Hotel and thought of going in for a pint, but a look through the lounge window revealed a very “tweedy” clientele, so we gave it a miss. 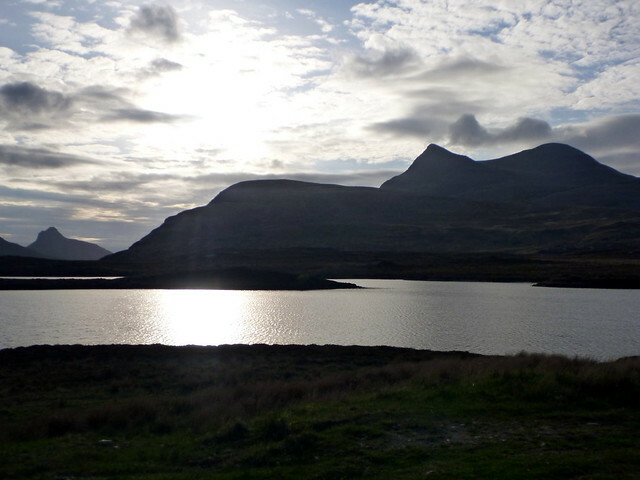 I decided to pitch somewhere around Ardvreck Castle – a picturesque little spot, albeit haunted by several different ghosts if the info plaque beside the castle was to be believed. This included a lassie that had wedded the devil to spare her father some grim fate and had drowned herself in the waters beside us. 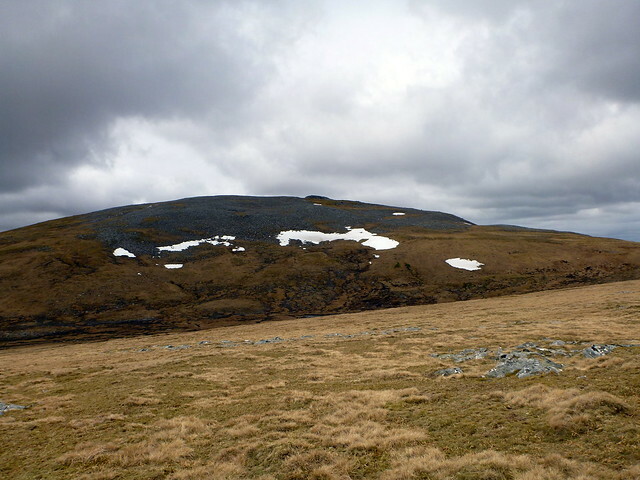 We had a hunt around for a suitable pitch and settled for the comparative shelter of a ruined broch beyond the castle. We didn't experience any ghostly activity overnight, but I was wakened, with a headache, by some French tourists at the castle before 8am on a damp Sunday morning – I ask you! 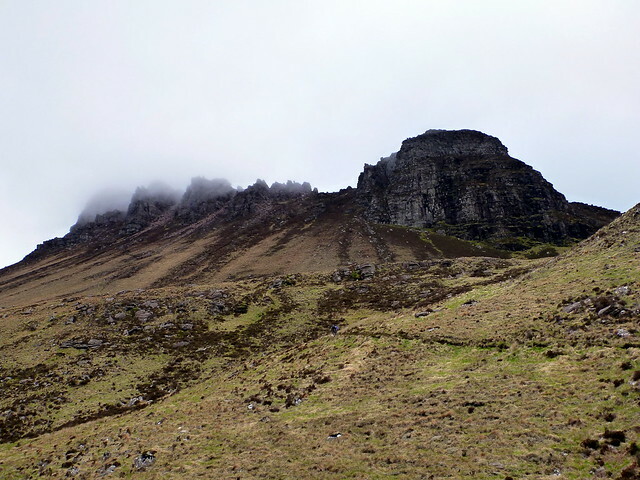 Clouds were low and we were both tired, so lay low for another couple of hours before getting up – during which time the castle proved popular with a succession of visitors, making us glad that we’d not pitched any nearer the castle ruins themselves. 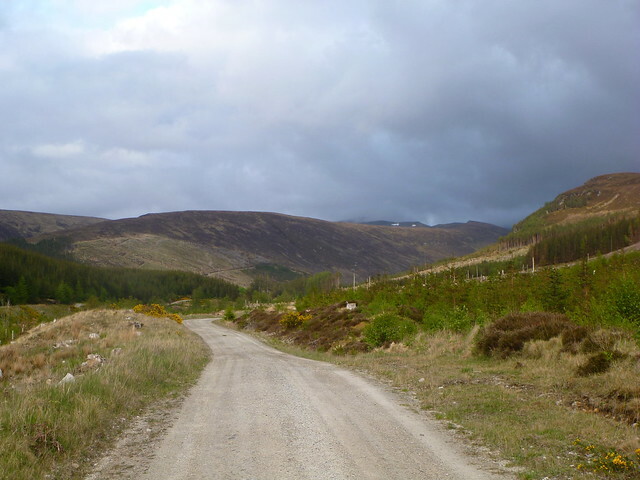 Finally we got going and drove back to the car park at Inchnadamph. 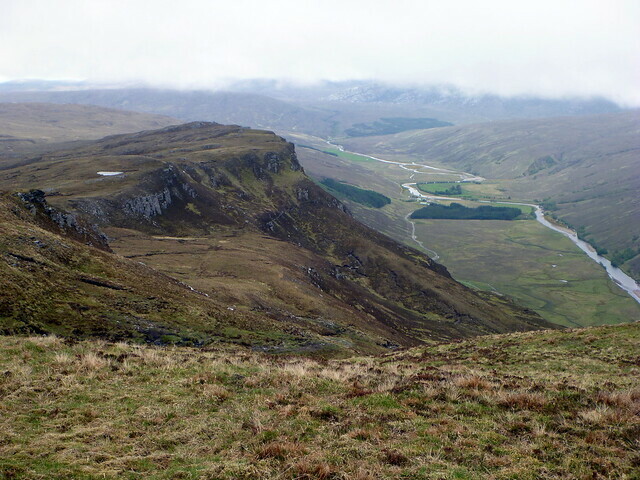 The sky was heavy and overcast, with clouds lying along the top of Conival as we headed up Gleann Dubh, leaving the track to contour to the north of the river Traligill towards Conival, which looked steep from this angle. 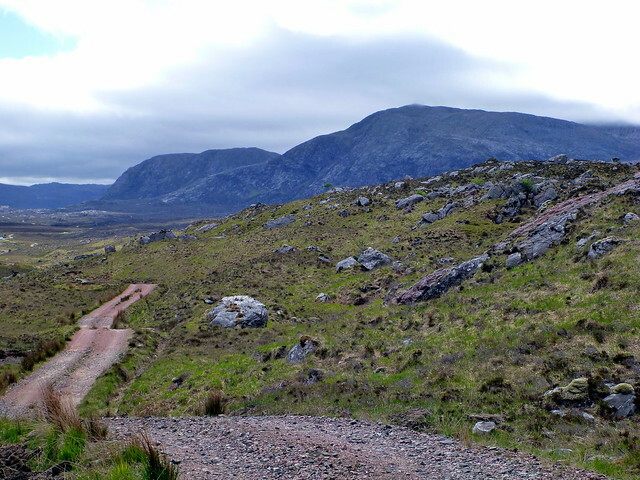 There’s a path following the stream Allt a Choinne Mhill up the side of the hill before reaching a flatter rocky area. 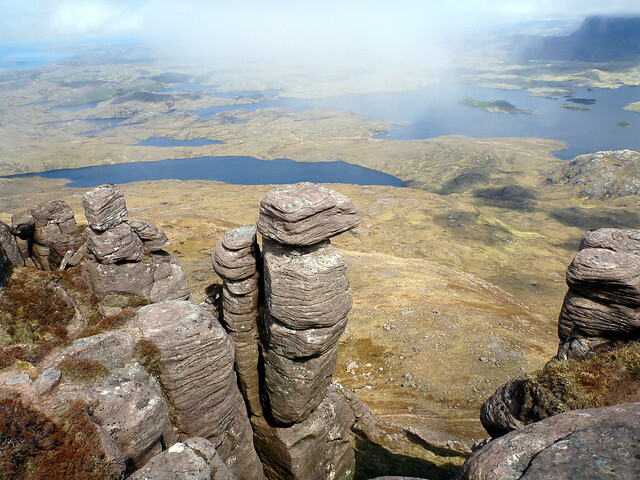 Rough stones all the way up from that point, views along Loch Assynt with the mountain tops concealed under a layer of cloud. 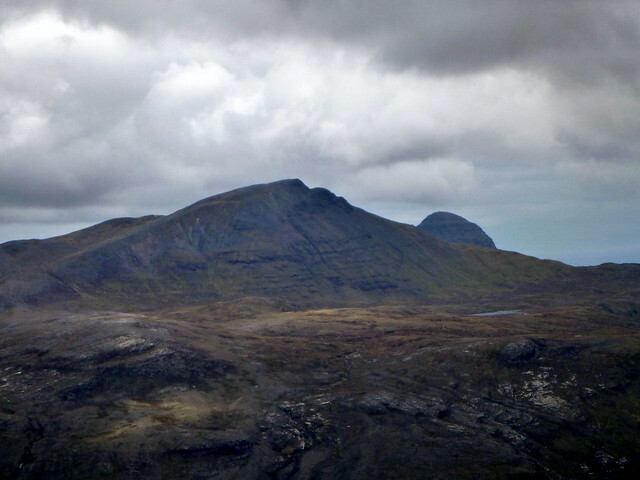 Made the top of Conival as the clouds came down, but this didn’t obscure the lengthy ridge leading towards Ben More Assynt. 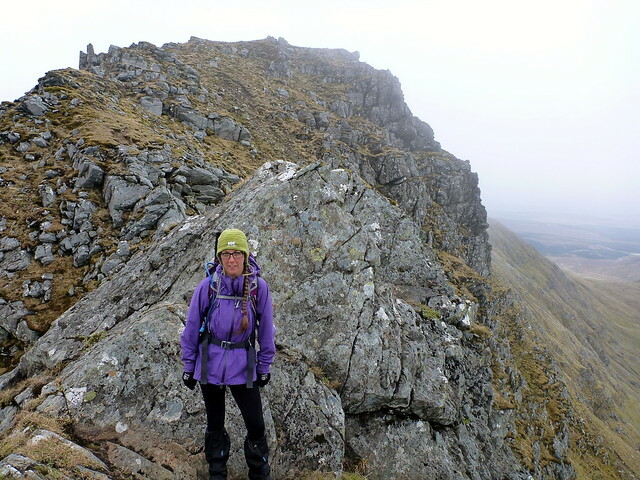 This was a bit of fun – a small scrambly section down onto the ridge then an interesting walk along the narrow ridge edge, with patches of snow still intact. The temperature had fallen a bit and the wind significantly more blowy than the 10kph forecasted, though not strong enough to be a problem. Met a few other parties returning along the ridge as we finally got to the jaggy peak. 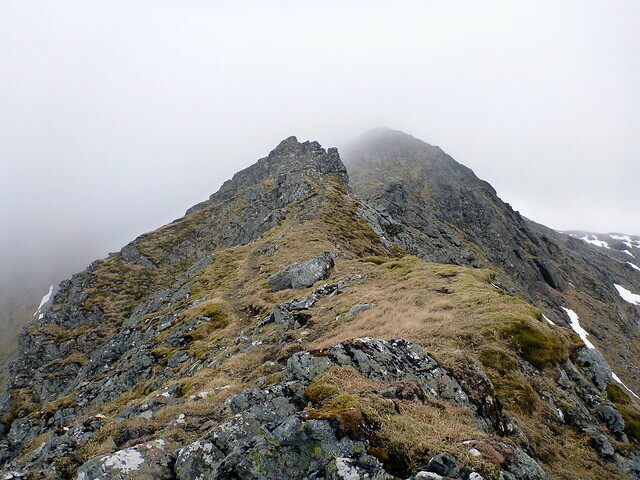 I’d read about the south ridge and although I had no intention of coming off the mountain from this direction, thought a walk along might be useful in boosting our very rudimentary scrambling skills. 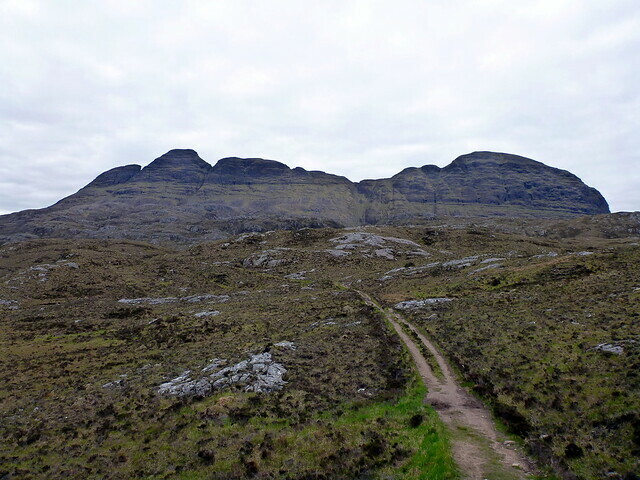 The path was narrow with significant exposure in places, but I was enjoying the experience. 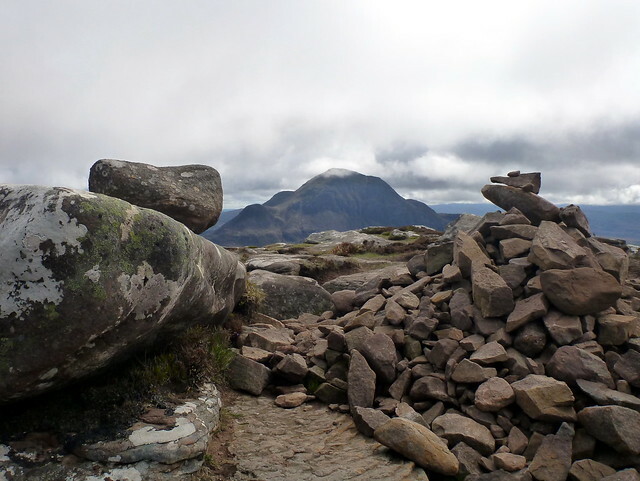 We got most of the way along until we were met with a large rock blocking the path, with no way round on either side due to the steep drops – which meant climbing up and going over it. I managed this quite comfortably, but Allison bailed at this point and asked to go back. 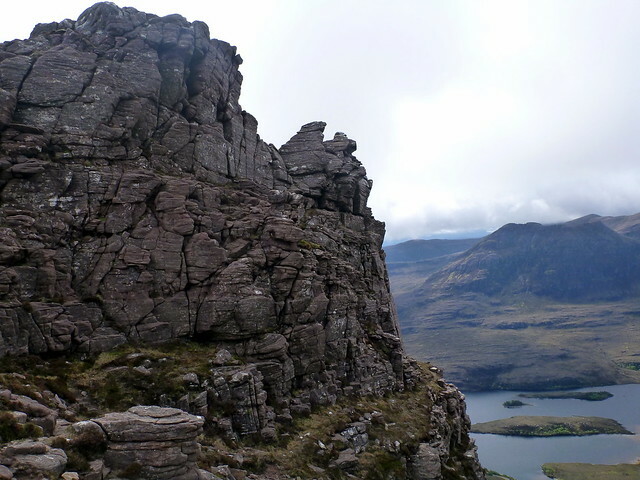 This meant I had to return backwards over the rock, struggling for a foothold over a considerable drop. This was the first time I’d felt scared – I knew I had to get back round and only I could make this happen. 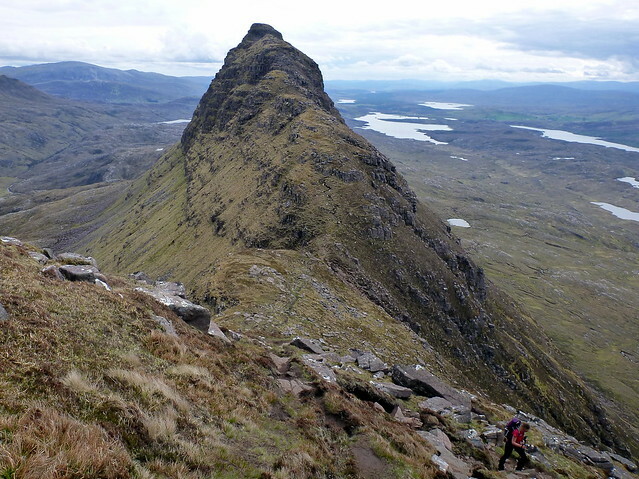 Fortunately it was easier than I feared and I was soon back on the path as we headed back to the north peak of BMA. 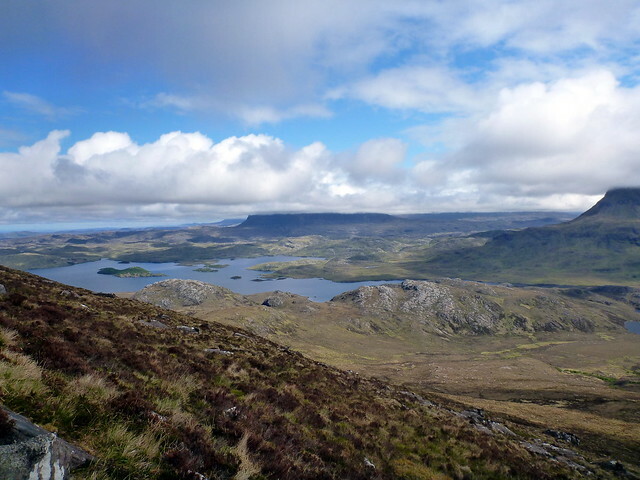 We retraced our path without event, enjoying splendid views of the “hanging wall” of Na Tuadhan to the north of Conival. Back down into the valley for a gentle walk back to the car, deciding not to detour to the bone caves over to the south of the river due to sore feet. 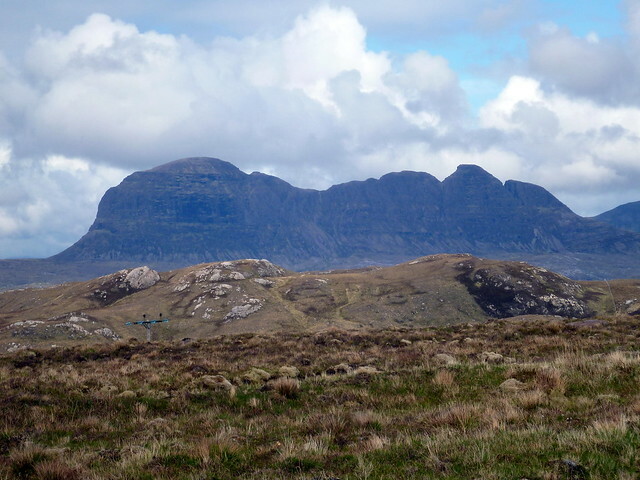 Drove down towards tomorrow’s target, Stac Pollaidh with the sky clearing making for some stops to take pictures of the sights of Quinaig, Cul Mor & Cul Beag, Ben More Coigach and of course, the Stac herself. 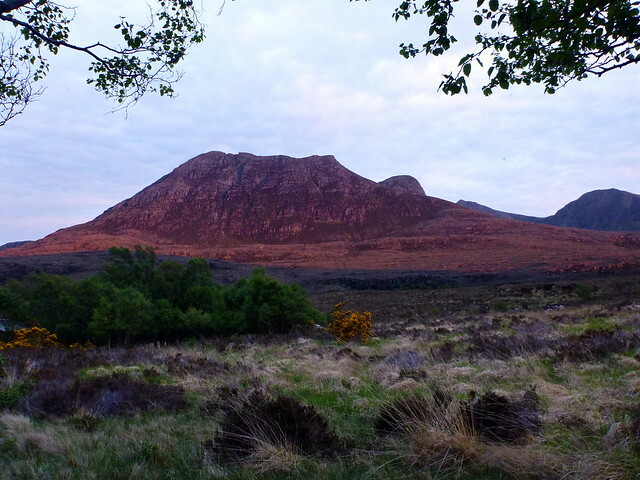 We got to the ample car park below SP and found a spot to camp down in the shelter of a circle of beech trees – ideal apart from the midges and, as we found out in the morning, an invasion of ticks. 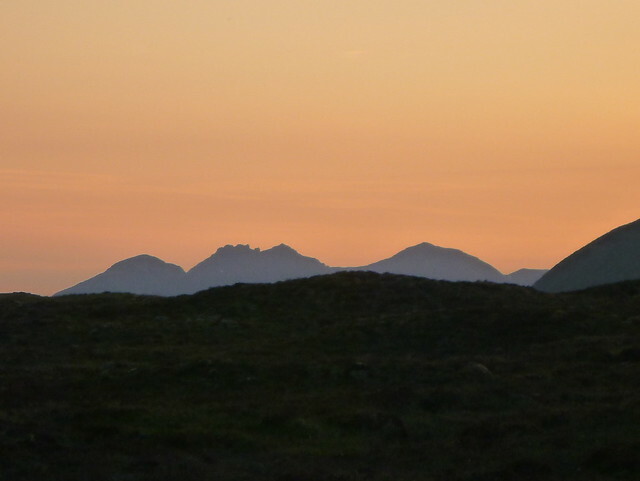 Watched the sun go down, turning the north face of Ben More Coigach an incredible glowing red. 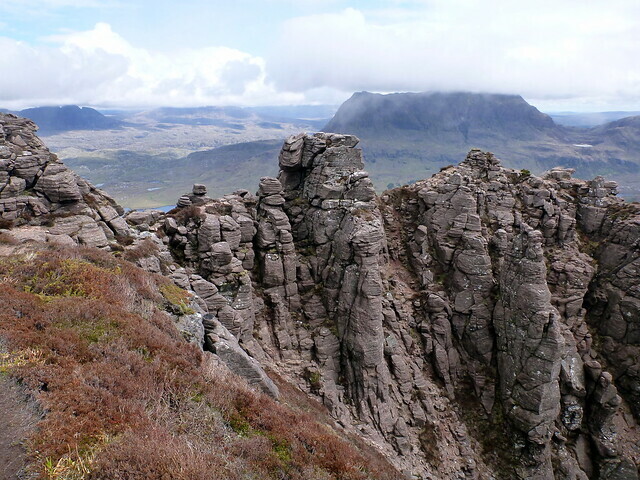 Today was designated a “rest day” to recover from the walking of the previous two with a bit of scrambling fun on the Stac. 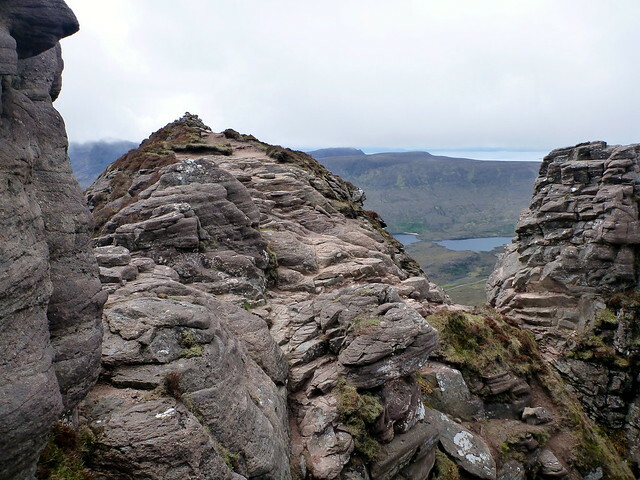 After removing a large number of very small ticks which had appeared overnight we headed up to the very busy car park and prepared for the Stac. Unfortunately this included me shutting the car boot on my forehead, with a resultant cartoon “egg” bruise appearing instantly. Damn! 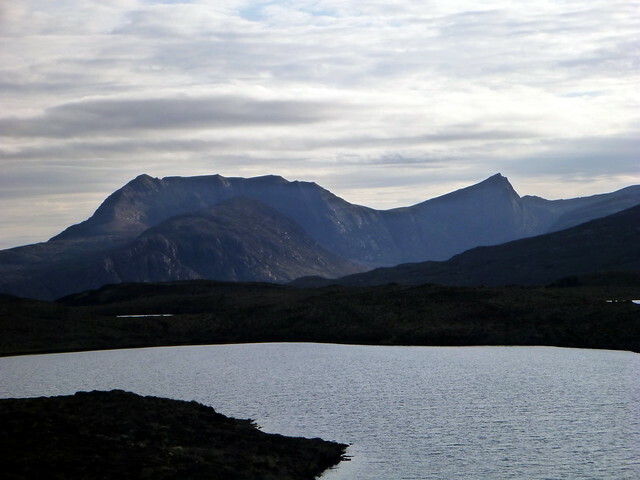 We made our way along the path to the east top of the hill, the pinnacles shedding the last of the morning mist as we ascended and Loch Sionasgaig glowing azure in the sunlight. 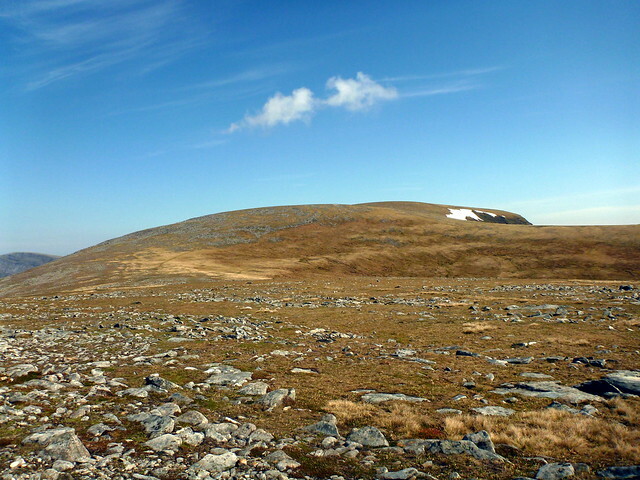 There were several parties of walkers making their way around the circuit of the hill, but no-one else appeared to be up on the traverse or the west top. 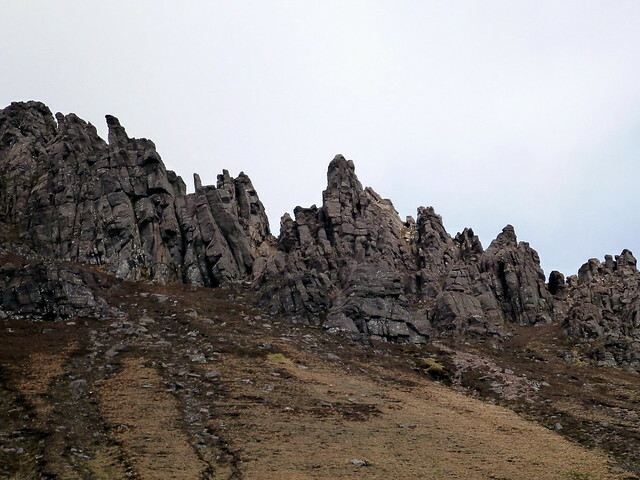 There are a profusion of paths wending around the weirdly shaped pinnacles and we had a scramble up a rocky slope to get there. 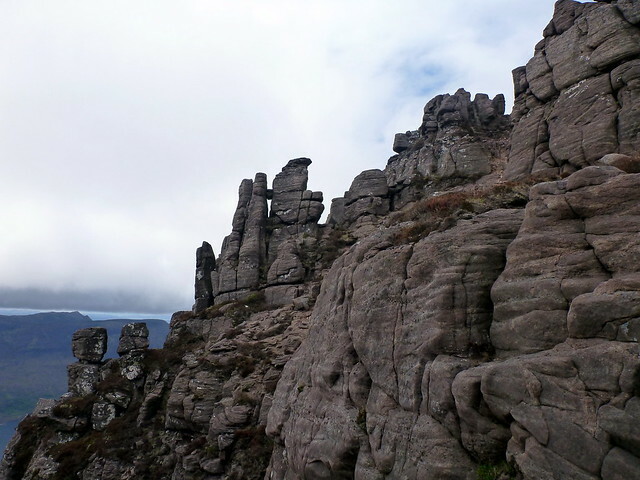 Strange eroded and pointed rock forms predominated, like nothing I’d seen on a mountain before and we both had a great deal of fun following one winding route then another. 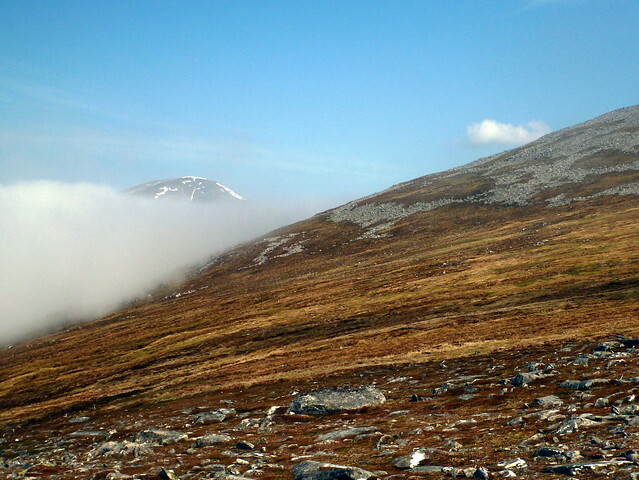 The famous “Lobster Claws” came into sight then we were faced with how to get to the west summit itself. Finding our way blocked we descended and took a path lower down that bypassed a challenging section then headed out onto the most westernly-but-one spur to enjoy some fine views and have some well earned snacks. 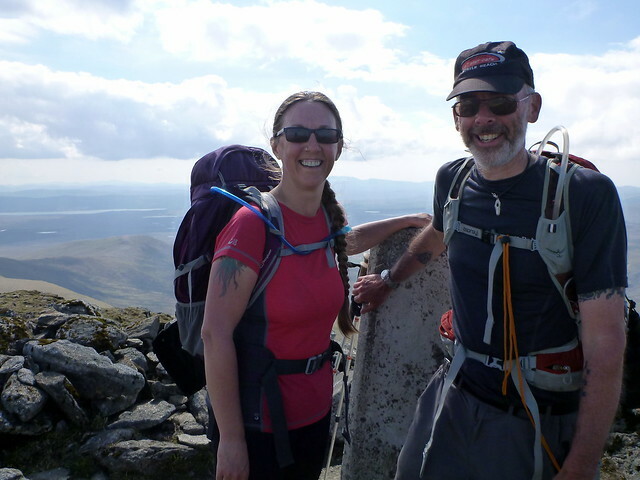 There was a great sense of exhilaration even if we hadn’t made the true summit. 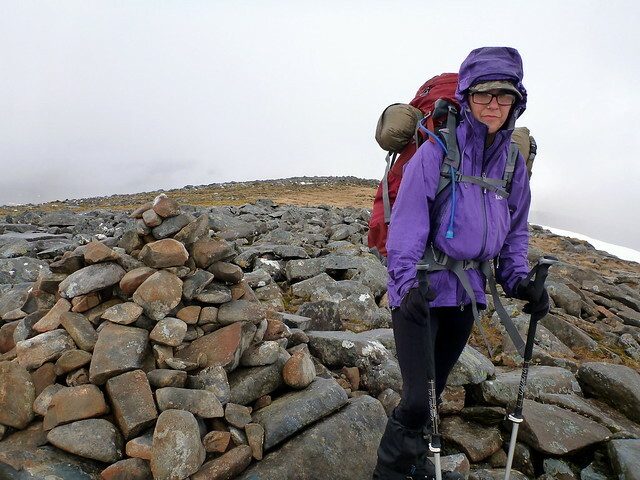 We decided to head down the steep zig-zag path going down the north side of the hill, Allison mostly on her derriere and raising my ire by sending scree down the slope below her. 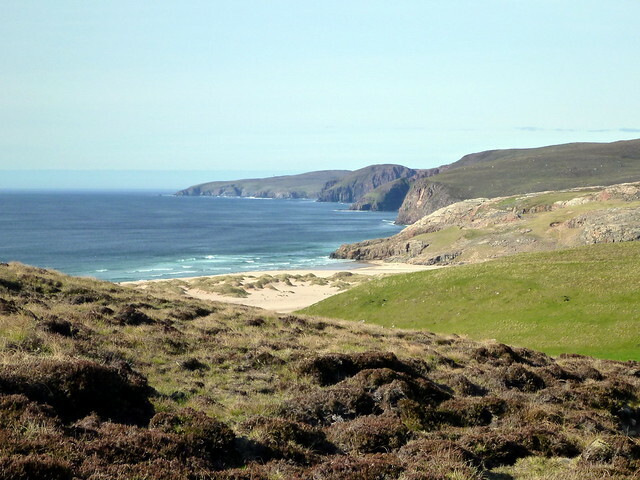 We got to the path going round the base of the hill and wandered back to the car park, roasted in the hot early afternoon sun. 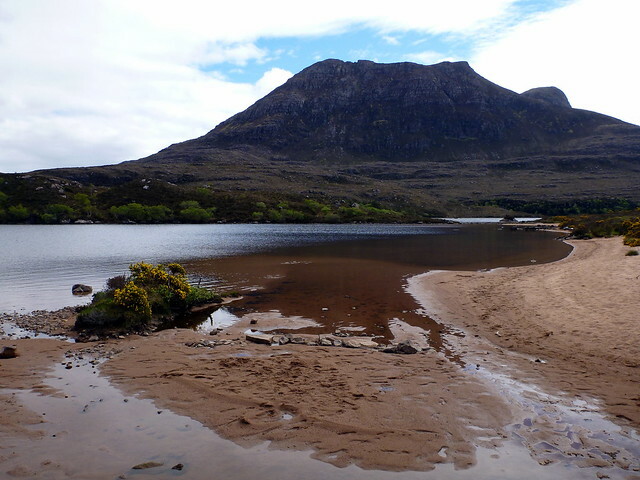 We gathered up our lunch things from the car and headed down to a wee sandy beach on Loch Lurgainn where we had a very shallow dip to cool off. 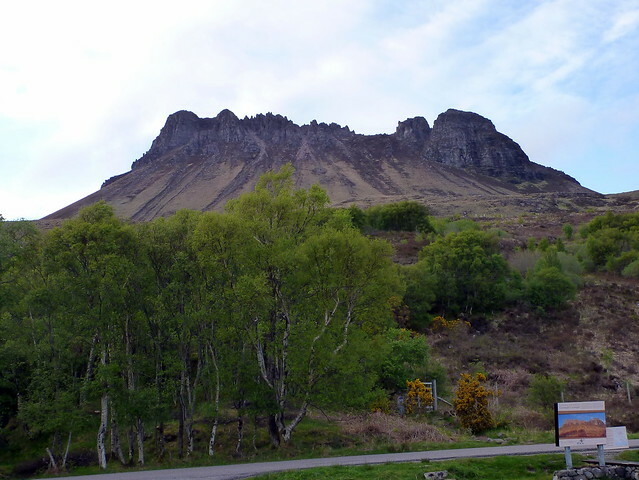 Back up at the car park we found all the available spaces taken and a large contingent of German bikers making plans for the rest of their day "Ve vill meet at Scourie". 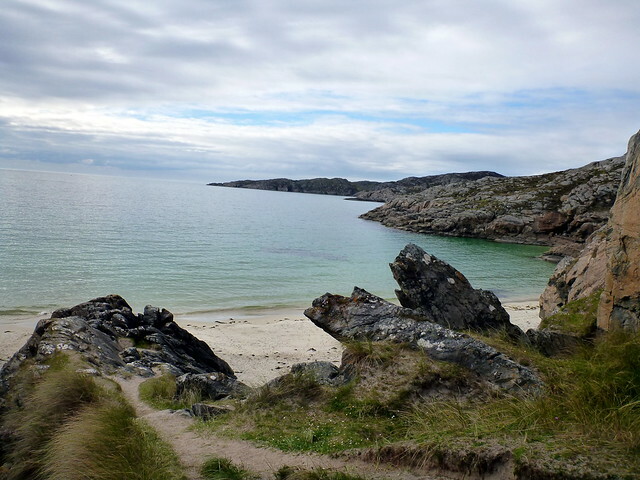 We headed off to Lochinver for petrol, supplies and some beer which we took along to Achmelvich beach and enjoyed by the water’s edge. 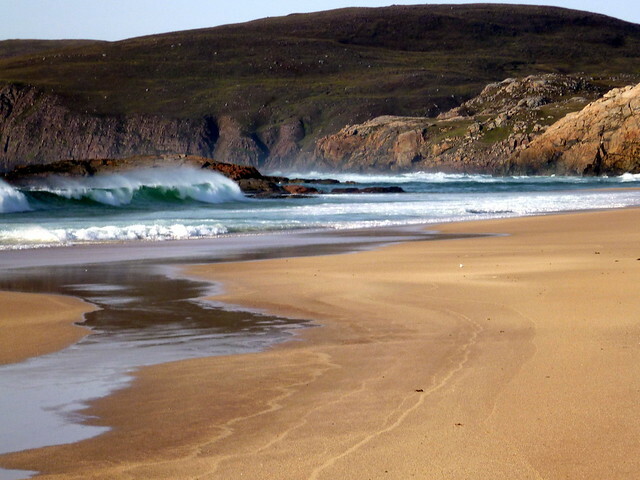 This was a favourite childhood haunt - I spent countless hours watching the waves, building sandcastles or scrambling across the rocky sides of the bay as a boy. The afternoon sun was beautifully warm and it was lovely just gazing out to sea and listening to the lapping of the waves with no-one else around. Allison had requested that we do at least one “camp-site” overnighter as opposed to wild camping so that she could have a shower and we therefore decided to stay at Achmelvich campsite – which was fine as we didn’t have a dog with us – the website had warned that no dogs were tolerated, and the lady at the office was equally insistent that no canine companions were to be allowed. 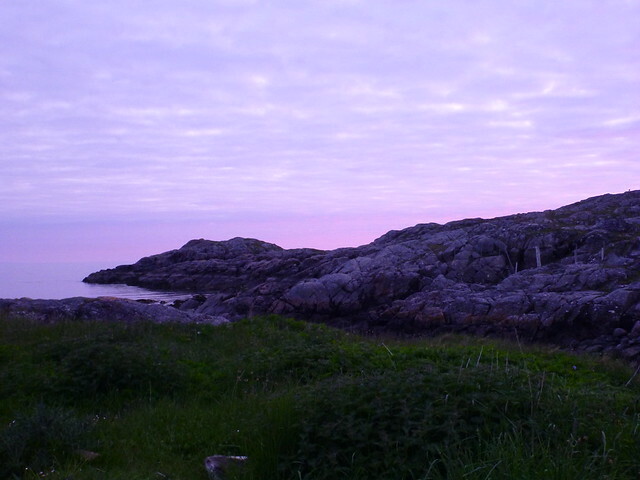 This not being an impediment, we pitched over by the edge of the site beside the sea. 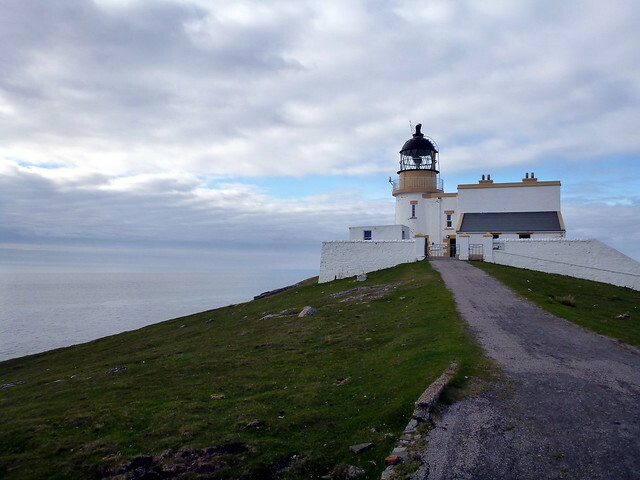 It was still only late afternoon and I decided we’d take a drive along to Stoer and Raffin Lighthouse, more places from my memory banks. 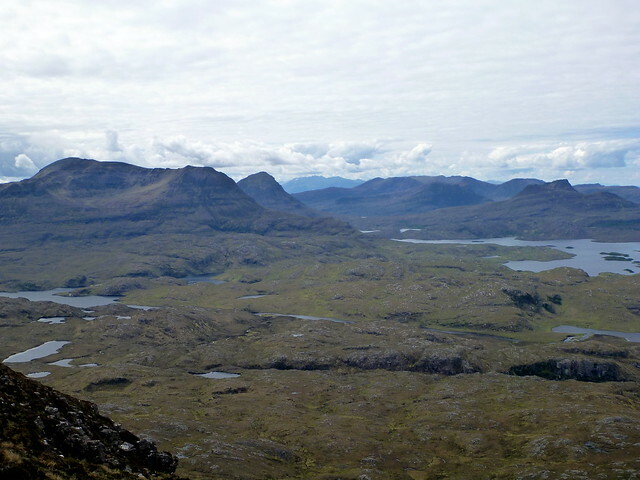 Looking out at the white scree slopes of Foinaven and Arkle from Clachtoll, then of the line of hills poking like deformed fangs from some monstrous mouth from Raffin I felt so excited and privileged to be up here. 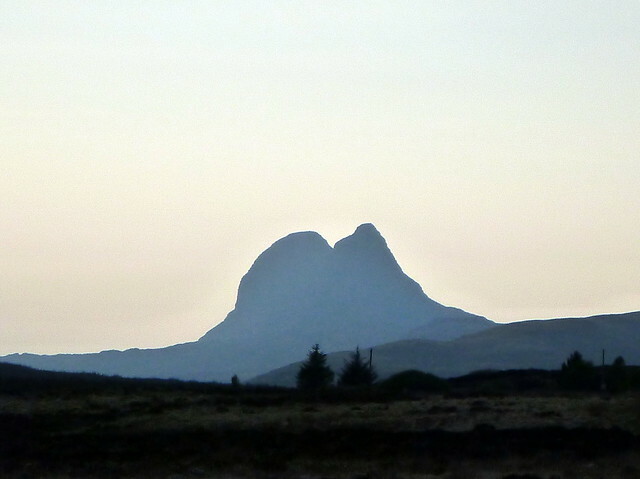 We returned to the campsite and enjoyed a tasty meal of pasta washed down with Chianti before a walk across the headland to watch the sunset, taking in the “split rock”, the “smallest castle in the world” and, of course, great views of Suilven and Canisp. Back at the campsite, there was a new arrival in the shape of a very tall, very stout cyclist who had pitched a tiny tent which looked not unlike a coffin and who caused considerable irritation by talking very loudly on his phone (in a Dom Joly stylee) before retiring to bed and snoring at a fairly intense volume for much of the night. 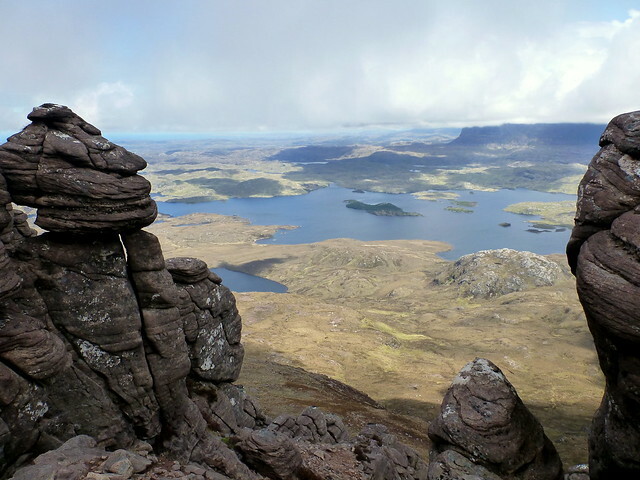 From my very first visit to Assynt in 1975, Suilven had stood out as the most iconic of the area’s mountains, exerting a pull on the imagination and being instantly recognizable from wherever we were. 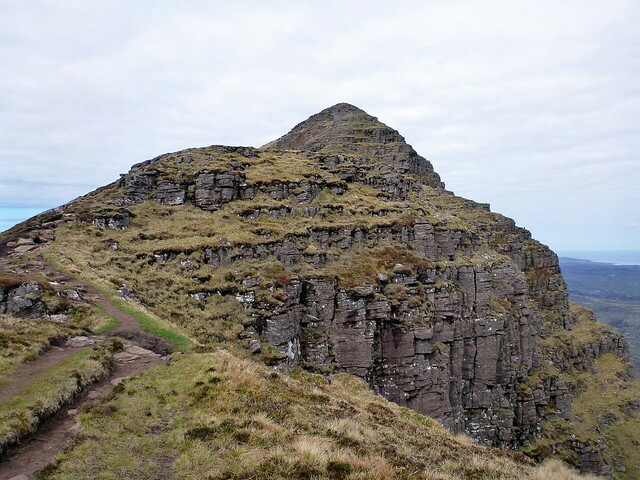 I’d never been close up to it however, and the thought of climbing it was quietly thrilling. We got away not long after 7 and made the parking spot at Glencanisp Lodge nice and early, the first car there. It was shaping up to be a nice day again with mottled white clouds overhead. 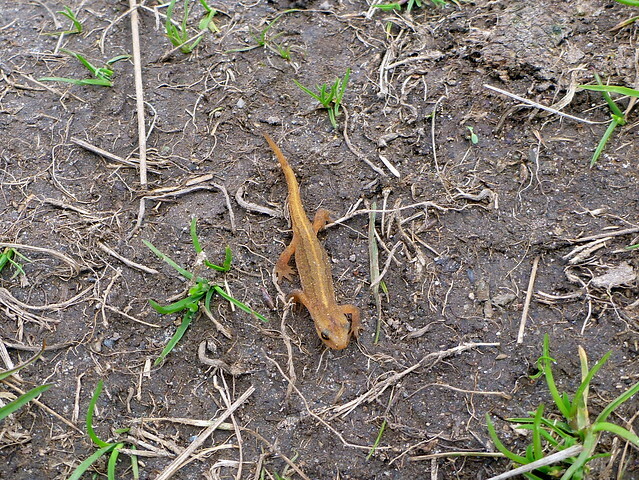 Underfoot, nature was bursting out of every nook and cranny after the long winter slumber – newts, large green-shelled beetles, dragonflies in profusion. 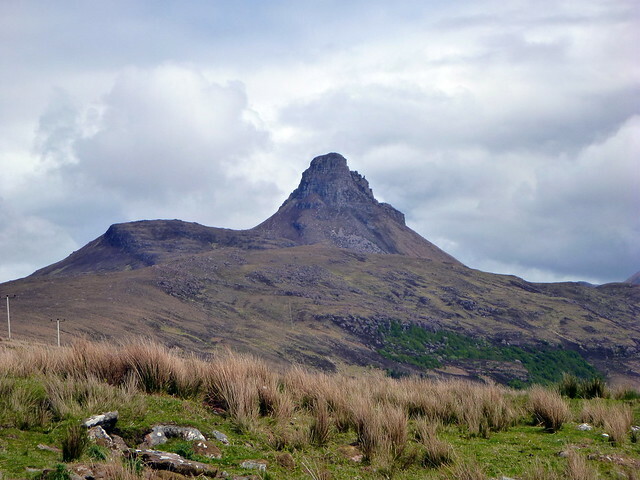 We made good progress along the track, enjoying the changing shape of the mountain as we walked from the west towards the middle of the hill. 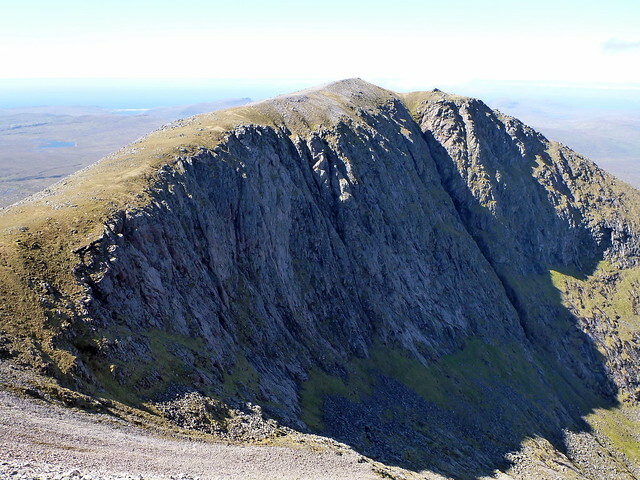 It really is quite a long ridge from the west to the east tops. 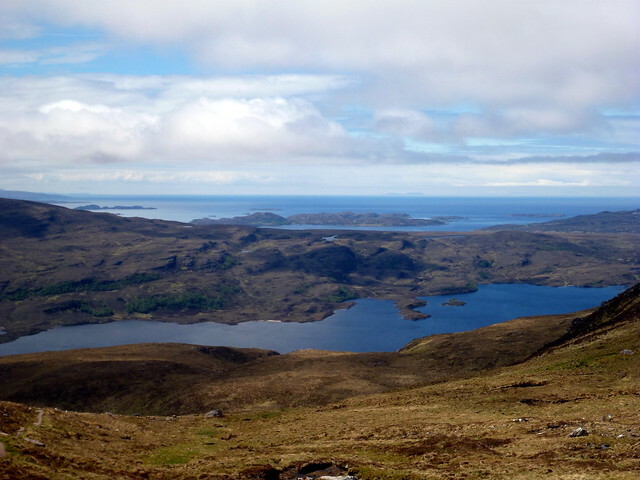 Turning off the track towards Loch na Barrack, we’d been prepared for boggy ground underfoot, but the recent dry weather had tamed the worst of the slime and it was not too difficult to avoid the worst of it. 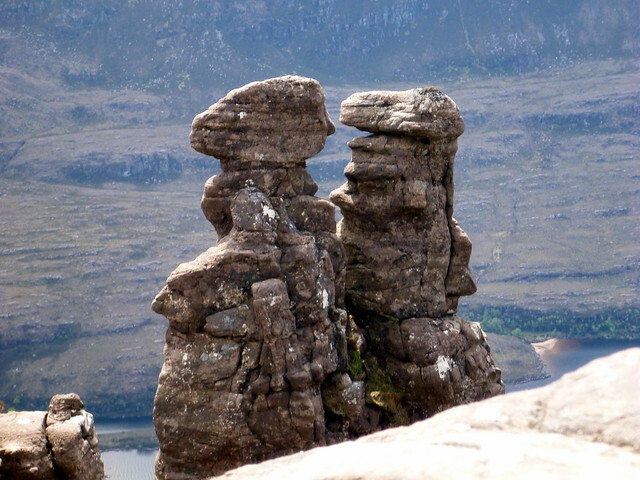 From up here the fin-shaped eastern side of the hill looked surreal, like something out of prehistoric times, and indeed it would have been no surprise if a couple of Triceratops pursuing a herd of Brontosauri had appeared crossing the plains below. 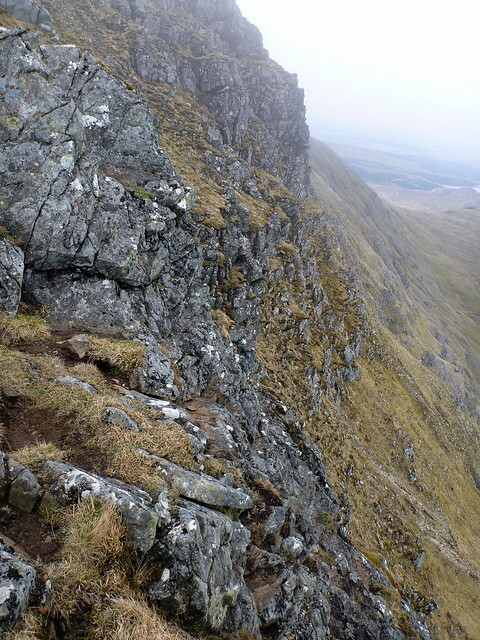 The path up to the summit of Caisteal Liath was narrow and exposed in places and I was surprised to find my enthusiasm for scrambles yesterday had subsided to a bit of apprehension, with any plans to tackle the middle top being discarded. 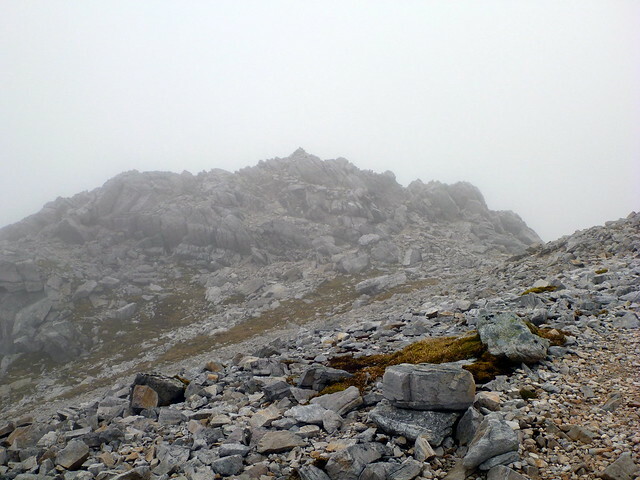 Getting to the summit, I was surprised to see a fairly broad, gently sloping top. 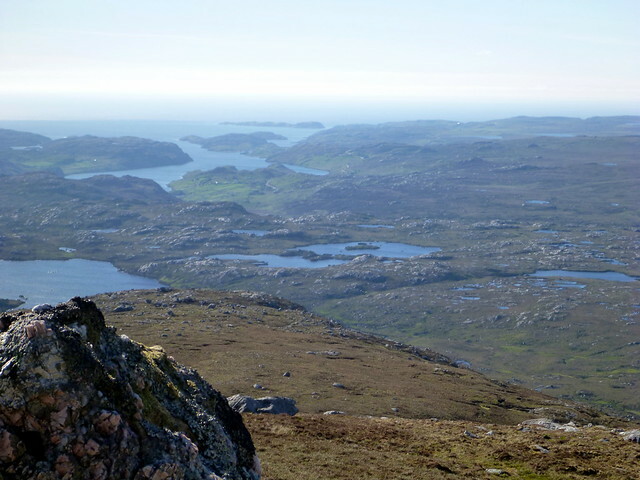 We stopped for lunch and drank in the view out to the sea, over to the pointy jumble of Foinaven/Arkle. 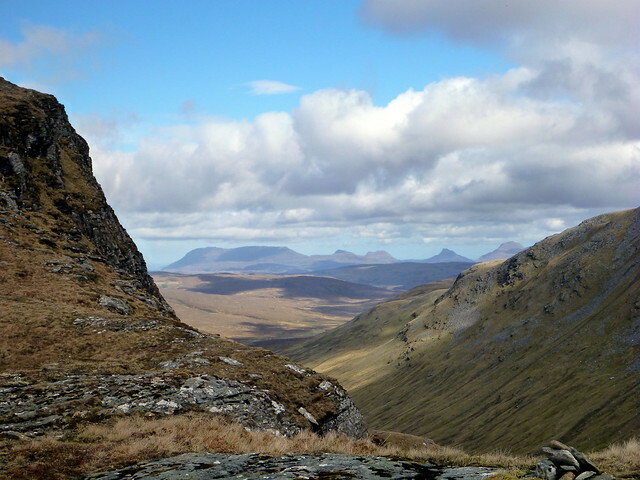 On our return leg we passed a number of walkers, but not a Scot amongst them. 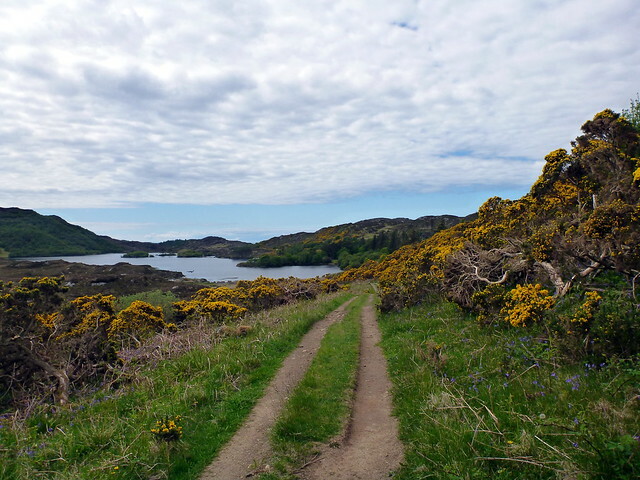 A pleasant walk back to the car was followed by another brief stop in Lochinver for a beer then the drive north to Blairmore to make our visit to Sandwood Bay. Despite years of longing, I’d never been to SB - the walk from the car park being a dis-incentive in years gone by and the place had grown in mystery and allure over the years. To be visiting it finally, on a day which was warm and sunny was a dream come true. 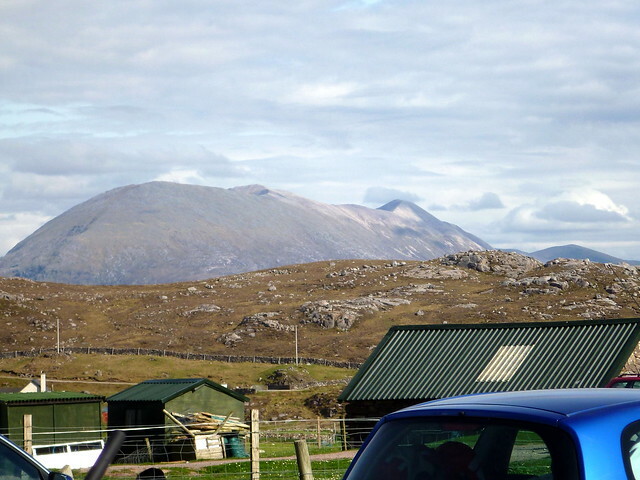 We parked at the ample parking area at Blairmore, enjoying views from the North of Foinaven as we packed up our large rucksacks and set off along the 4.5 mile track to the beach. At points I was almost running, I was so excited to get there. 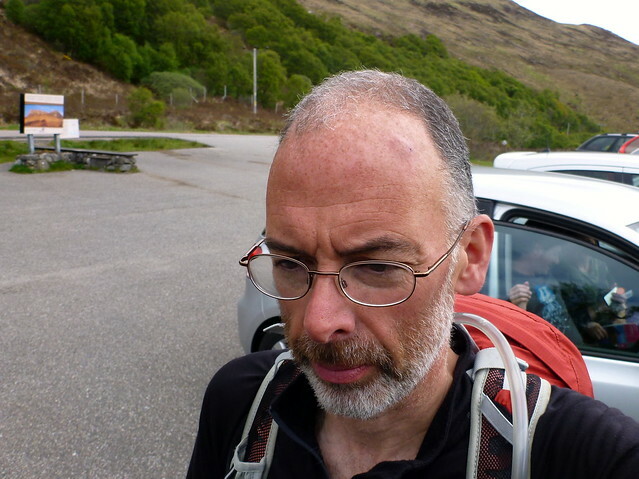 We passed a number of folk returning, many of them with gurny faces. Whether this had to do with having to leave the beach and return to their cars on a lovely evening, or whether they’d not been impressed with the beach was impossible to know. 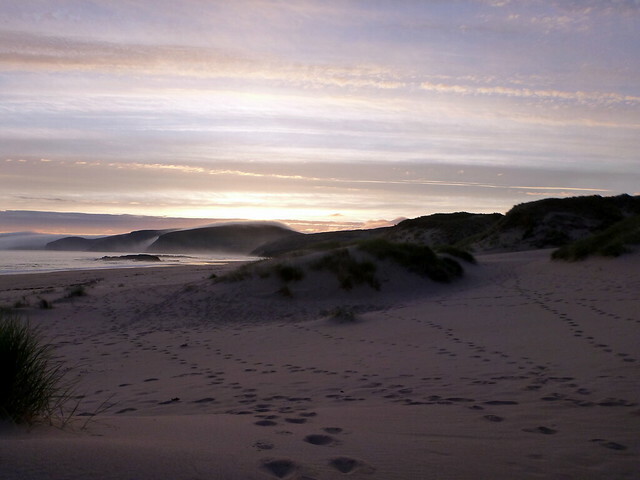 By the time we turned down towards the beach and I had my first sight of something I’d dreamt of for such a while I felt strangely underwhelmed – from up on the dunes it didn’t really seem anything special. 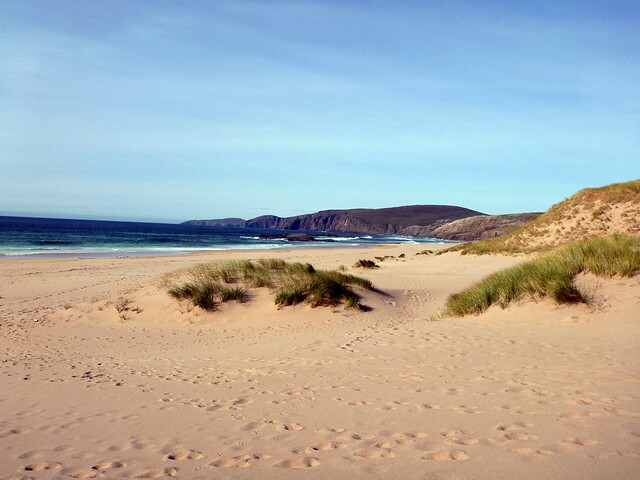 However, as we got down to the beach itself, over tall dunes thick with marram grass and I could see the extent of the beach to the north, I felt more impressed. 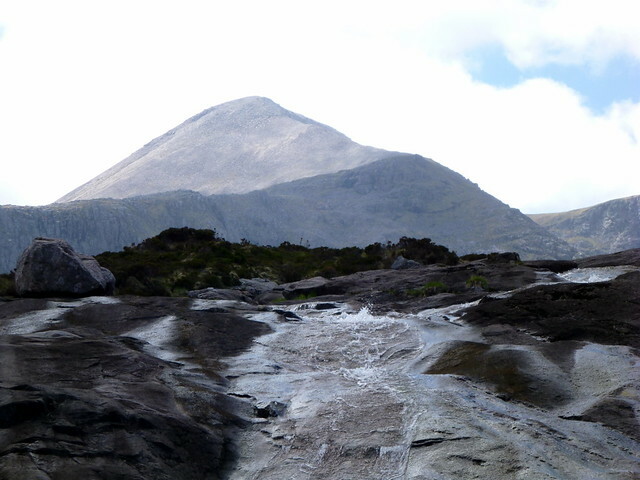 This only intensified when we walked down to the water’s edge and the stack of Am Buchaille came into view. 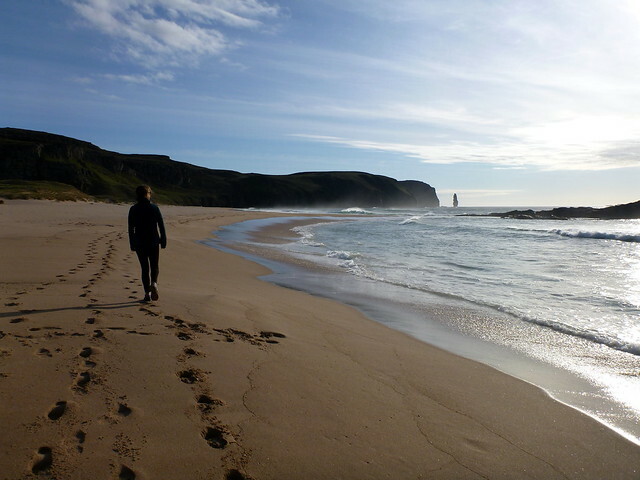 Apart from a lone fisherman we were the only folk on the beach, the sun was still streaming down, and we enjoyed a barefoot wander along the length of the beach and back. 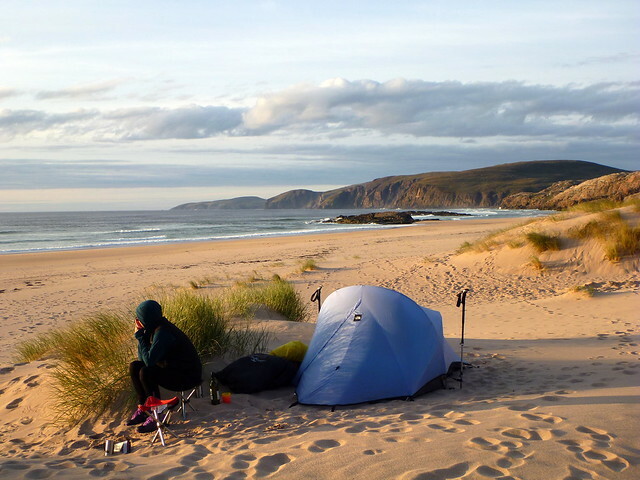 We pitched by the edge of the dunes – I was glad I’d my snow pegs with me as they produced a more secure pitch in the sand and strong breeze than ordinary pegs. One of the challenges I hadn’t anticipated was how to cook the tea without getting mouthfuls of sand – this really called for an “inside the tent” cooking job which was duly completed and we enjoyed a tasty veg chili. After tea we sat and watched a party of 4 not very competent but enthusiastic surfers try to master the white horses coming in, then when they’d disappeared we were left alone on the beach, walking down to the water’s edge and watching the sun going down, turning the golden sand to crimson. 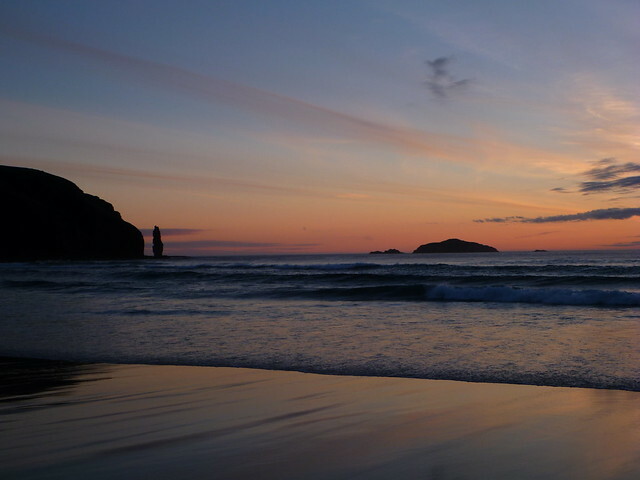 The waves pounding on the small rocky islets along the bay produced a deep soporific sound and the sight of the stack against the sunset was wonderful – I enjoyed a wee Highland Park while watching this spectacle. 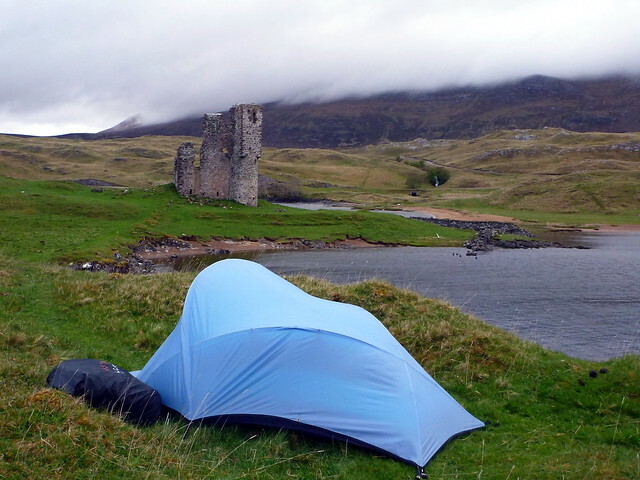 By this time it had turned rather chilly and we retired to the warm shelter of the tent for a peaceful night, lulled to sleep by the waves. 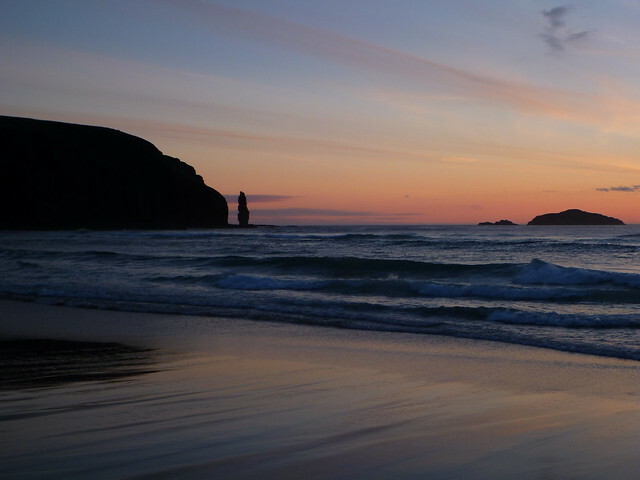 If Sandwood Bay had been a long held dream realised, Foinaven was even more of a special proposition. 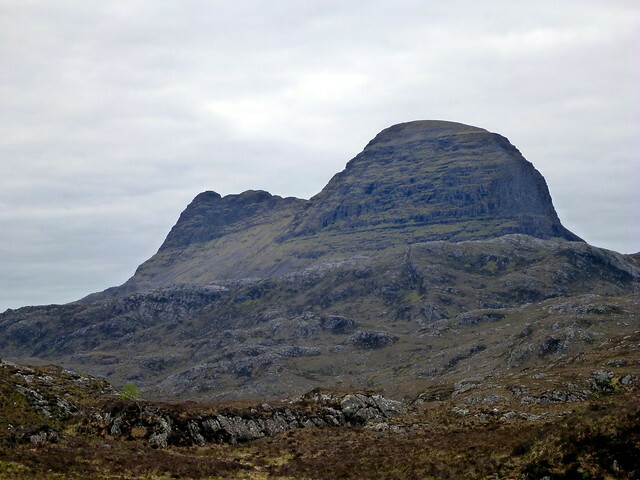 Of all the mountains in Scotland it had captured my imagination since my mid-teens – probably something that I’d read about “remote shattered quartzite slopes" where you could hear "the living mountain crumbling beneath you” It was definitely going to be the highlight of the trip for me. 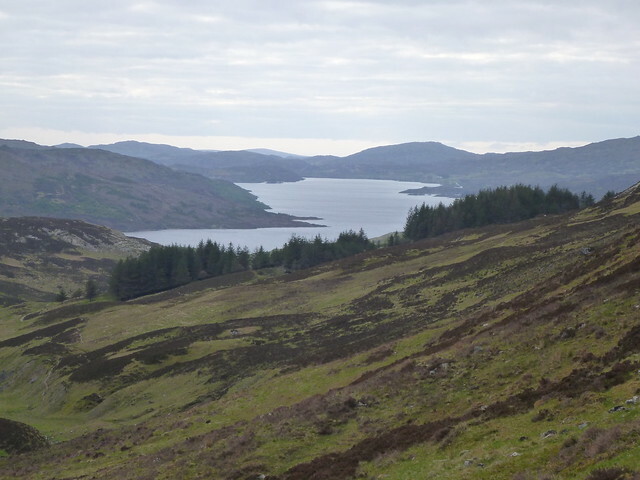 However, for some reason I hadn’t actually planned our route in any detail - I had loaded up three potential routes into my GPS and thought I’d take a punt on whichever seemed most promising on the day. Not necessarily the best tack to take, but I think that I wanted to preserve something of the mystery of the mountain til I actually got there. 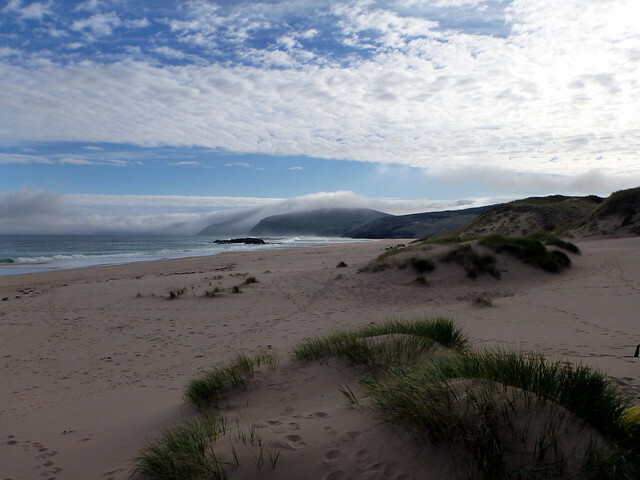 Anyway, we got up and away from Sandwood Bay at about 8, impressed by the streamers of low cloud swaddling the hills to the north of the Bay. On the route back we met numerous folk heading down for the day, mostly of “a certain age” – like Sandwood Bay is a place to visit before you die… We made good speed back along the track, returning to the car park in about 50 minutes and using the facilities to wash the sand off our assorted cooking equipment. 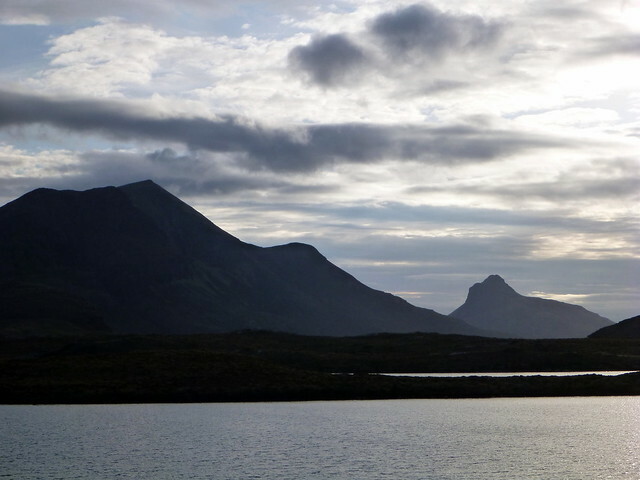 The off in search of Foinaven. 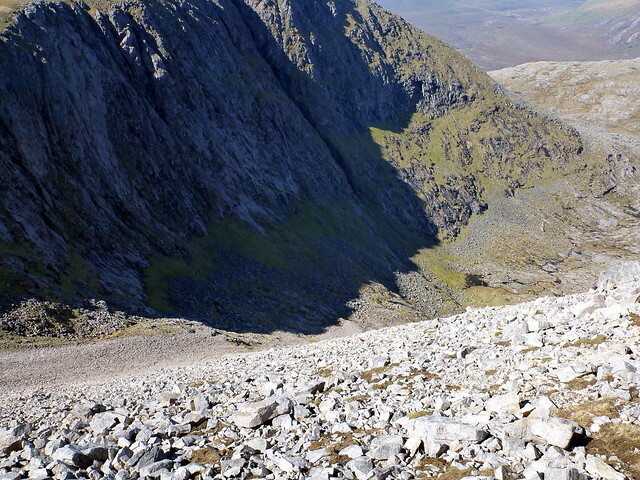 I had, in an ambitious moment, considered that we might do a traverse of the whole ridge onto Arkle, but without 2 cars that wasn’t really likely to happen. 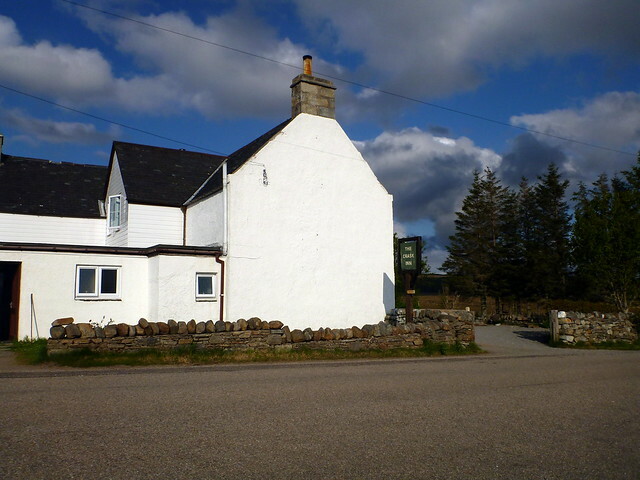 We chose to start the walk from the layby a couple of hundred metres past Guilan House and walk down Strath Dionard. 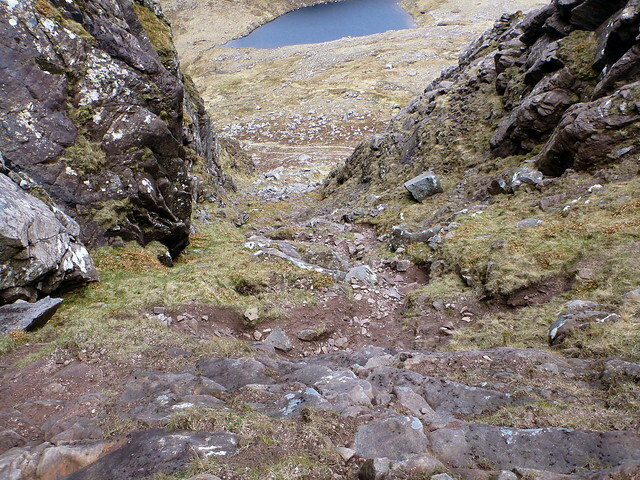 This proved disconcerting initially as we were aware of heading significantly downhill from the start of the route – it's surely not right to be going down first on your way to climb a mountain? 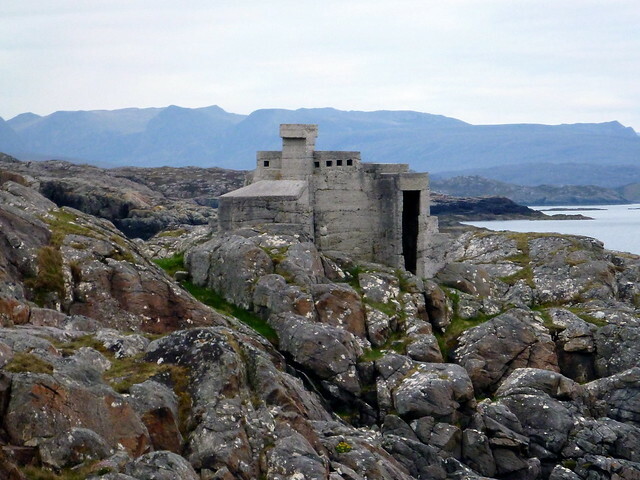 The sun was hot and we had a welcome rest for lunch at a bench outside a most luxuriously equipped fisherman’s bothy - big gas cylinder outside, kettle, cooking stove and upholstered cushions to sit on – they know how to get comfortable, these fisherfolk. 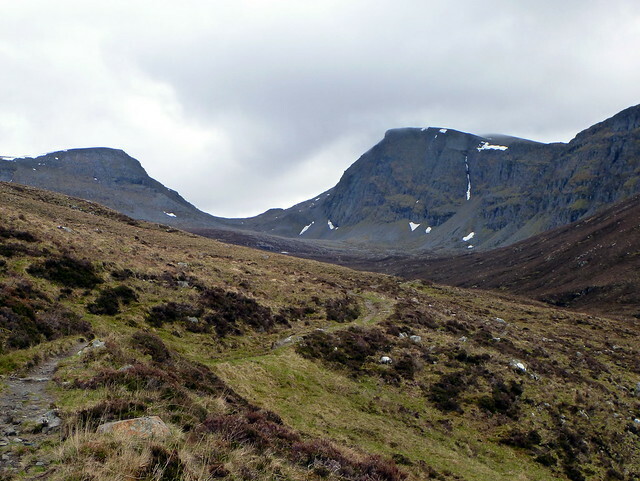 Anyway, we continued a little further down the glen until we reached Allt Coire Duail where we followed a faint path over boggy ground until we reached the lochan at Coire Duail. 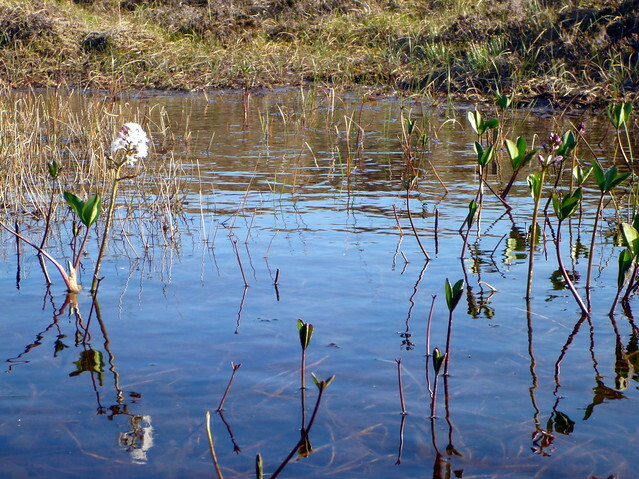 Once again nature surrounded us in a riot of colour and buzz – dragonflies, damselflies, frogs popping out from underfoot, puddles fizzing with tadpoles. 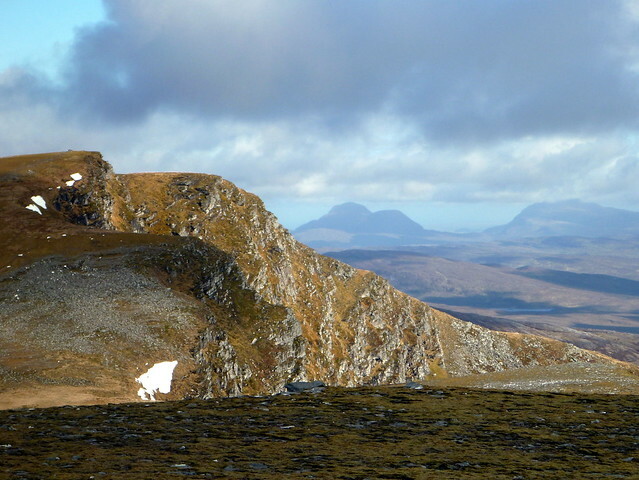 As we moved into the cleft between Cnoc a Mhadaidh and Cnoc Duail it felt that we were being enveloped into the mountain itself, and the strangeness of the grey/white slopes of Ganu Mor looming up ahead did nothing to dispel the sensation. 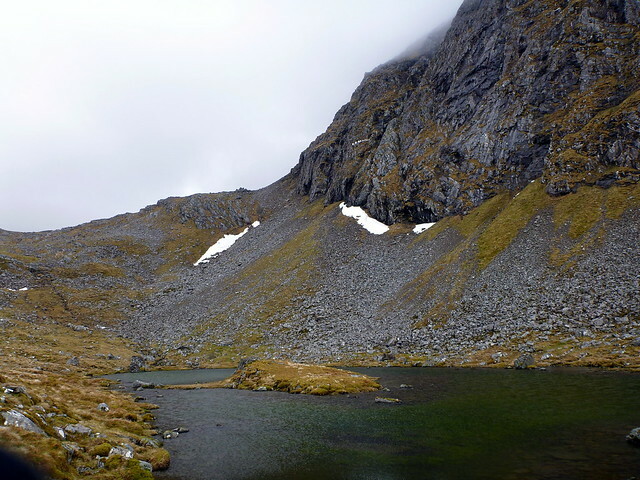 After some scrambling up large rocky areas we reached Coire Duail and set off for the smaller lochan at Glas Coire Granda. 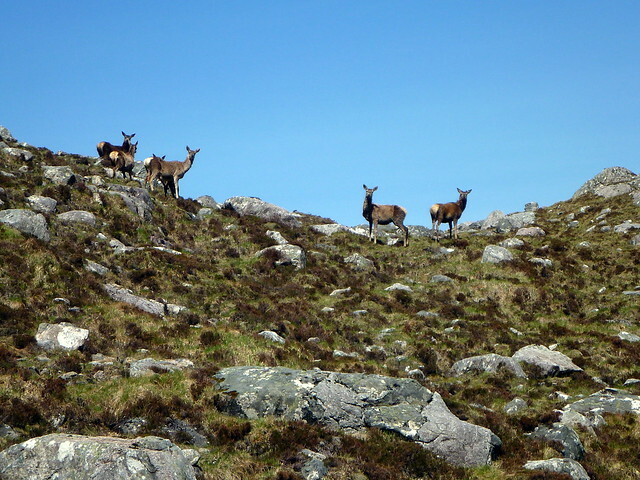 On the way up through heather we both jumped when there was a sudden loud barking noise to our right – a stag with a group of hinds roaring his displeasure at our presence. Don’t think I’ve heard such a noise before, not at close quarters anyway, and it added to the mystery of the day. 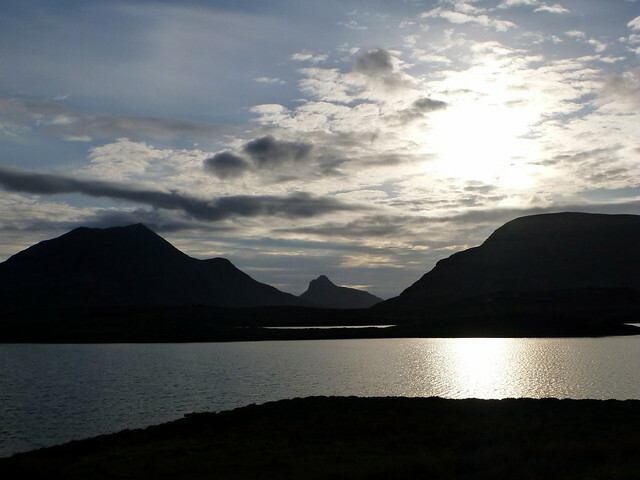 Regaining our composure, we headed round the north of the lochan and surveyed the route possibilities ahead. 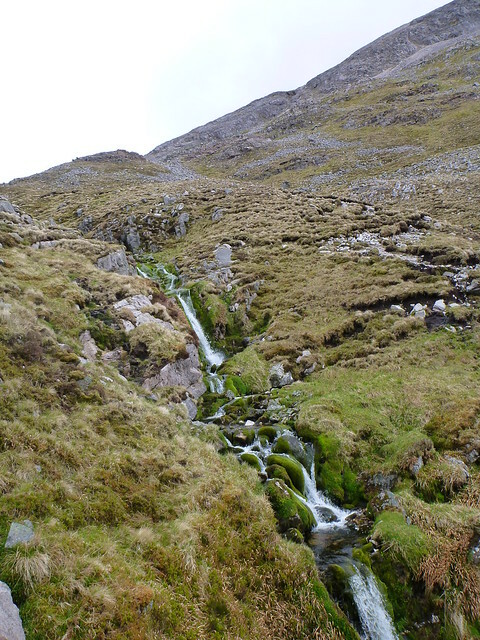 It looked most sensible to keep to our right and follow the line of a stream up the side of Ceann Garbh, reaching the bealach and walking up to Ganu Mor. 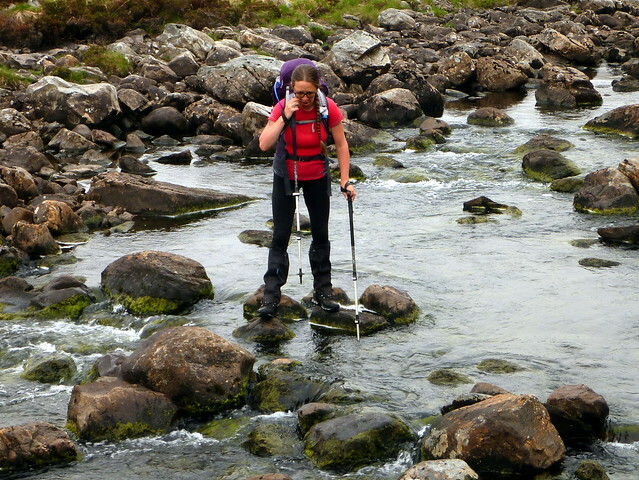 Allison was a bit concerned about slipping on wet rocks, but I reckoned it would be fine. 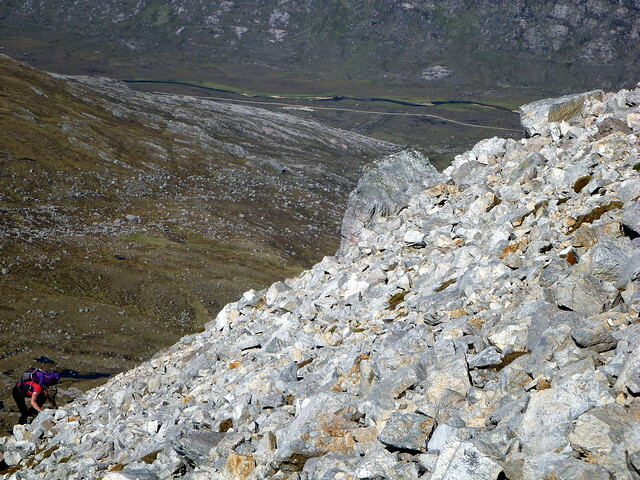 The going was quite steep over rough boulders but we finally made the start of the scree slope. 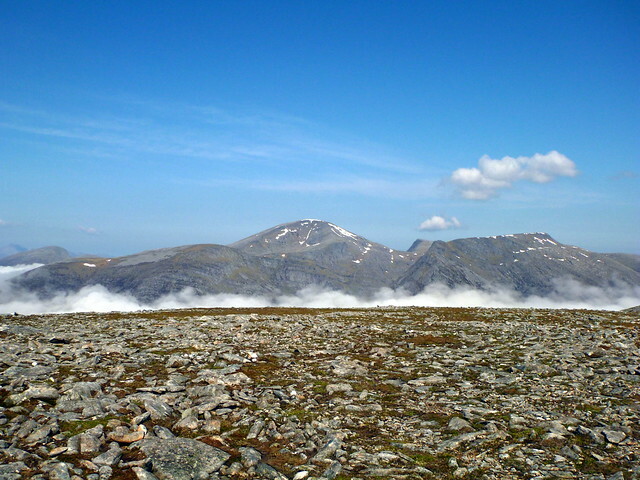 There were still some 250m to go to the summit. At this point I had one of my more insane ideas . 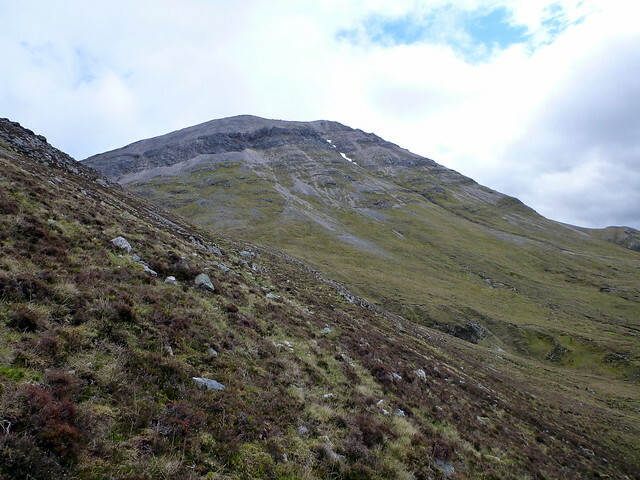 Instead of going up to the right and having to walk along the ridge, why not just contour over to the left and head straight up to the top of Ganu Mor – from this position it didn’t look much steeper. OK, that’s what we’ll do. 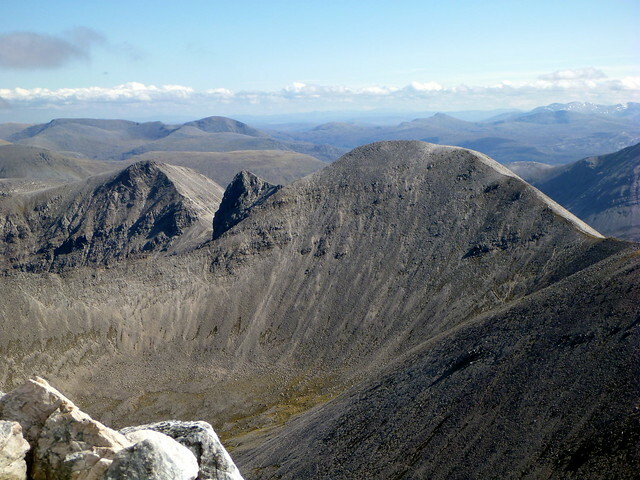 The initial bit of scree wasn’t too bad, but as I progressed up the hill it became more and more challenging . 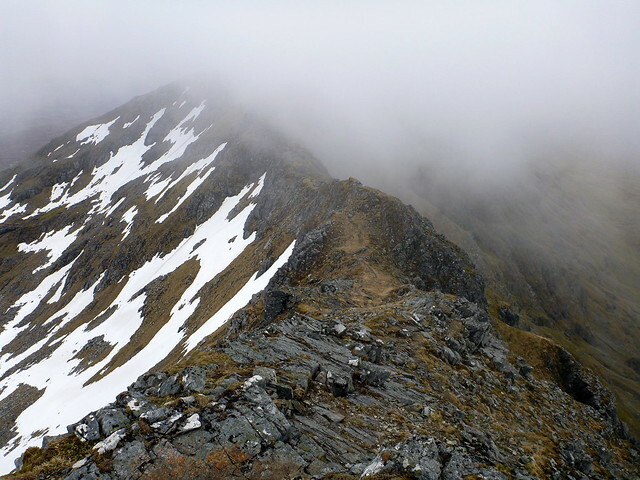 The hillside was very steep and the scree was deeper and more mobile than anything I’d encountered before – often I’d take a step up and immediately slide back past my starting point. 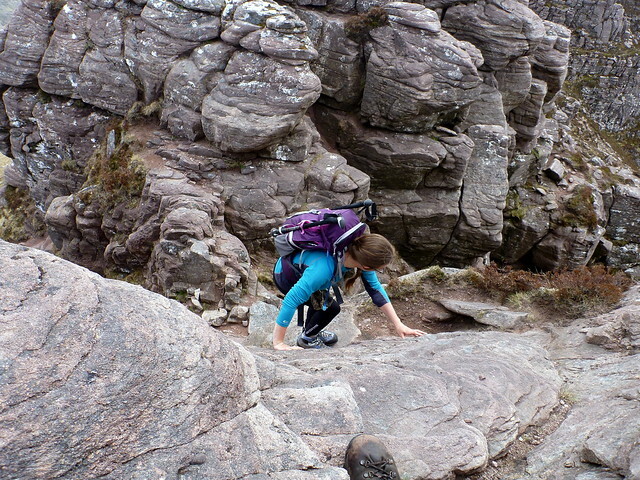 It was also very difficult to get a handhold and I quickly ditched my poles and ascended on hands and feet. 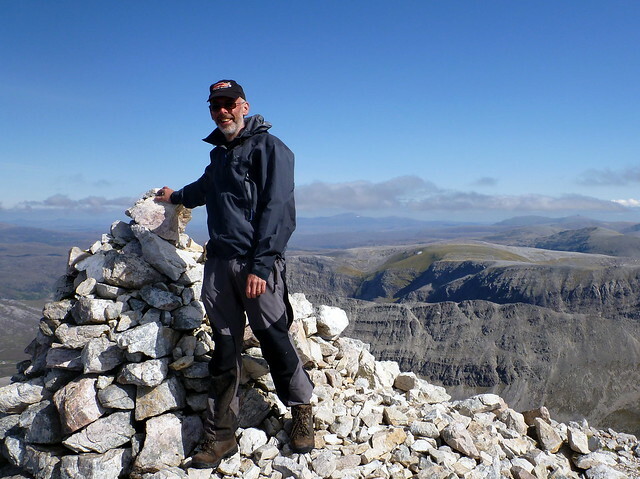 It’s probably the most extreme concentrated physical effort I’ve undertaken – unpleasant if not particularly scary, but progress was inordinately slow and the top never seemed to get any closer. 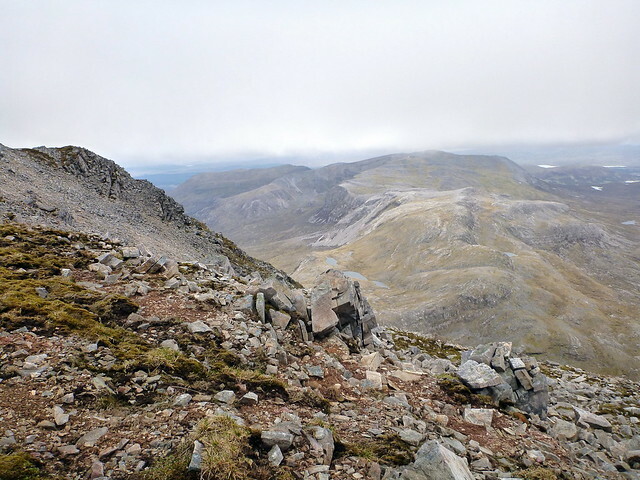 As I gained altitude I could see a clear path through the scree over to the right, on the line that we should have taken. Allison was way below me and I shouted to her to head over to the left, but all she heard was a wonderful muffled echo that she couldn’t decipher and chose to follow my route up. 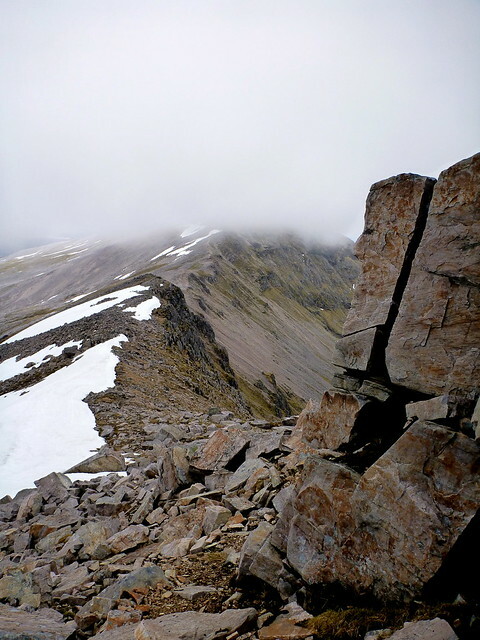 I was very aware of the danger of loose scree coming down on her and tried to avoid spilling any rocks down, but she later reported that one particular fist sized rock had come screaming down and narrowly missed her head, bouncing away on another course at the last moment. 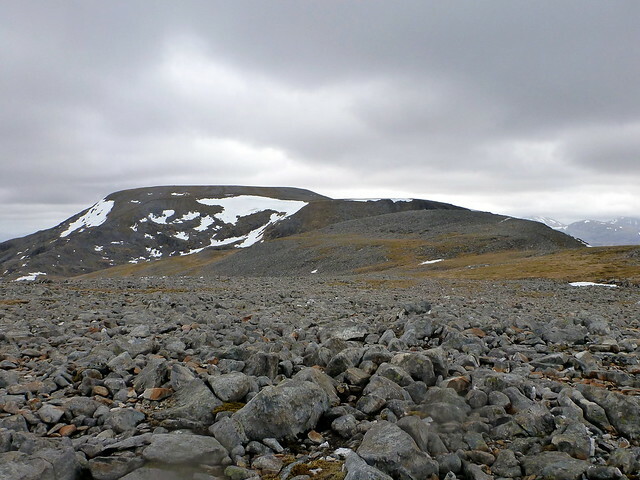 Finally I made it to the top of the scree and hauled myself onto the welcome flatness of the ridge top a few yards from the summit cairn. An English couple, he with a butterfly net, were sitting enjoying the view and expressed incredulity when I told them which way I’d come up. However, all I felt was intense exhilaration at finally getting to the top spot on my cherished peak, and somehow, doing it the hard way made it all the more special. 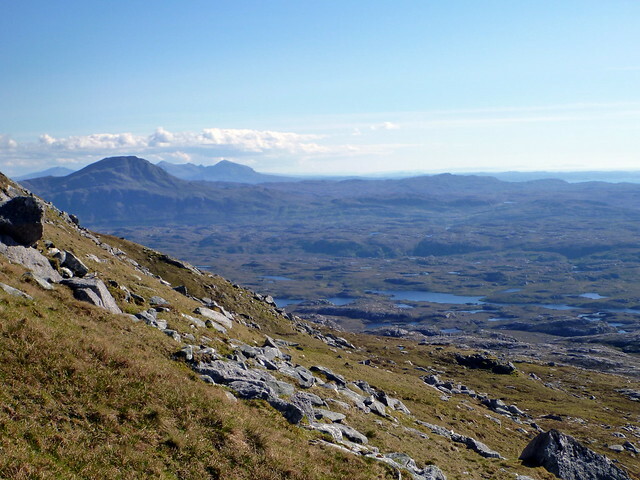 The views along the ridge to the south and over to Arkle were fantastic, similarly those east to Cranstackie and west to Loch Laxford and beyond. 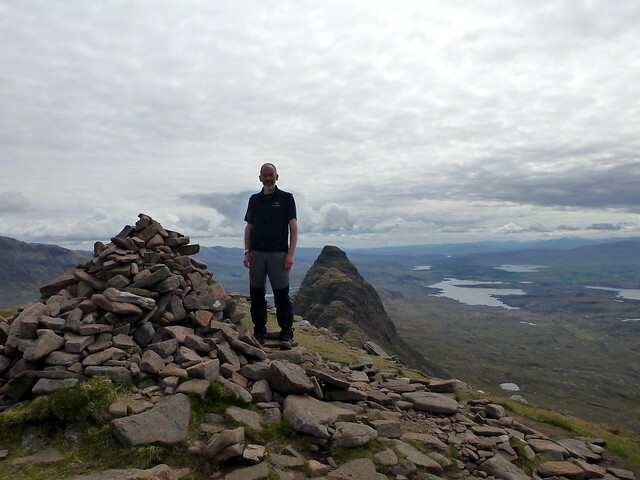 My heart was beating fast, partly with the effort of the ascent and partly with sheer pleasure at being up here on such a wonderful day. 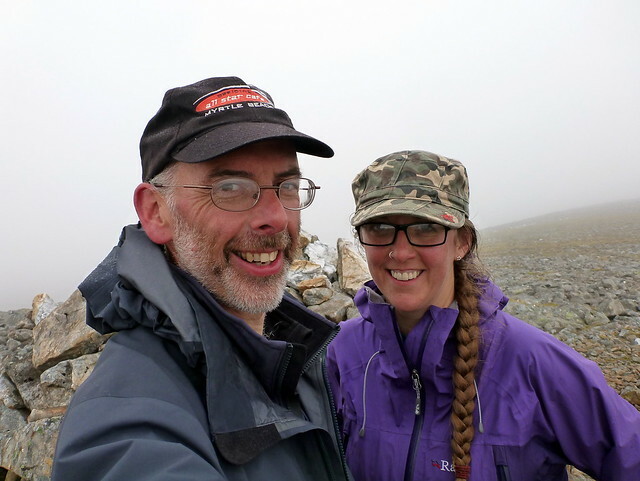 Eventually Allison joined me, shaken by her experience with the scree and in need of getting her breath back. 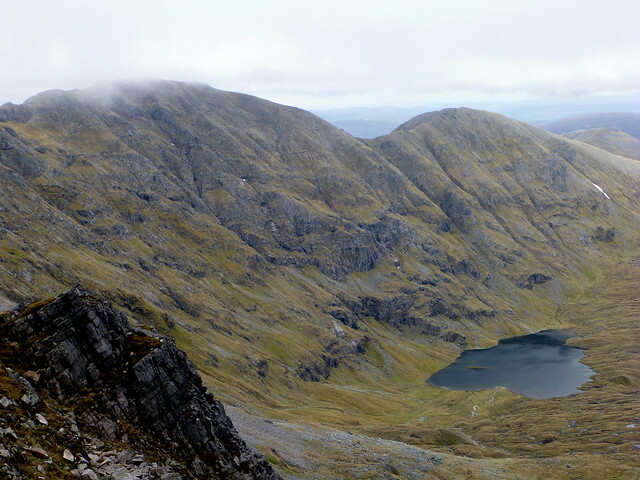 It had taken us longer than anticipated to get this far – it was almost 5pm by this time – and we decided not to do any more of the ridge to the south, but to head over to Ceann Garbh and down the shoulder of that top onto the lochan peppered plains. The route I had on my GPS seemed to take us for miles over to the west before heading back round north to Gualin House and we swithered about making a bee line for Gualin. 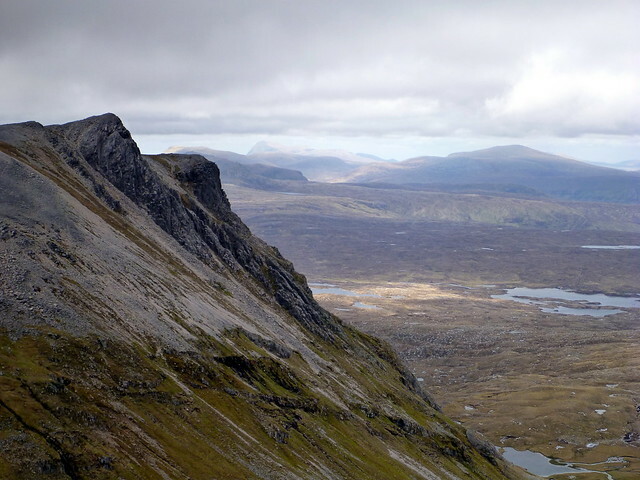 Not knowing how steep the crags to Claise Carnaich would be (very, as it turned out), and fearful of getting trapped in a waterlogged flatland thereafter, we decided to just put up with the extra miles and follow the route we had. 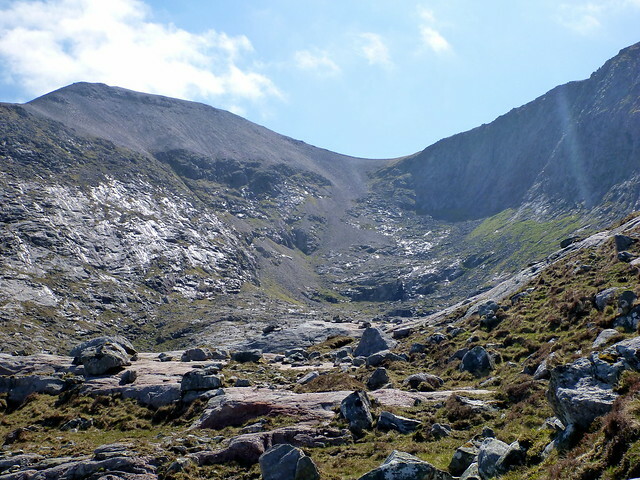 The descent was rough initially over boulders then heather and bog. 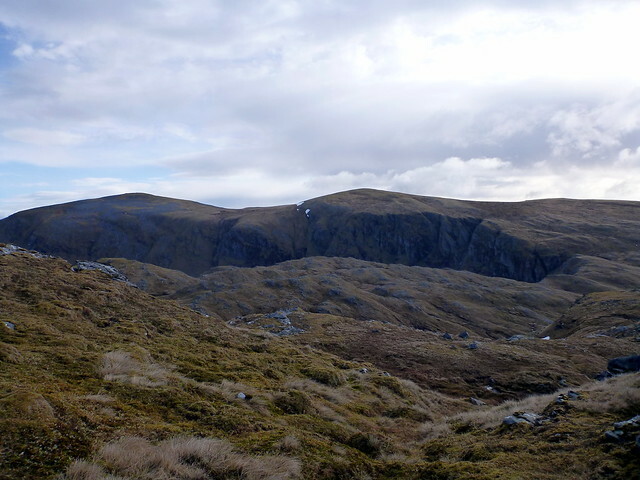 The mast on Meall na Moine provided a useful point to aim for and we slogged it over the terrain, having to go round bog pools and areas of peat cutting which had filled with water. 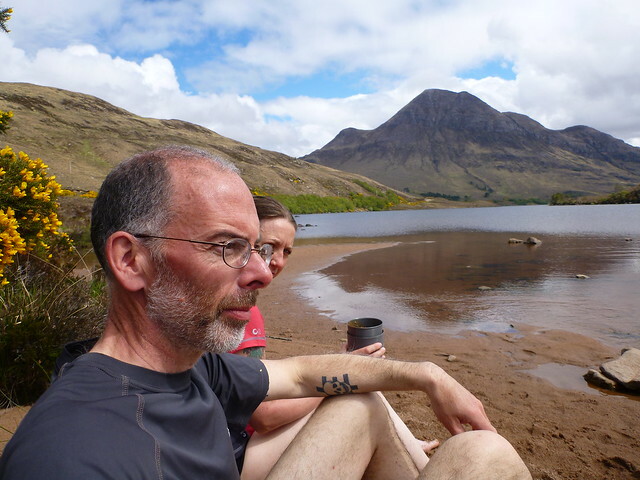 We were both a bit sun-roasted and footsore as we made the final stretch up to the road and along the last few hundred meters on solid ground back to the car. A fine day’s work. 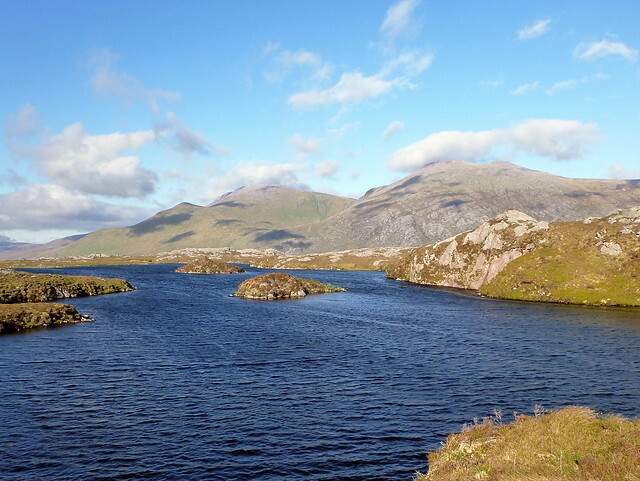 We drove around the Kyle up to Durness where we stopped for a welcome cold pint of beer. 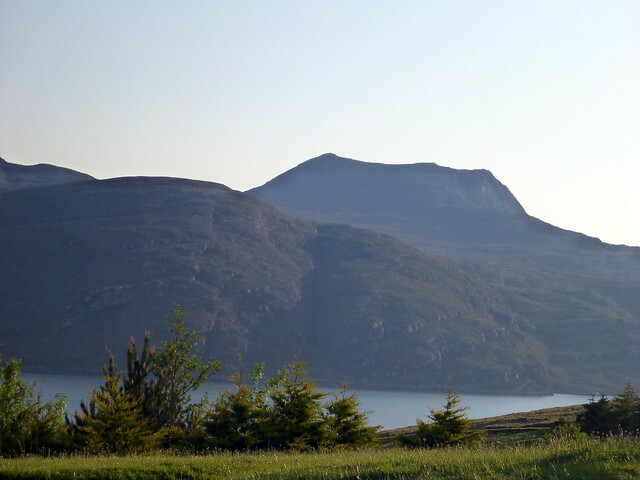 It was around 8pm by this point and we decided to press on to our next campspot somewhere near tomorrow’s target of Ben Hope before having our evening meal. 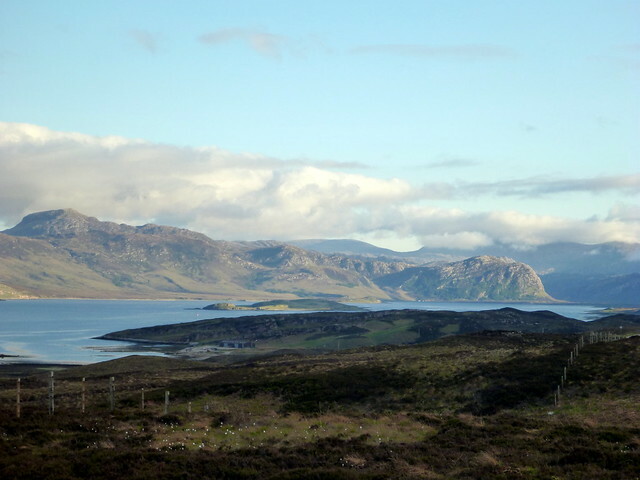 It was still a beautiful evening, with even Loch Eribol looking sunny and benign instead of her usual dark foreboding self. Heading down the narrow road along Loch Hope we got a great view of the north face of this otherwise anonymous hill. 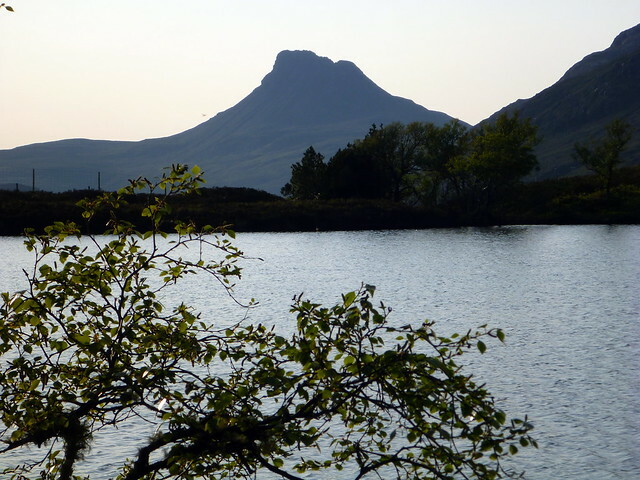 We parked in a spot about 1km north of the main car park for Ben Hope where some trees offered privacy, but unfortunately also contained the worst lot of midges we’d yet encountered. 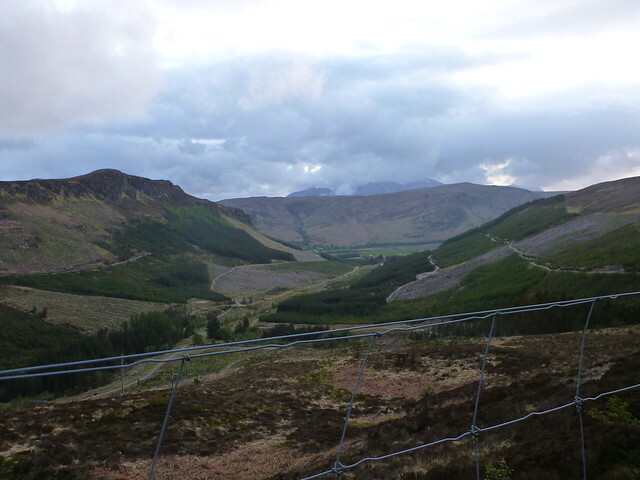 The sun had gone, there was drizzly rain in the air and the midges were ready for feasting! 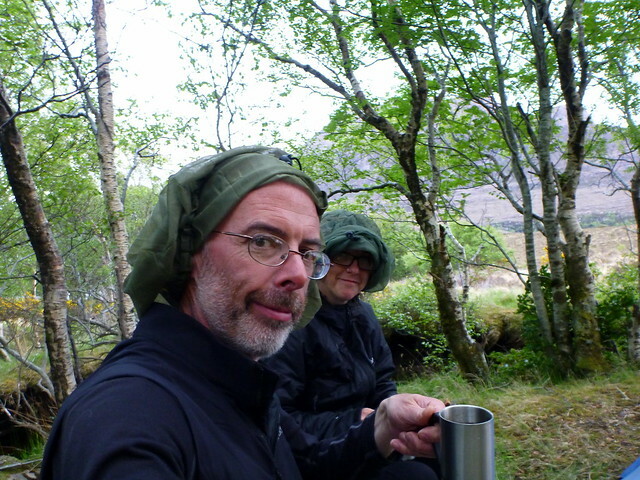 We shoved the tent up in double quick time and got the food on with midge-nets covering our heads. After a hasty repast we headed into the tent for escape from the flying fiends. However I was a bit sunburnt from the day’s exposure and had very hot arms, which didn’t make for a restful sleep, and poor Allison was subjected to a fair bit of crabbitness… During the night we heard the bark of a deer again – something that would have been much more scary but for our encounter earlier in the day – at least we knew what it was. 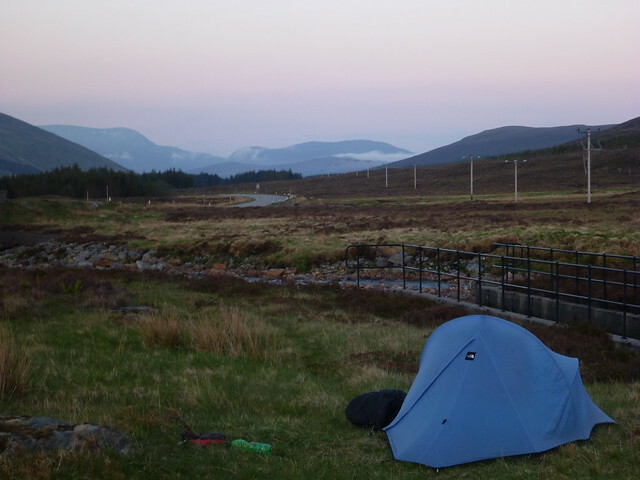 Later on Allison heard the deer approach the tent and snuffle along the side of it, pressing nose against the nylon and grunting – I was sleeping in blissful ignorance through this encounter . 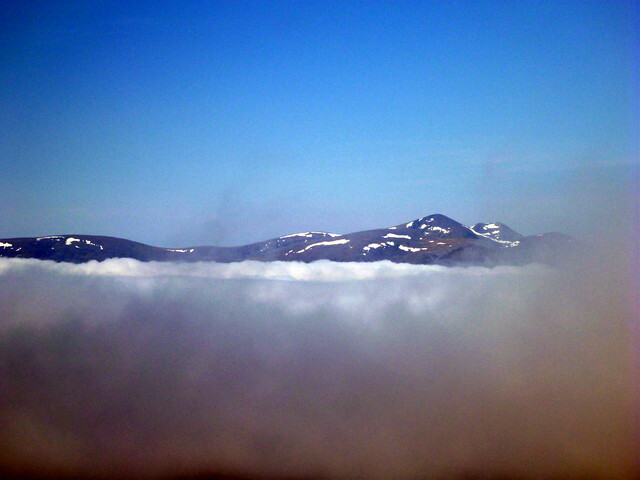 We awoke to find that the mist had come down over the hills and it was cool after the hot sun of recent days. 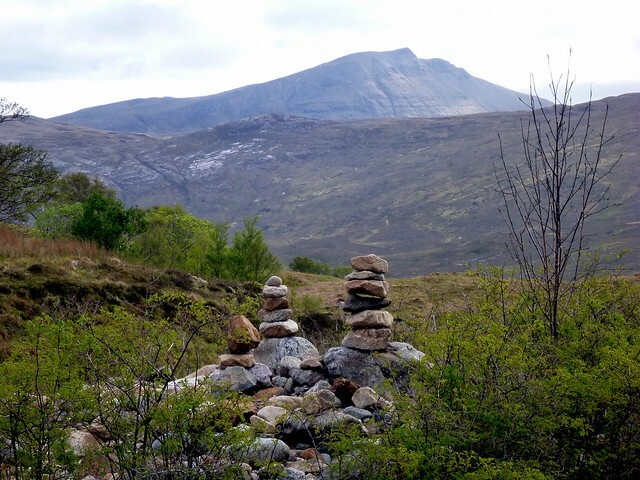 We drove down to Alltnacallish Farm to take the slightly more interesting path up Leitir Mhuiseil rather than the standard tourist trail. 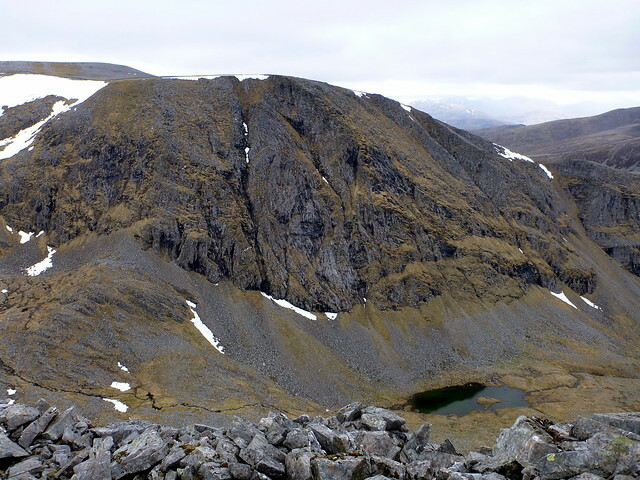 I’d climbed Hope in 1994 with my brother-in-law for my second Munro, and we’d taken an approach up the north face of the mountain which I remember mostly for walking along a narrow ridge and having 2 RAF Tornados fly right underneath us - close enough to see into the cockpits - as they hugged round the side of the hill and finishing up with a wee scramble up a rocky chimney before coming out on the summit. 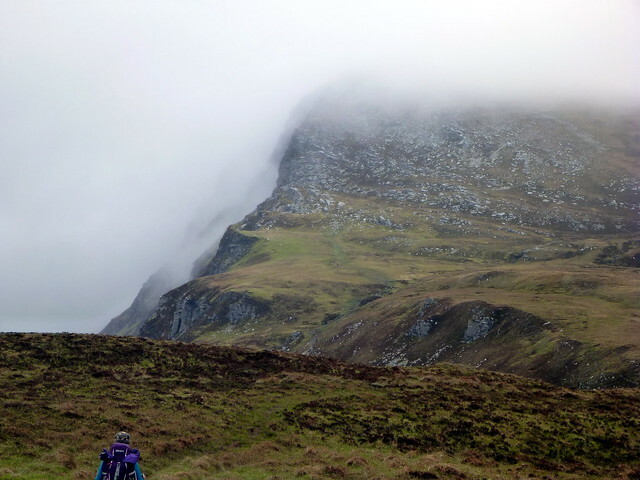 Today’s trail was much less interesting, particularly as all views disappeared into clag from about 450m upwards. 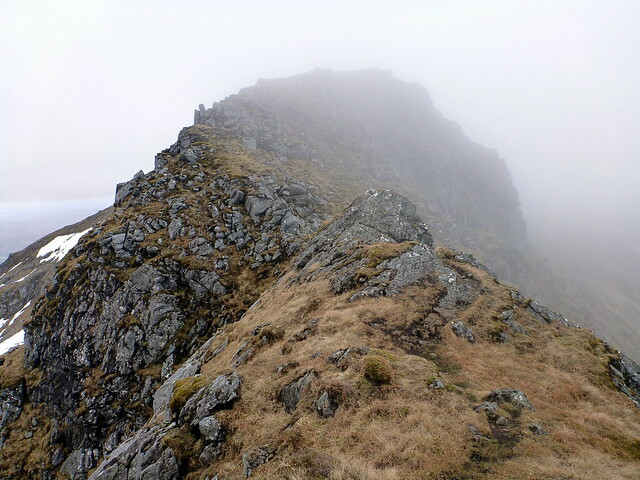 It was a morning of false summits - in the fog it is hard to know how much further the top is – I kept mistaking rocky outcrops for the summit cairn and it was always a bit further, always on a bit more. 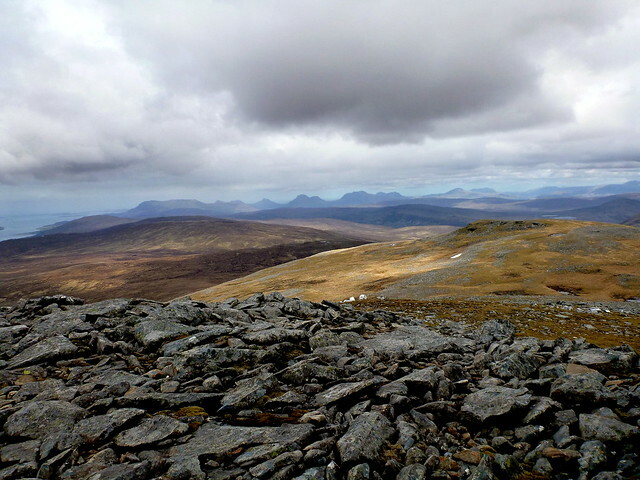 Eventually the real cairn and trig point loomed into view and we huddled down into the shelter to have some grub. 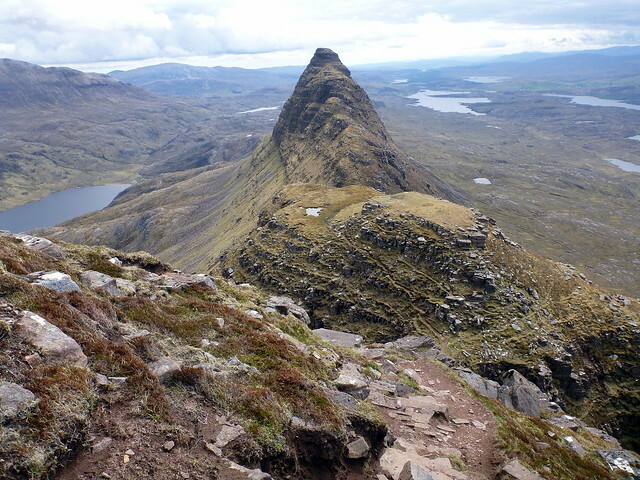 On the way back down we met a few folk heading up, keenly asking if it was clear at the top – alas, no. 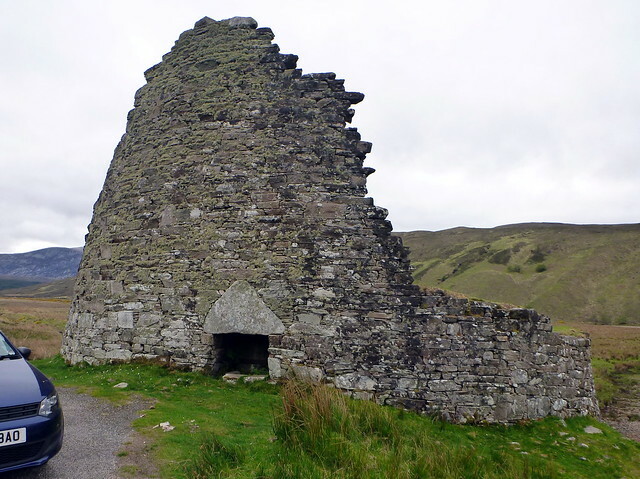 Back at the car, we popped along to visit the broch at Dun Dornaigil before heading back up the side of Loch Hope and making for Thurso. We would get the 7pm ferry over to Orkney which left us a little time to restock provisions in the local Lidl and pay a quick visit to the very neat museum in Thurso. 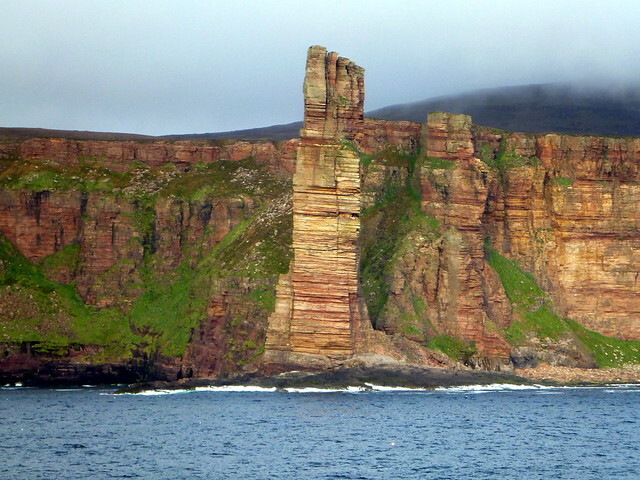 On the ferry we sat on the sun-deck and watched the splendid cliffs and stacks of Hoy glide past – cloud draping itself over the tops made the island look like a land time had forgotten, and I was reminded of the voyage to King Kong’s island in the Jessica Lange film version. Berthing in Stromness we shouldered our packs and headed off to camp. 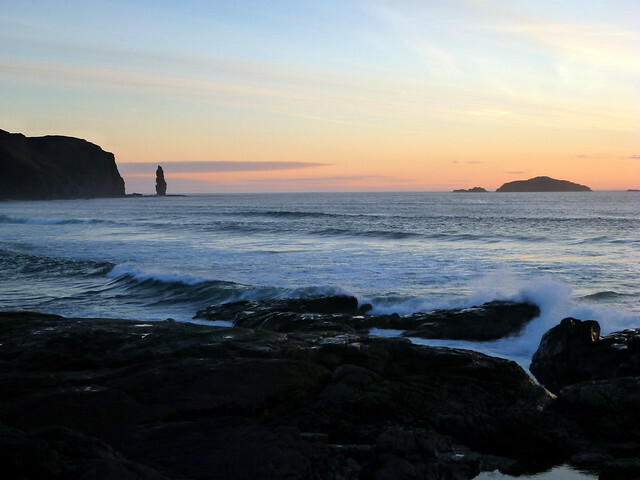 Of all the parts of this trip, the time over in Orkney was the least planned out. 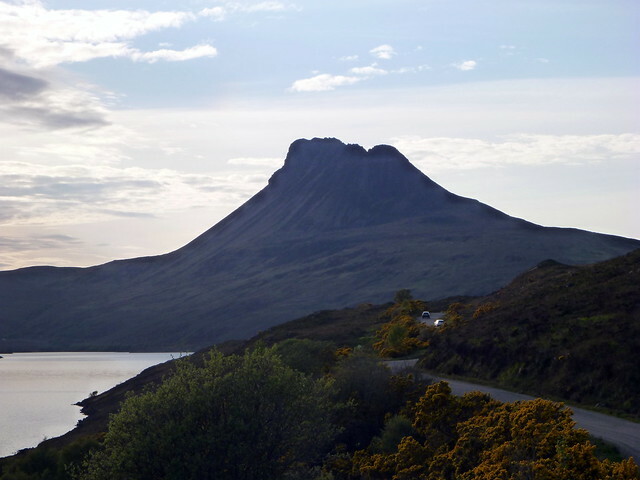 I’d originally thought we’d take the car over and spend a day travelling around, but I knew this would mean booking our journeys in advance and then being committed to following a schedule whether or not the rest of our trip was going to plan or not. 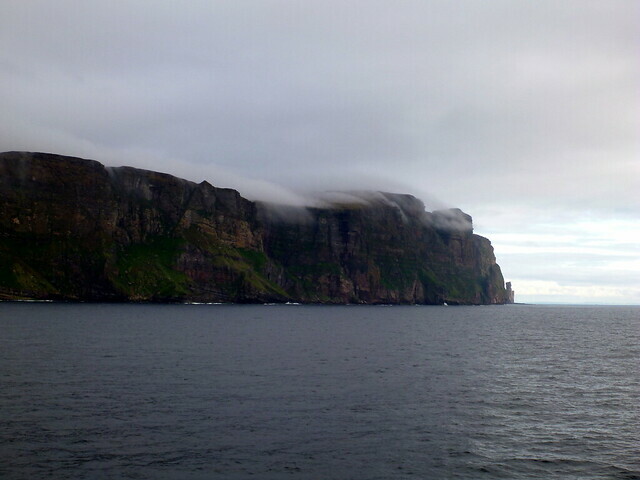 And there are no hills of distinction on mainland Orkney. So plan B was to go on foot, leaving the travel options more flexible, but limiting what we’d be able to see. 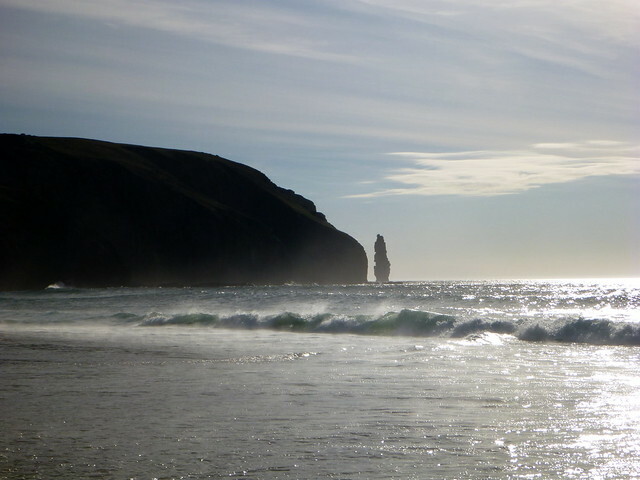 Having spent several holidays on the Orkneys. 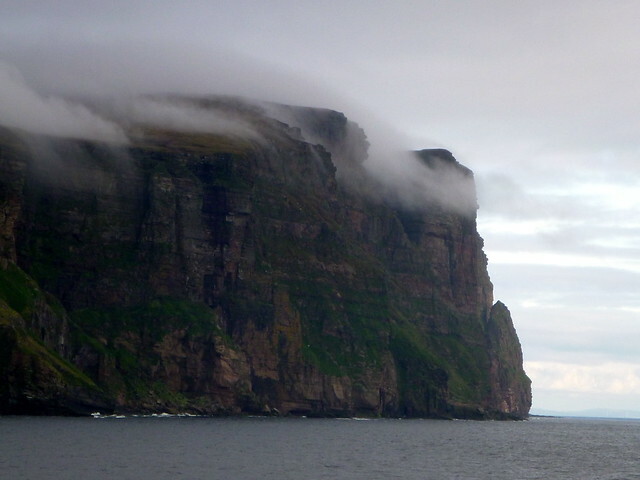 I was familiar with the glories of the island, but I wanted Allison to see some of the key sights. 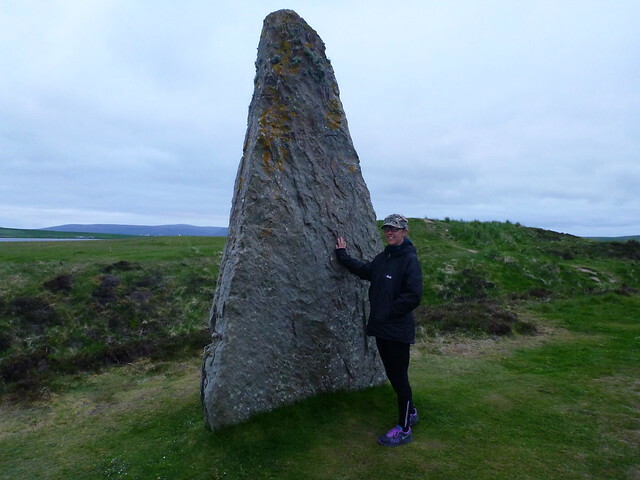 So I thought we should head along to the Ring of Brodgar to camp then visit the Stones of Stenness, Maes Howe, Cuween Cairn, Kirkwall, Skara Brae and maybe anything else en route. 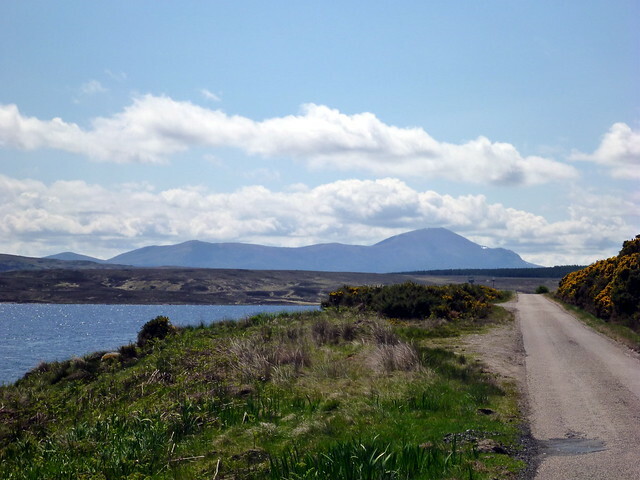 We’d walked not much more than 2 miles from the ferry towards the isthmus between Lochs Harray and Stenness when a local lady stopped and offered us a lift. 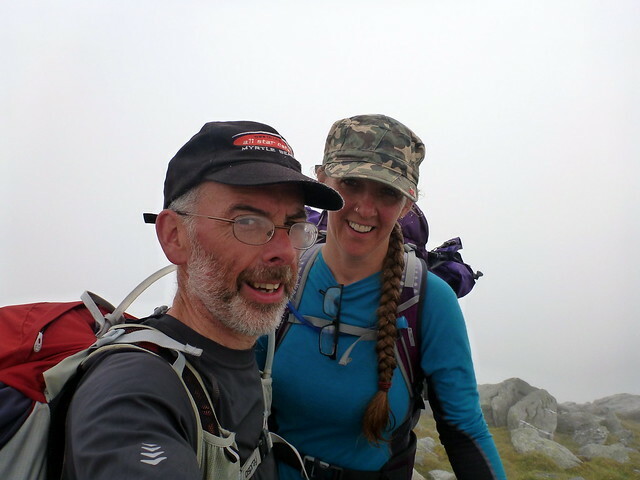 We hadn’t been hitching and were walking fast, so I was rather surprised, but grateful, as it was after 9pm by this point and we were both hungry. 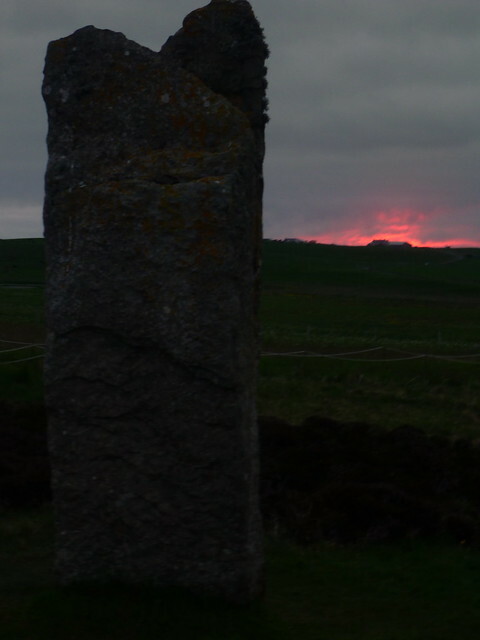 I had planned to enjoy the walk from Stenness up to Brodgar – a landscape of almost unimaginable (pre-)historic significance, but instead we were delivered there by an infernal combustion engine. 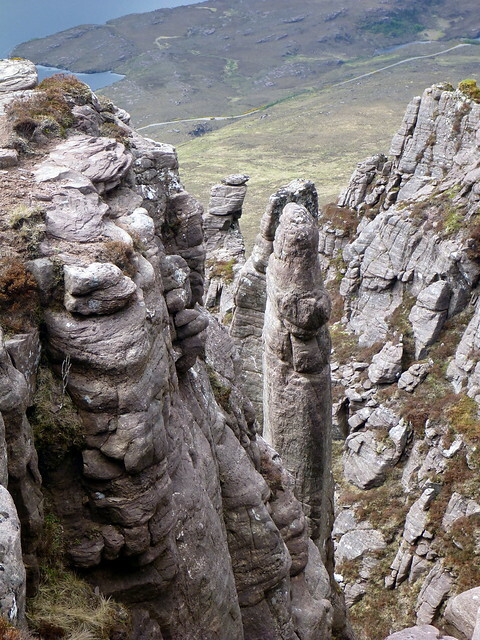 Ach well, gave us more time to enjoy the stones. We pitched discretely behind one of the raised mounds at the southern end of the ring, pretty much out of view from any visitors walking round the circle. I wasn’t sure of the rights to wild camp in such a space that was bioth ancient monument and an RSPB reserve, but I knew we’d leave no trace. 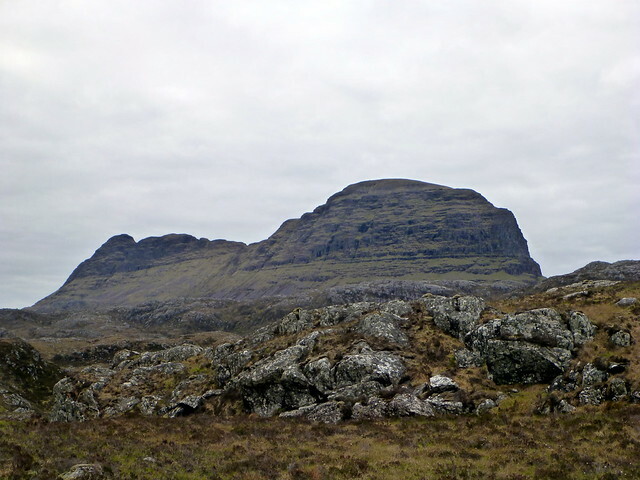 After a meal of noodles and a glass of wine we went along to walk round the stones – huge slabs of grey rock rising out of the heather. 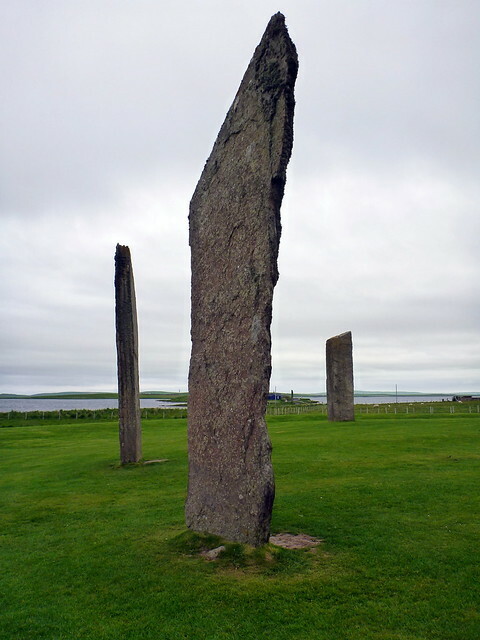 I once spent a week living in a rented cottage on the other side of Stenness and would come down to the stones early in the morning and late at night, so I know their individual shapes well. 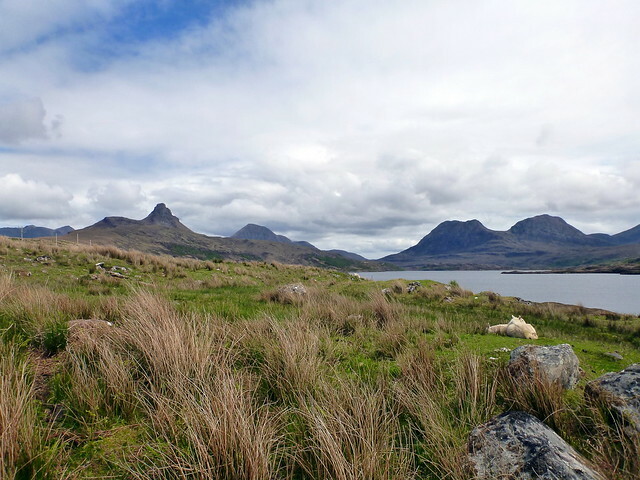 Having sated our appetites for the wonders of Neolithic times we headed back to the tent for a wonderfully restful night, with the calls of the curlews and lapwings and the lapping of the gentle waves from Loch Harray being the only sounds. 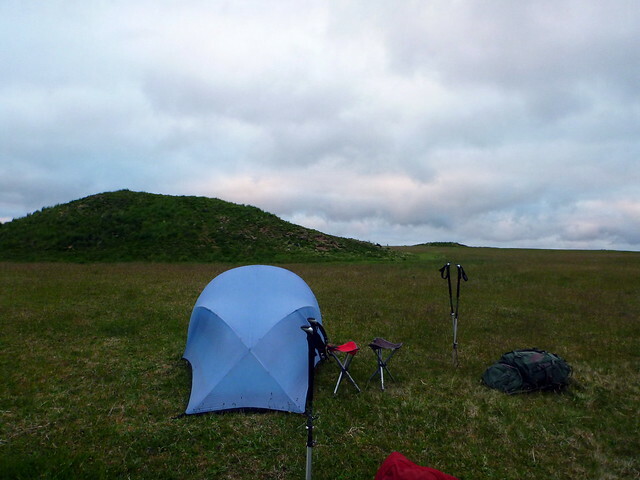 We’d agreed to make an early start and head down to Stones of Stenness, then Cuween Cairn - a place of considerable personal significance for me – so we decided to leave the tent pitched and the rucksacks inside it and head off unloaded. 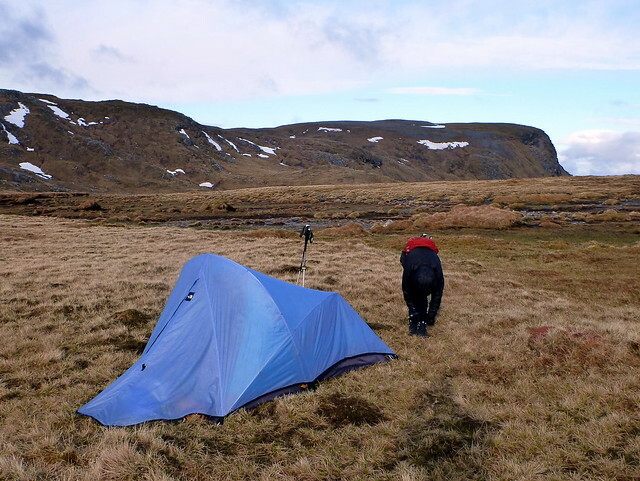 This proved to be a sensible idea, although I was left with a niggling anxiety about whether the tent or our belongings would still be there on our return. 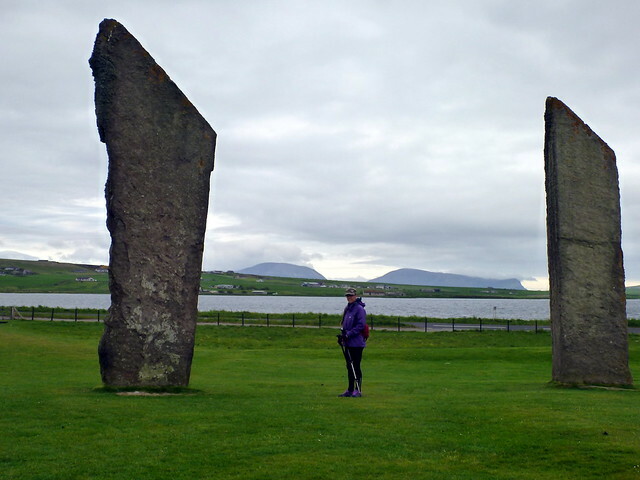 The Stones of Stenness, although fewer in number than Brodgar, are even more impressively tall and shapely. 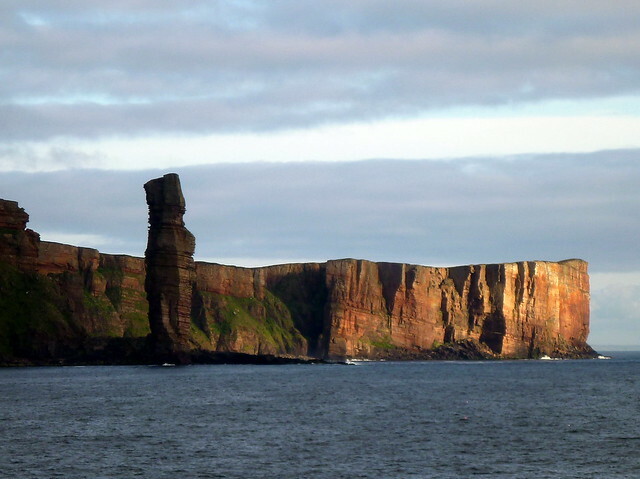 There’s a newly constructed walkway that takes you from Brodgar along the side of the Loch towards Stenness – much better than dodging traffic down the side of the narrow road. 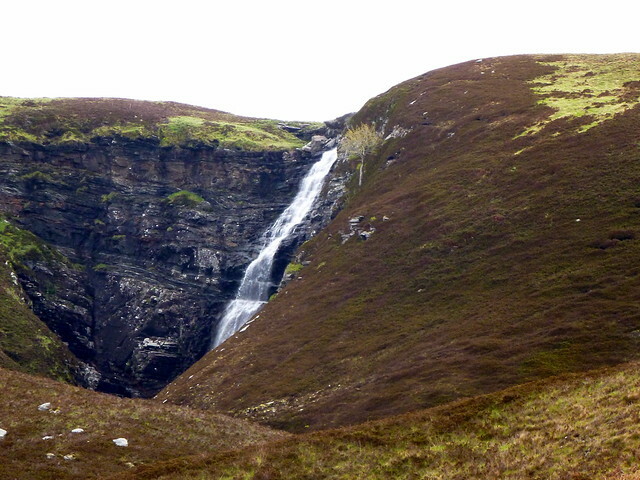 After Stenness we headed off at a brisk pace for Finstown, a distance of 5 miles or so, passing the strange “grounded flying saucer” shape of Maes Howe. 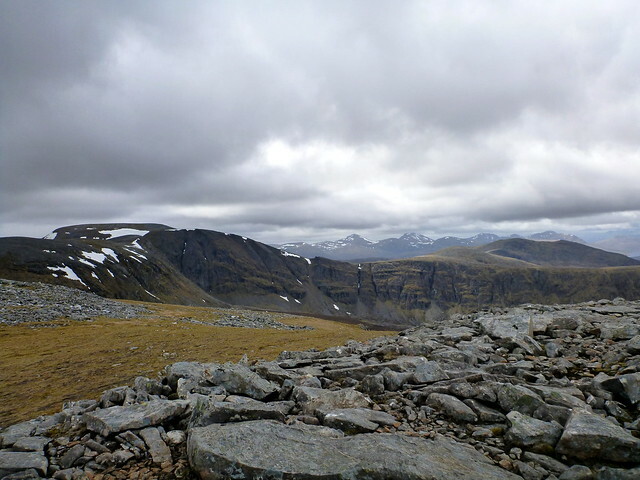 It’s not the most pleasant walk along the side of the busy road, but we made good time and got up to Cuween Cairn just before 8am. 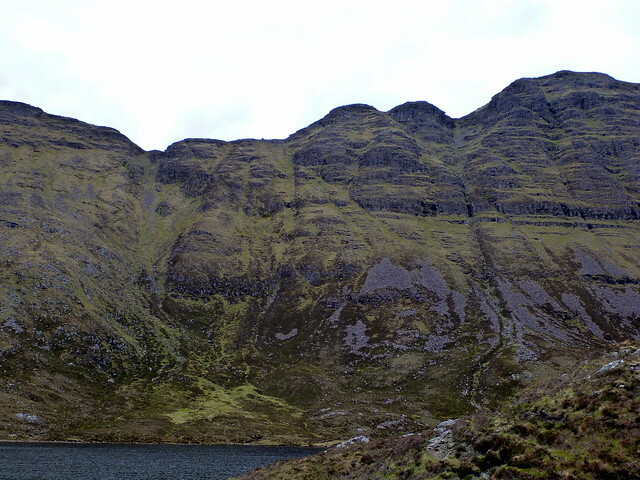 As we tracked up the hillside I was annoyed to see a car drive up to the parking space – I’d wanted the place to ourselves – great timing! Donning headtorches we made the narrow 8m crawl into the chambered cairn – surely one of the finest examples around these parts and enjoyed an exploration of each of the 5 inner chambers, Allison coping with her claustrophobia remarkably well. I’d once spent the night in this place, so it holds very particular memories for me. Emerging into the sunlight we met the young English couple from the car – I suggested they might like to take the torch from the box outside if they wanted to see anything inside. 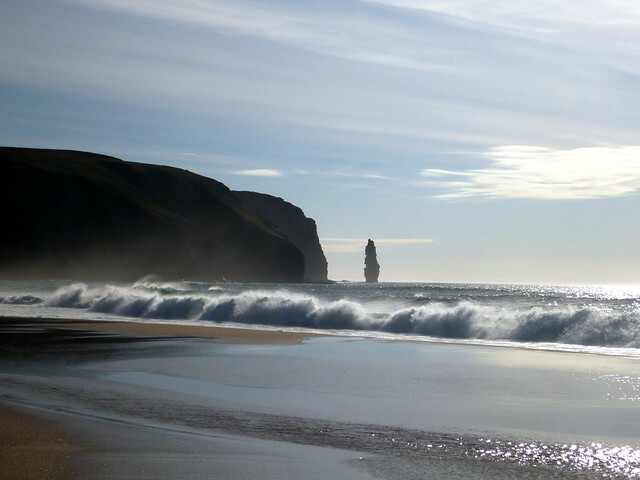 Originally I’d planned to return to the tent after this, but I thought we should just continue on to Kirkwall and get the bus back to Stenness – it was only another 5 miles after all. 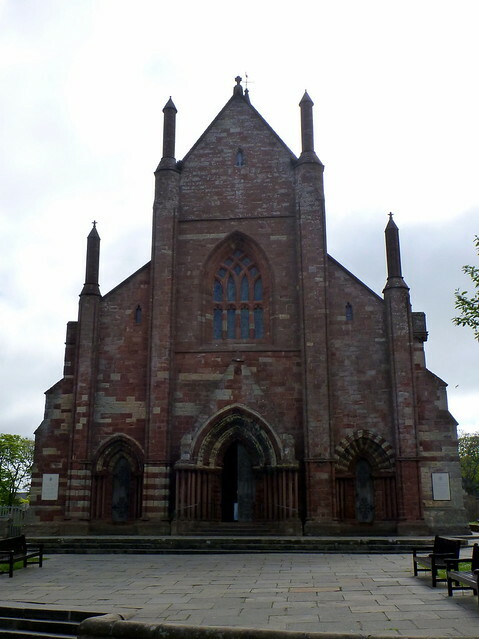 So we wended our way around the south of Wideford Hill into Kirkwall itself. It’s about 10.30 by this time and we’re both starving! Vexed to find the very good Kirkwall Museum closed for refurb, we wandered into the Real Food café in Judith Glue’s and enjoyed the first real feast for days! That felt real good. Stuffed and comfortable we wandered around the streets for a bit then went into the impressive cathedral before heading to the bus station and returning to Maes Howe. 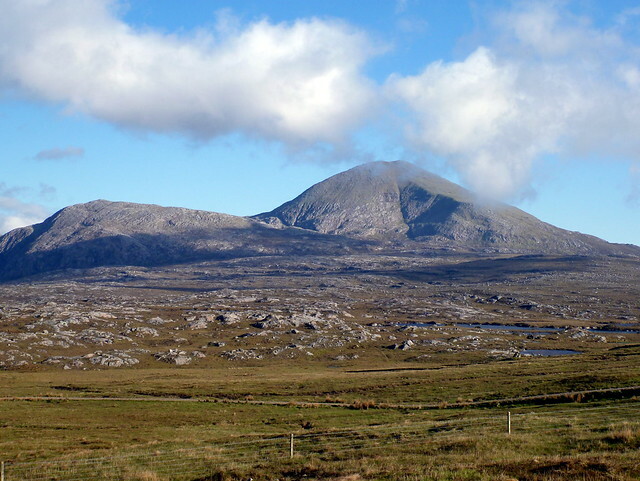 As I’d seen it a couple of times before and was now getting worried about leaving the tent all this time, I suggested that Allison wait for the next tour of Maes Howe and I’d head back and break camp. 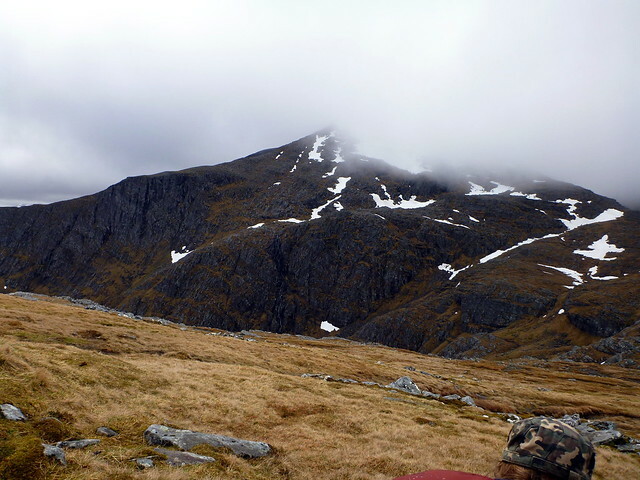 The tent was just as we’d left it and I packed up with a sense of relief. I sat watching the waters of the loch and wondering at the stupidity of two lots of folk who had their dogs off the lead chasing the curlews. 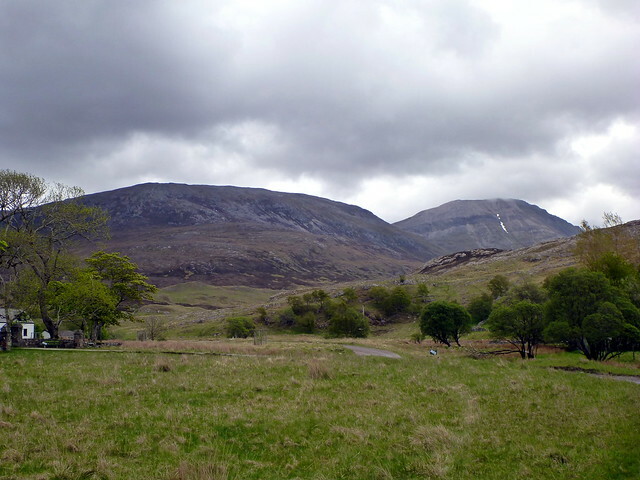 In an RSPB reserve. I was almost moved to go and remonstrate with them, but as I still felt uncertain about the propriety of having camped on the site I kept my protest to a couple of shakes of the head. 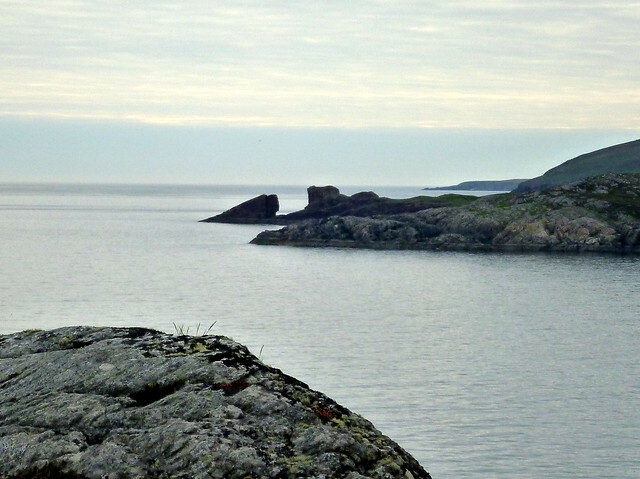 We’d planned to walk to Skail Bay where we’d camp and see a bit of Skara Brae. 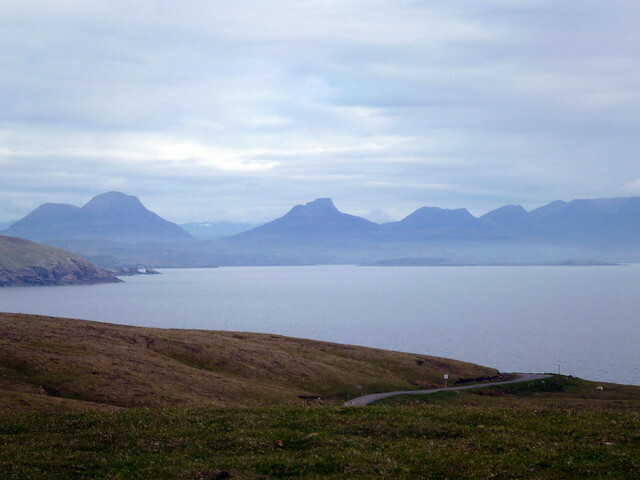 That meant 8km there today and 15km fully laden back to Stromness for the ferry in the morning. I was looking idly at the timetable when I noticed that the ferry time for Saturday was 9, not 11am as I’d originally misread. That would mean having to be away before 5am if we were to get the boat, as the booking office shuts 30 mins before departure. 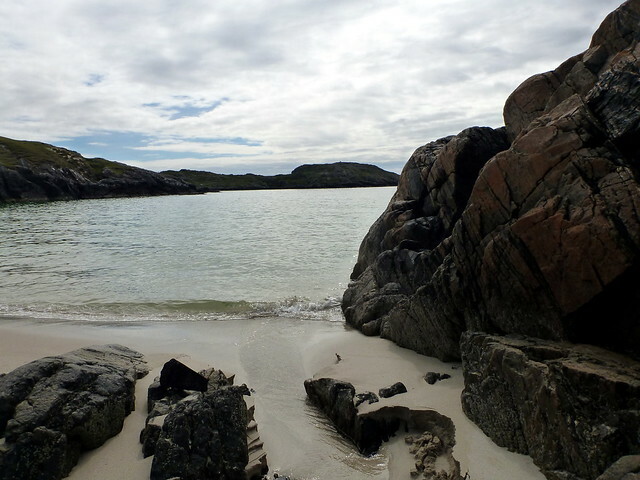 Added to which, the weather was looking decidedly chilly and unsettled –maybe it would be best to try and get the boat back this afternoon instead. We just had time to get to the bus stop at Stenness for the 3.55 bus that would get us to Stromness in time to get on the 4.45 ferry. Except the expected bus didn’t appear. Closer inspection of the timetable revealed the legend “NS” which meant that the bus only came at this time on a “Non-School” midweek day. WTF??? 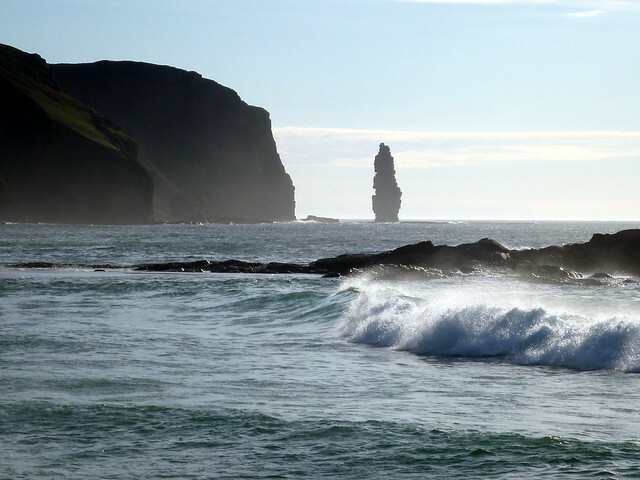 By the time the next bus came and deposited us in Stromness it was 4.35 and we had no hope of getting onto the boat – we could see the cargo doors raising as we walked past. Damn! 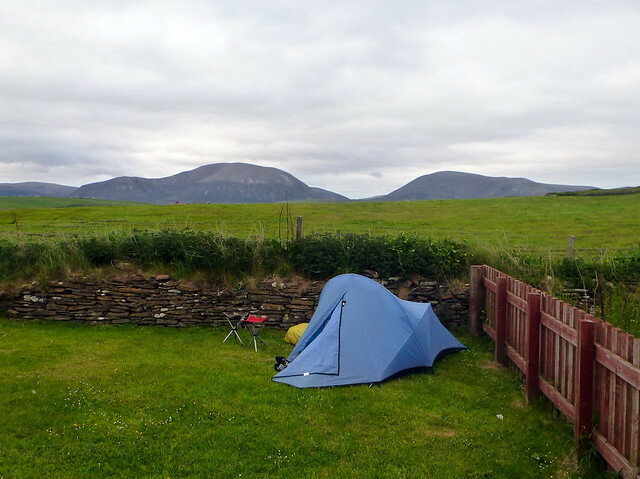 Ok next option was to find a place to camp near enough the ferry terminal to make it in the morning – fortunately there’s a campsite at the end of the harbour in Stromness – not the prettiest or best equipped site, but convenient for our needs. 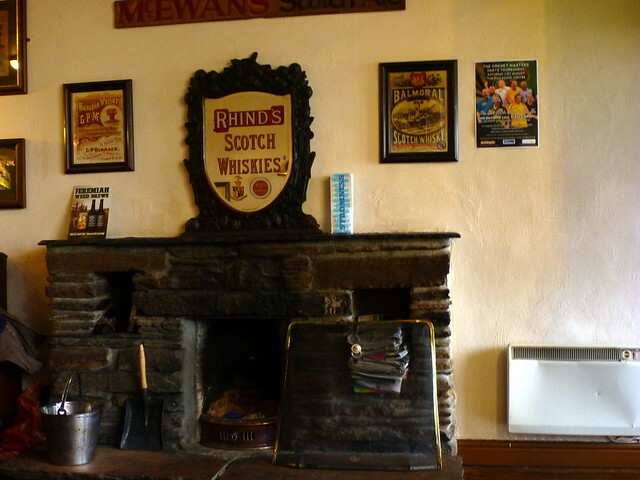 After another tent meal we made it along to the Stromness Hotel for a pint or two. Now I’ve drank in some strange haunts in my time, but this must be one of the strangest, at least as far as its inhabitants go. After the bizarre experience of watching a Scotland football team win a match on the big screen, we were entertained by a succession of peculiar punters, particularly one ex-South African SAS diver who regaled us with tall tales from his mercenary days in Rhodesia. Quite a night! Back over on the mainland by 10.45 we filled up on fuel in Thurso before heading along to Tongue and getting started on Klibreck. 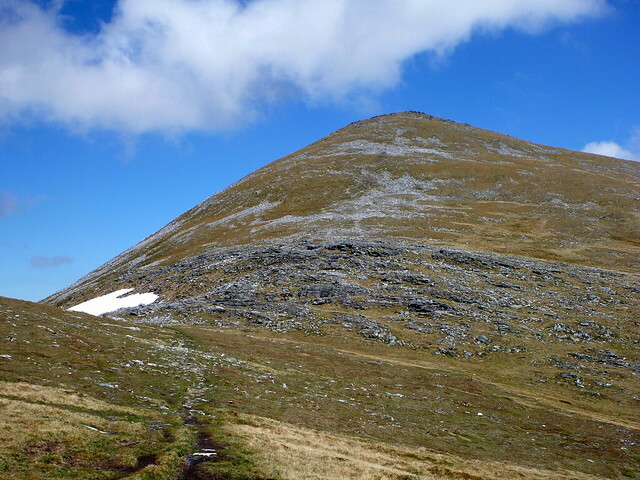 I’d drawn up a route that would see us walk the whole ridge of Klibreck from the Crask Inn, then descend, camp overnight and head back the 15km along the valley in the morning. 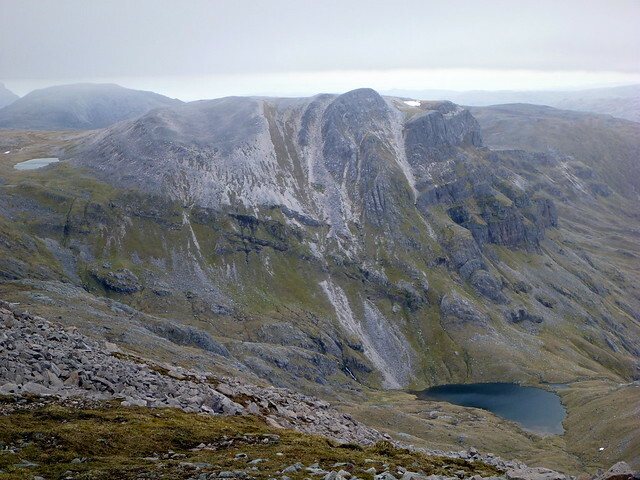 Two problems with this- itmeant walking with full packs for 2 days and secondly we could just go the quick route up and get another Munro in somewhere on the road back home on Sunday. No competition then! 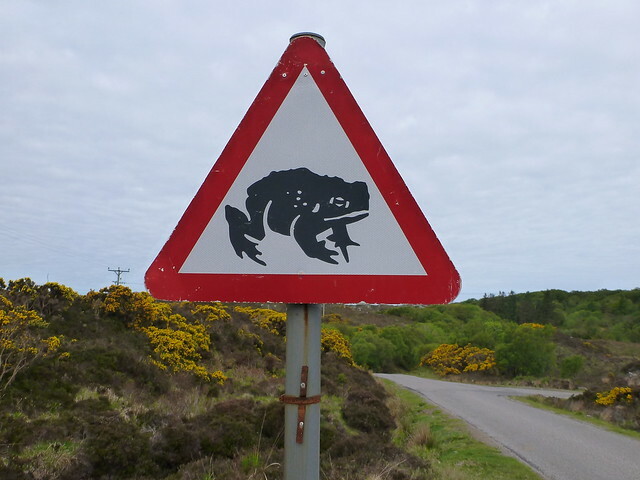 I’d eyed up Am Faochagach as a suitable candidate, so we aimed to park at the Vagastie bridge. 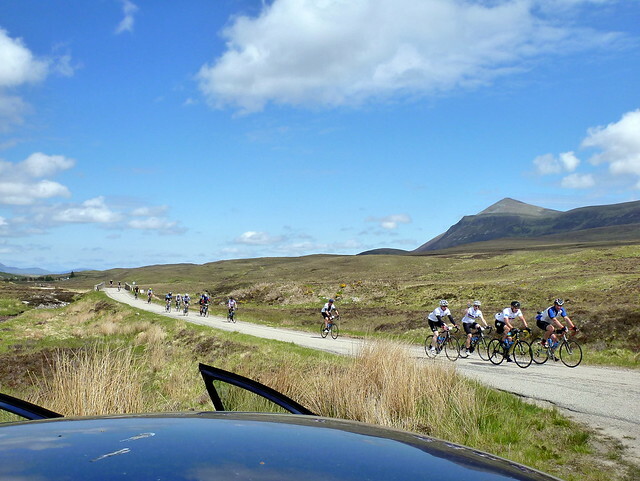 Before that however, we had to get there and our progress was delayed by the “Round Britain” cycle event – 700 cyclists going from John O’Groats all the way down our route. 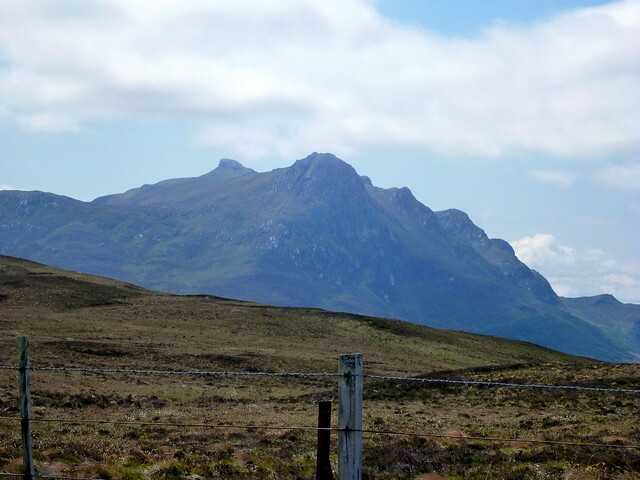 Now passing cyclists on a two way road is one thing, but on narrow single track quite another and I resigned myself to slow driving and enjoying the scenery – especially the delights of the many peaked Ben Loyal as we drove from Tongue towards Altnaharra. 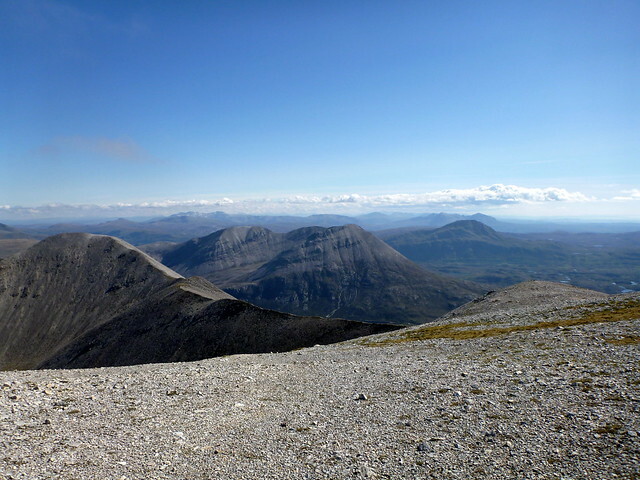 Eventually we made the parking spot just after 1pm and had a hasty lunch before setting up the steepish slopes of Cnoc Sgriodain. 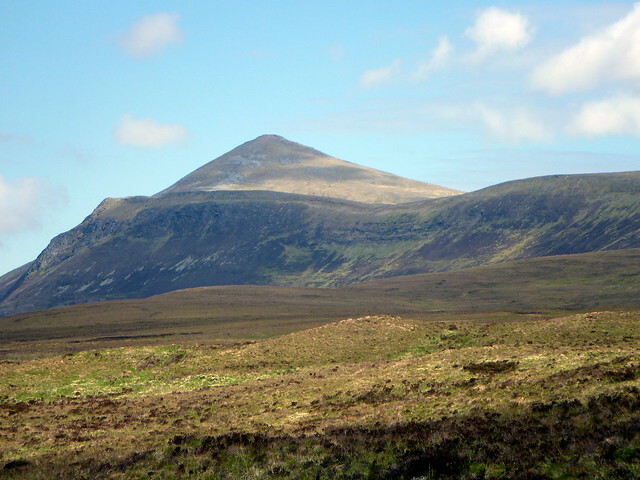 The pyramidal peak of Klibreck rose in the distance and we headed across relatively dry bogs, contouring round the side of Carn an Fheidh and reaching the stony base of Meall nan Col. Last time I’d been here I’d found a “book” of mica crystal which still sits on my mantelpiece, and I looked in vain for another. However, there were lots of sparkles from the mica in the rocks. 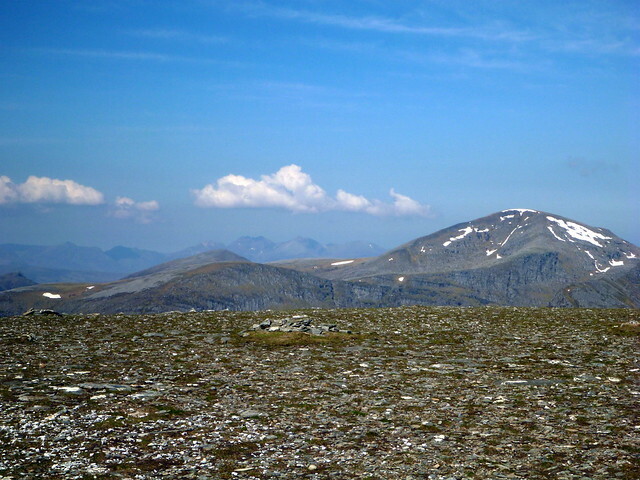 We met a few folk coming down from the summit and a couple sitting at the top enjoying the view over the vast empty spaces around this mountain. 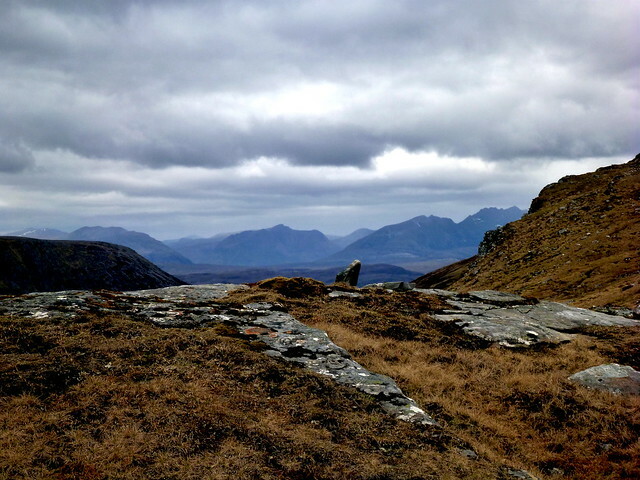 We looked up towards Loyal, Foinaven and Hope, seeing no signs of man on the horizon. 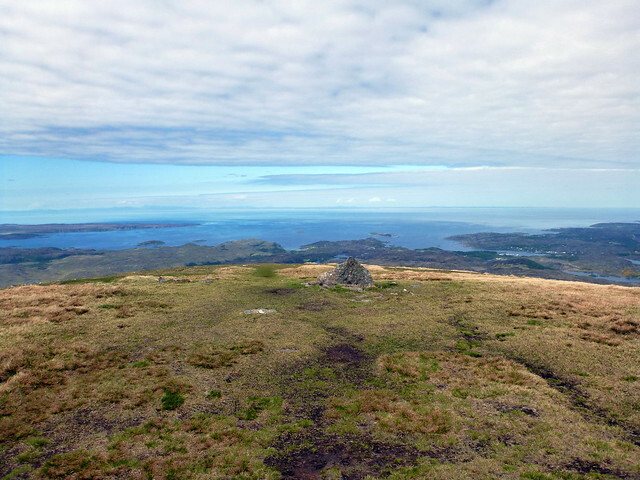 We did find a knobbly stick with nails in it that looked uncomfortably like a cudgel at the top, and coupled with the smashed trig point this seems to be a mountain of some violence. But not today – all was sunny and mellow. 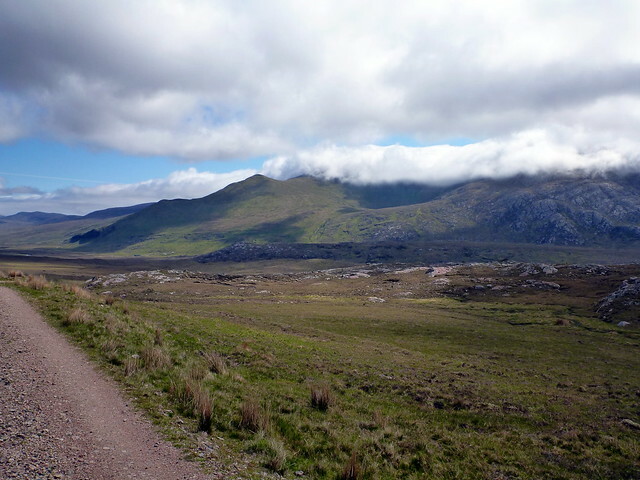 We tracked back more or less the way we’d come, choosing to head straight down from the bealach before Cnoc Sgriodan rather than re-ascend it. Back at the car we pulled in for a lovely pint of Black Isle Organic Blonde and a chat with the owner’s brother who was up fishing for the week. 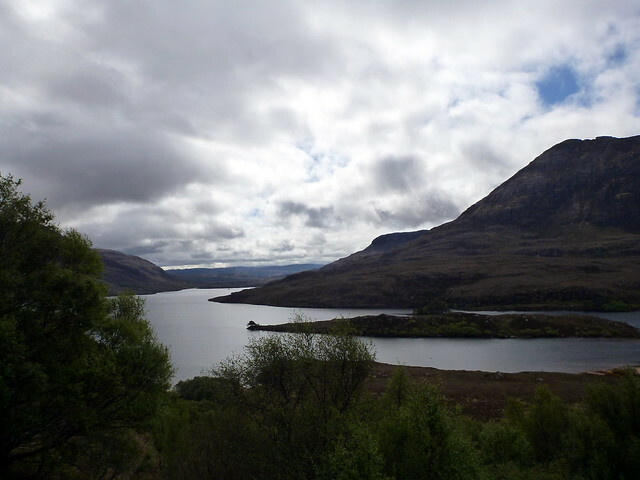 Next we drove down to Lairg and along the road back to Ledmore Junction. 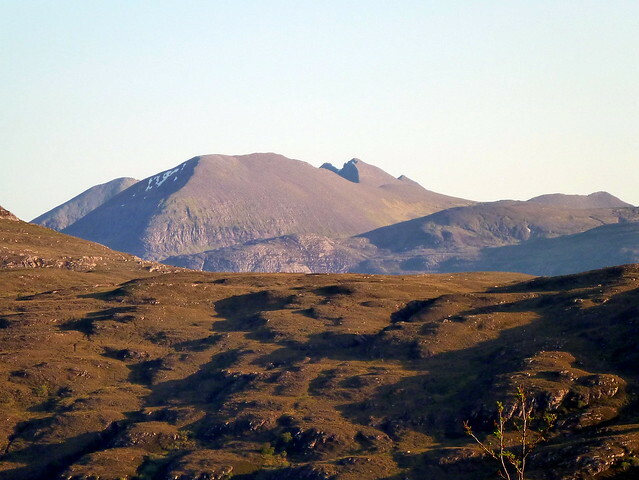 The evening was perfect and the mountains resplendent in their summer colours. 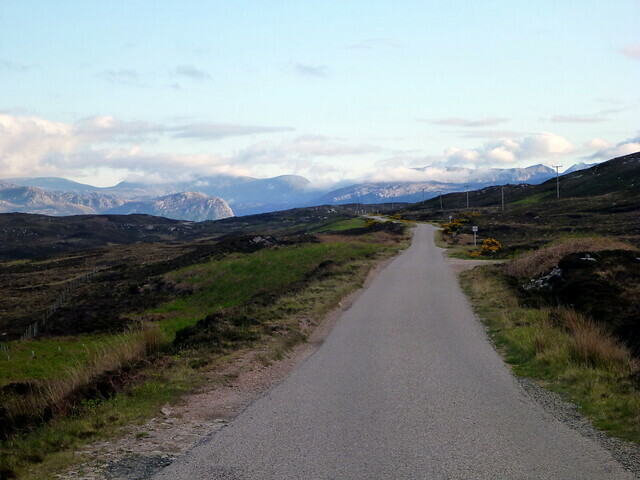 It’s unfair to have such scenery when one has to watch the road closely. It took considerable effort to turn left – south – at Ledmore rather than right – north – again, especially as the forecast suggested several more days of beautiful weather ahead. Anyway, we had one more day, one more hill before our trip was over. 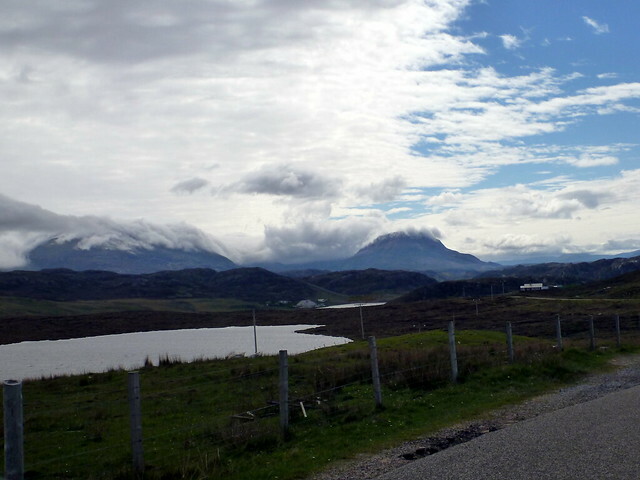 We drove to Ullapool, stopping every now and then to snap this or that hill. 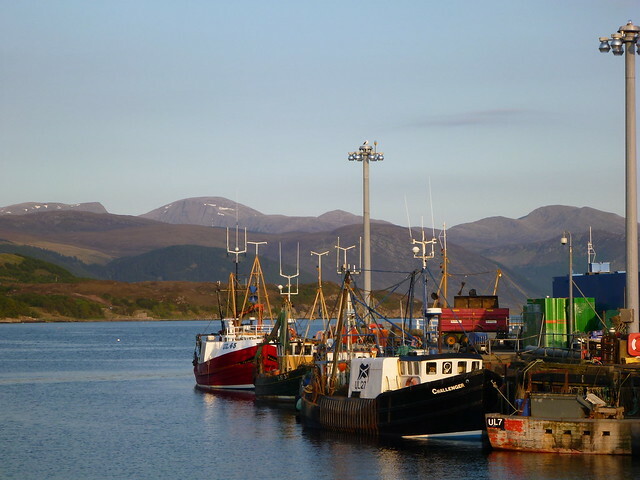 Had a fantastic fish supper sitting on the front at Ullapool then drove back down to the parking space at Torrandhu bridge. 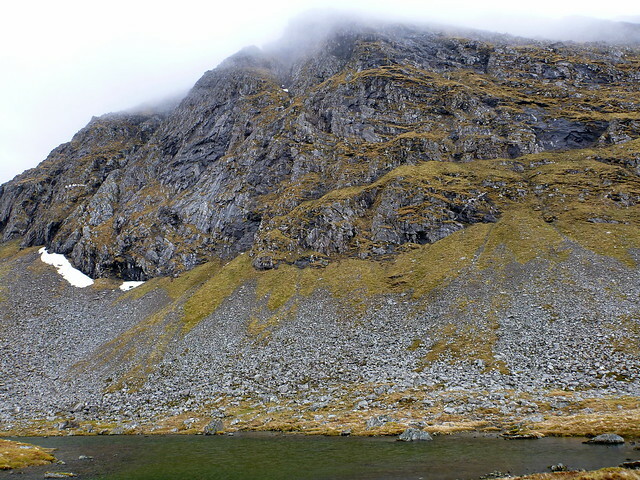 A climber with a caravan who’d been doing the Fannichs was also encamped there and we swapped a few stories before going down to camp near the water. This isn’t a great site as rocks under the grass make pitching difficult, but it was a still night so we didn’t get blown away. 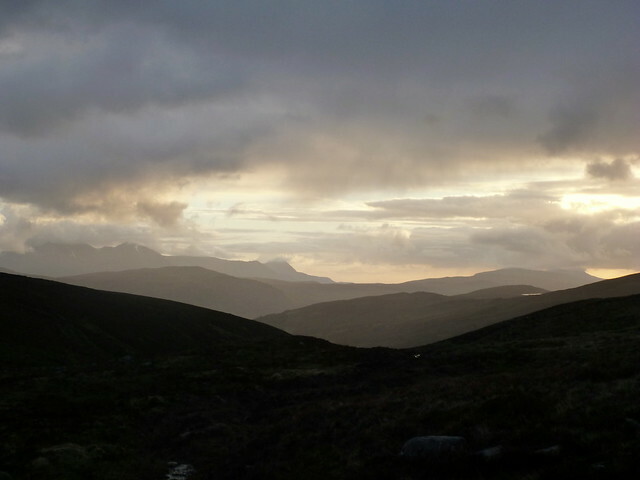 Did enjoy a great sunset over An Teallach and promise of another fine day tomorrow. We woke early intending to set off by 7 and have a quieter drive down home, but mist covering everything down to 100m made us delay a bit. 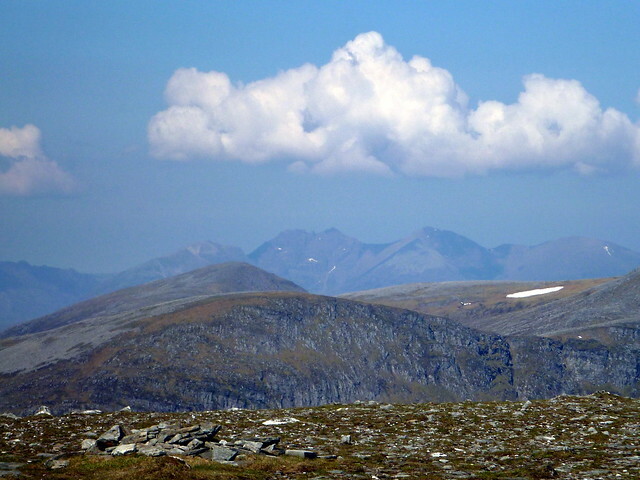 Ach well, another Hope day of no views seemed in store. 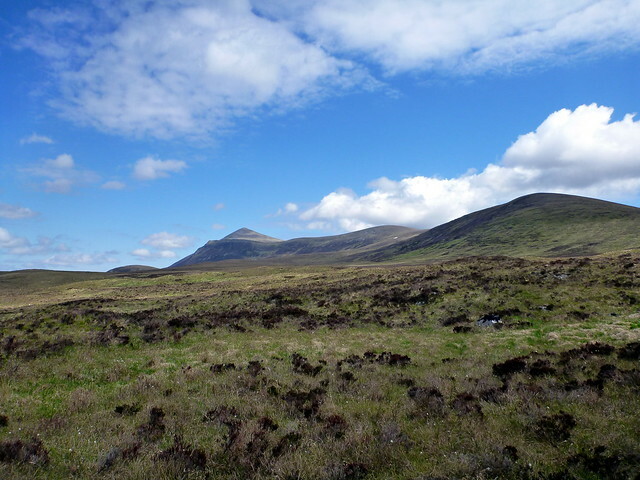 We were apprehensive about the river crossing over Abhainn a Ghabrainn, but this was easy enough with the water level being lowish and the fabled swamps of peat around the hill were likewise tamed by the recent dry weather. 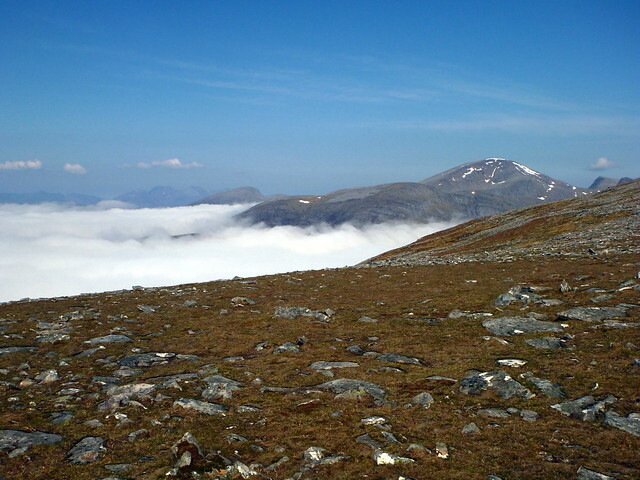 As we ascended the slopes of Drochaid a Ghlas Tuill we broke through the cloud, catching a glimpse of the top of Beinn Dearg poking out firstly, then the tops of the Fannich hills in a cloud sea. Fantastic! 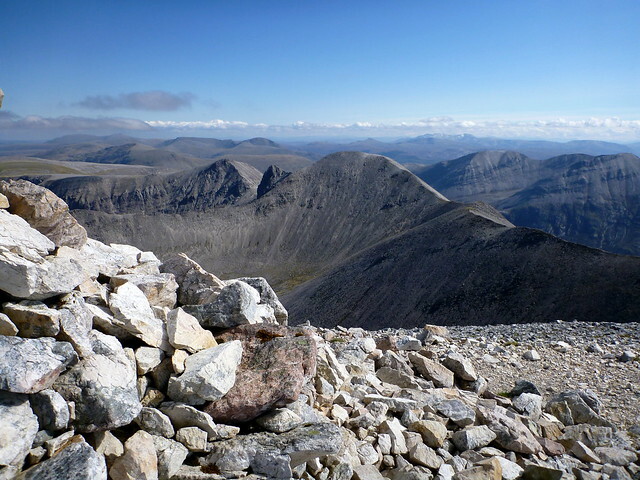 The walk up the rounded back of Am Faochagach was gentle and comforting and we snacked at the top enjoying great views of the Beinn Dearg group where we’d started off our adventure. A shower was welcome to wash 9 days dirt away then a good curry to replenish the energies. 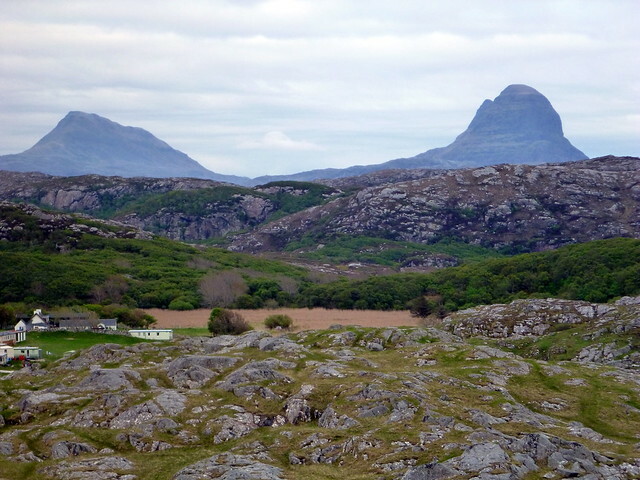 I was so glad and grateful that we’d got good weather on the trip – partly because the views and scenery were meant to be enjoyed at their best and partly cos 9 wet days in a tent might have been somewhat soul sapping. 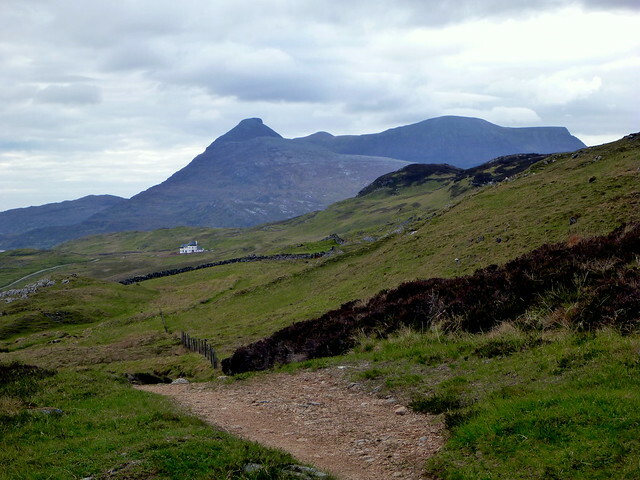 I was surprised that I had managed to cope with the demands of walking every day, with only a bit of a niggle in my left ankle on steep descents to complain of. 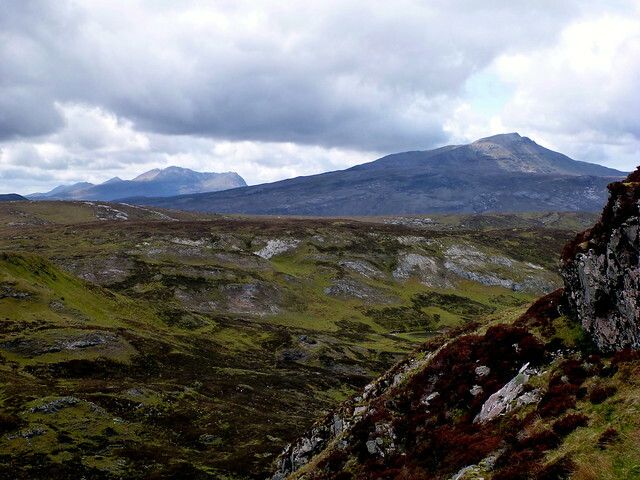 I could easily have continued for another week, with all the unclimbed hills of Sutherland still calling out to me. 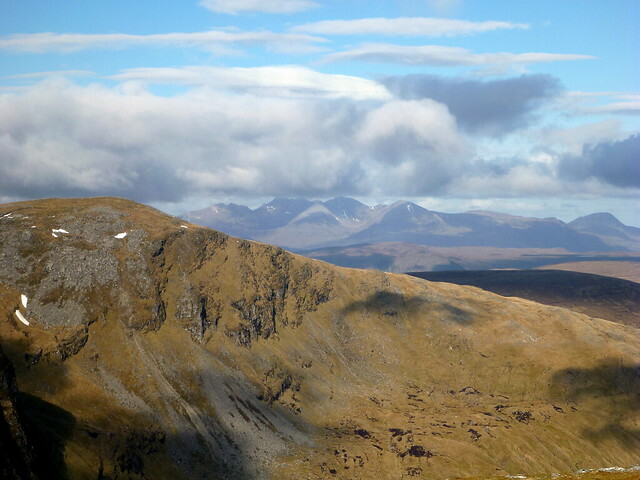 I was also pleased that we'd managed to achieve all the targets from our objective list without great problem and had even exceeded the original Munro count by 2. 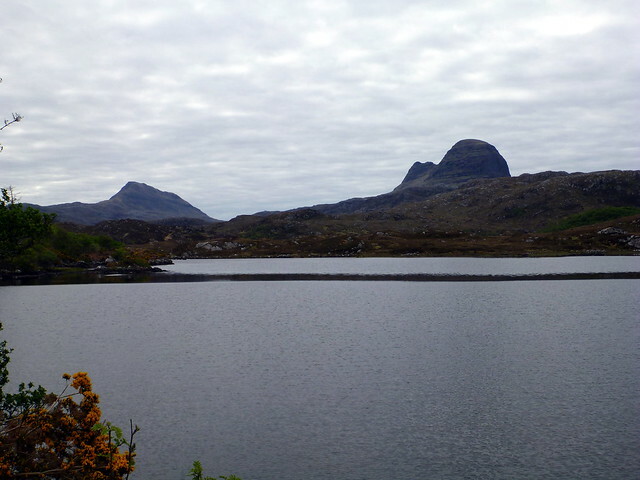 And Sutherland can be so lovely - Oh I’ll be back! Last edited by weaselmaster on Wed Jun 12, 2013 10:51 pm, edited 1 time in total. OMG that was a bit of a read, but well worth it. Looks like you had the best time ever, and those photos are great. 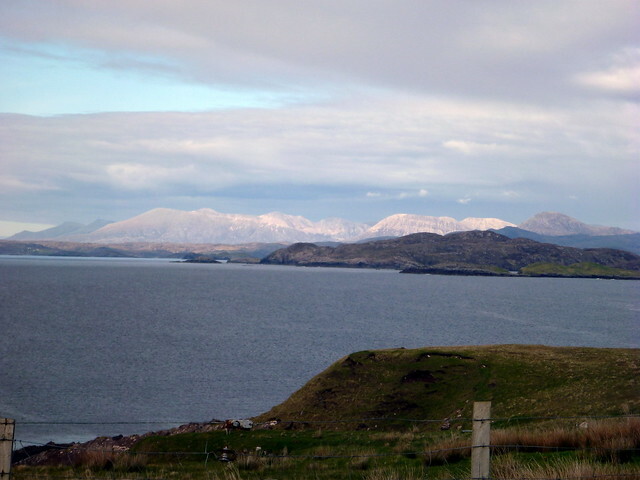 You were indeed blessed with great weather, I can't imagine how you'd have done in 'typical' Scottish weather. Heaven indeed - I'm very jealous. A lot of those places are on my to-do list and your report makes me even more impatient to explore them. And lucky with the weather too! 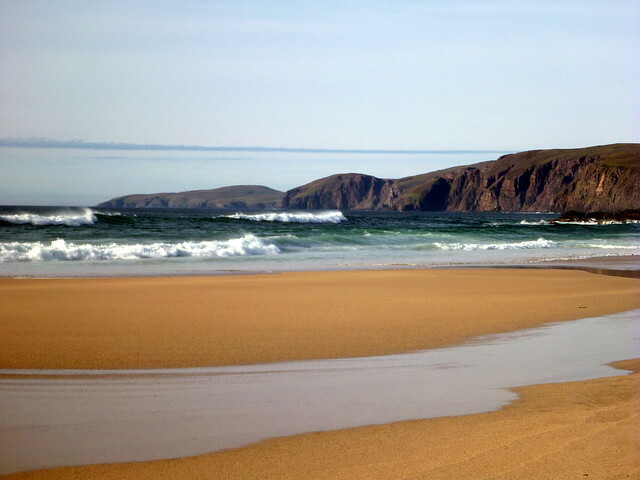 I only set foot on Sandwood Bay for the first time 2 weeks ago and like you was at first not impressed but we took to the south cliffs and the place opened up, by the end i felt it was a magical place. 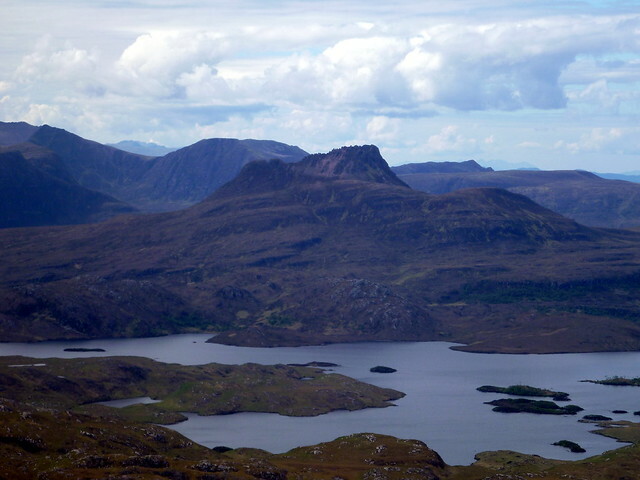 Sutherland and Assynt are my favourite areas and I will visit time and time again, like you. Thanks for taking the time for such an epic report. Congratulatations to you both on a fantastic read, great pictures and the weather looked pretty good too. Superb!!!! Pictures and story both. An epic & wonderful report,stunning pictures well written it ticks all the boxes. I have never been in this area I must get there soon. A great, detailed report........have you considered turning it in to a 'mini guide ?' 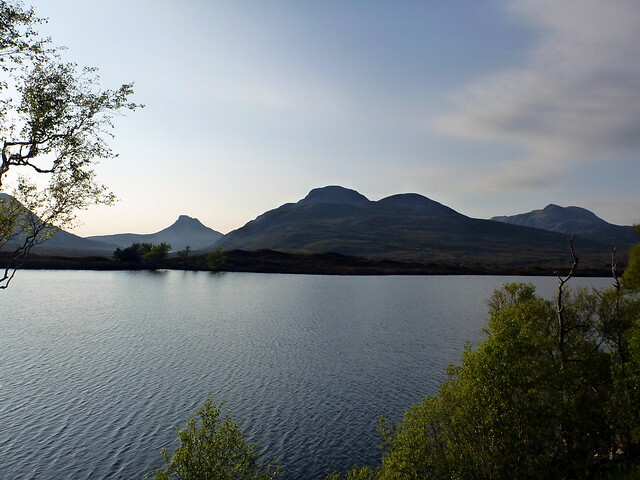 Pictures are brilliant as well, I don't know this part of Scotland yet but will get there one day and your report and pictures have definitely made my mind to get there sooner rather than later. I'll maybe try doing a report on the 'Greenock Cut', before trying something as sizeable this......maybe not get the same views though ! (Fellow Greenockian ). fantastic report, loved reading it, supremely jealous. as said above, please post when you write your book!